Nothing happens in a day... At times you just need to dive in. 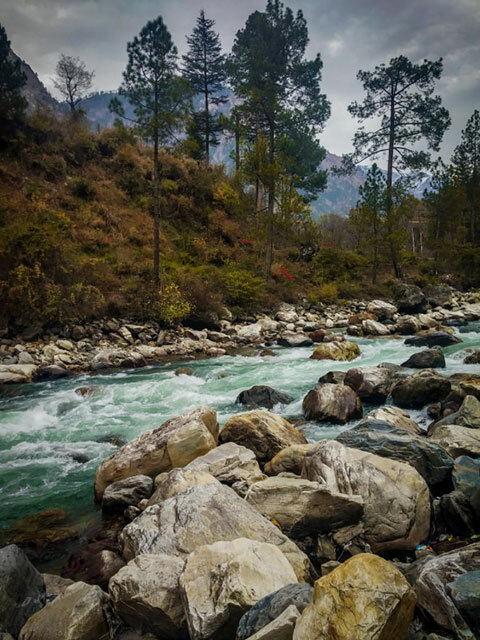 Bhutan... Here we come !!! 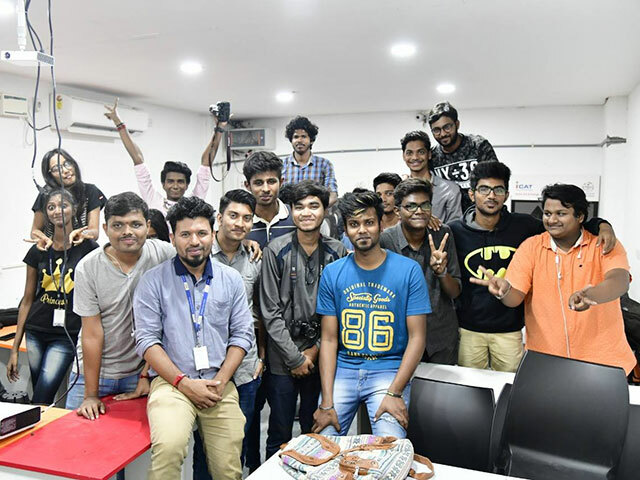 "Network or don't work" was the first thing Mr Manikandan shared with us in his 7 days of cinematography classes which were really inspiring and informative. 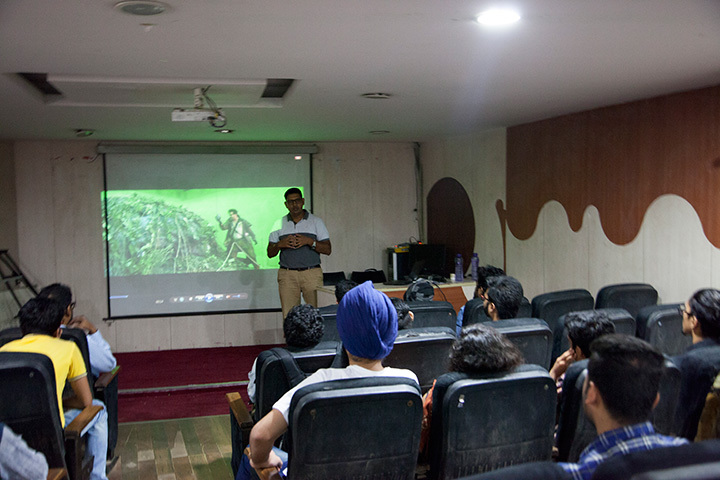 His class was not just about cinematography, for he shared his experience on what it takes to survive in the industry. It was one of the best experiences of learning something that would help my career! 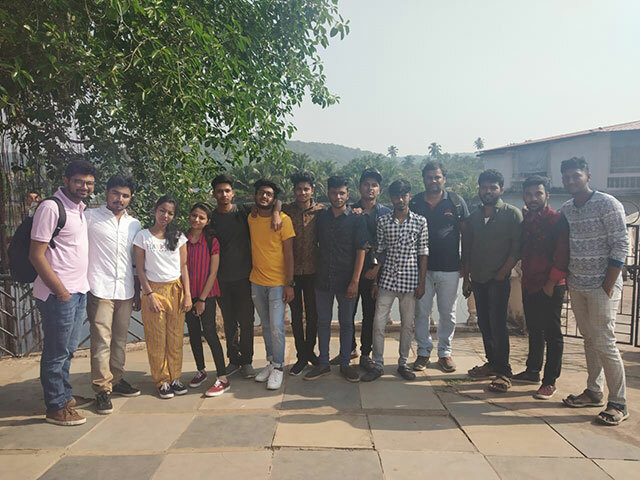 We, the students from fashion department has been taken to the industrial visit to Erode, Tirupur and Ooty on 28-02-29 to 02-03-19. 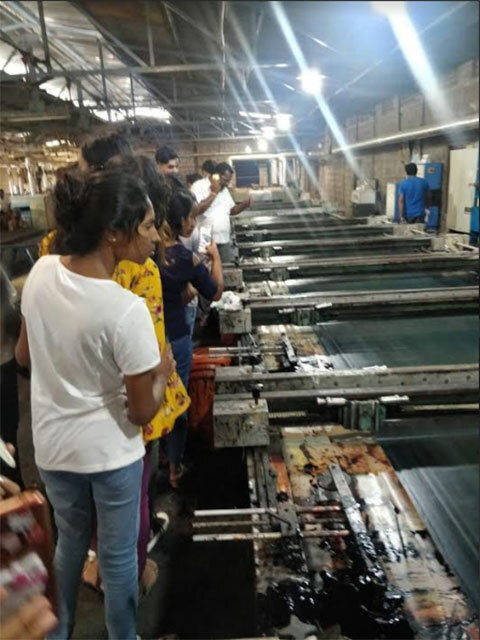 We visited Sivaprakasam Sarees at Erode where we learned about how the processes of dyeing, printing in cotton sarees are happening in industries. 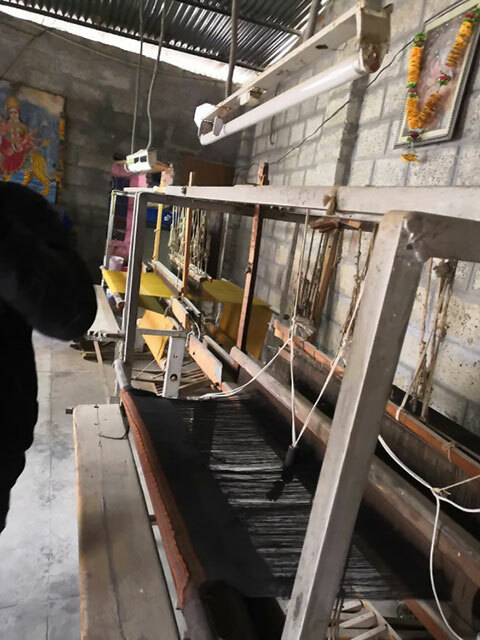 The next day we visited Tirupur to look upon 3 different knitting based factories. We got to know the entire processes of converting yarn to apparel. 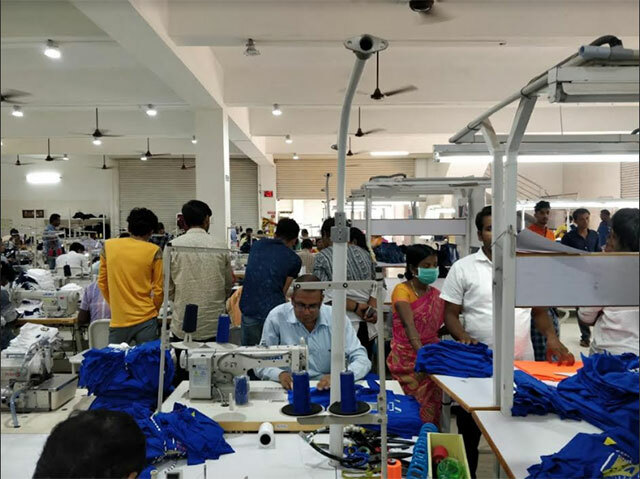 They have explained the each segment of the factory to know how the process works. We also learnt about wet processing and apparel mass production in other two factories. 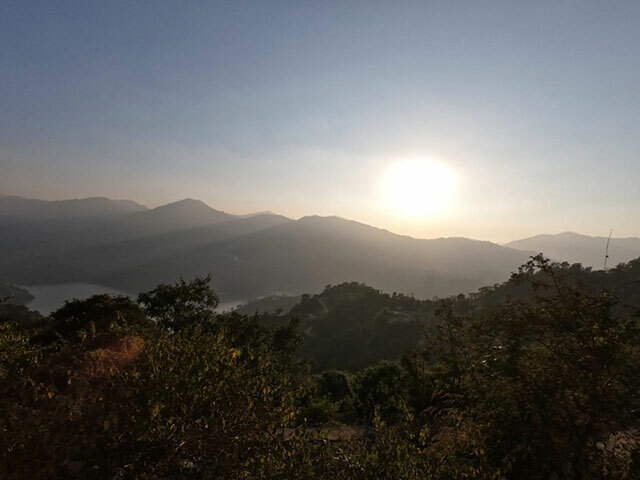 Finally we had a visit to Ooty as sightseeing place. It was very good to learn and enjoyed this trip. 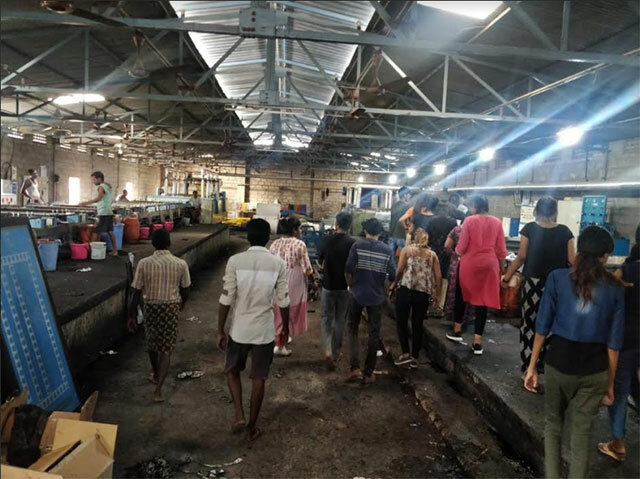 We were taken to an industrial visit to the places – Erode, Thiruppur and Ooty, from 28.02.2019 to 02. 03. 2019. 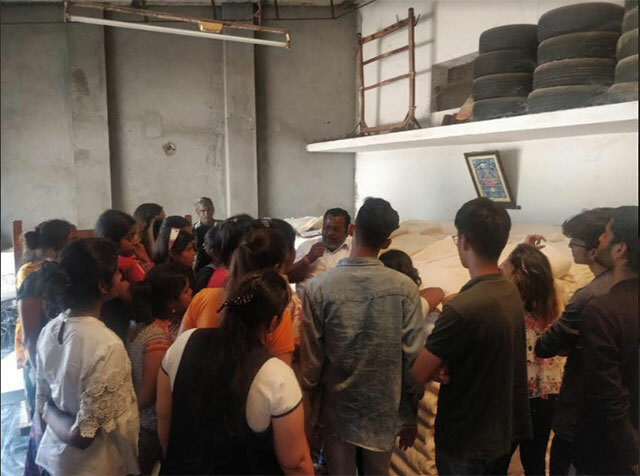 On the very first day, we visited Cotton saree industry which is known as ‘Sivaprakasam Sarees’. 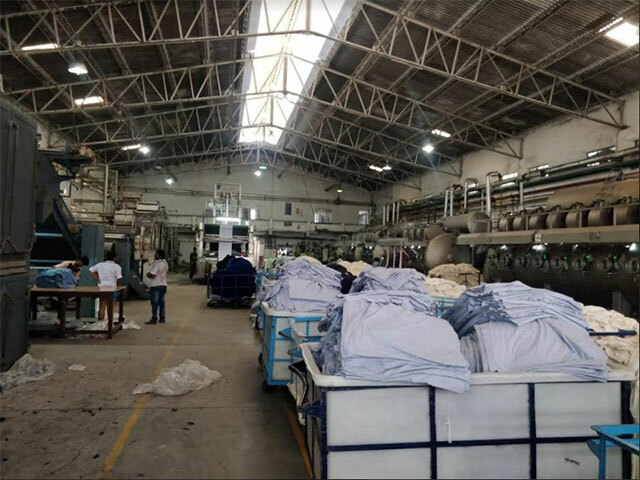 There, we came to know about the entire process of manufacturing the cotton sarees from different sections. 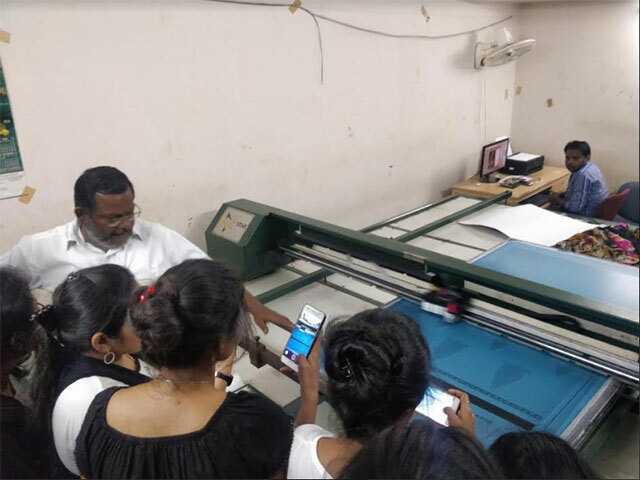 We also looked onto the process of screen printing on the saree. 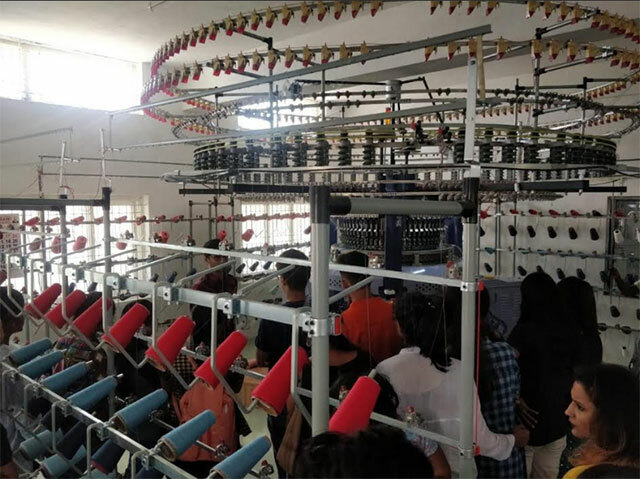 Then, on the second day, we went to three different factories which were based on knitwear in Thiruppur. We learned about Jacquard fabric. We saw the process of the conversion of yarn into fabric. We were taken to a colour lab where we saw various shades of colours and learned about the way the fabric have been coloured. Then, we looked onto every other process such as washing, ironing, steaming, folding and many more. At last, we visited the stitching department. 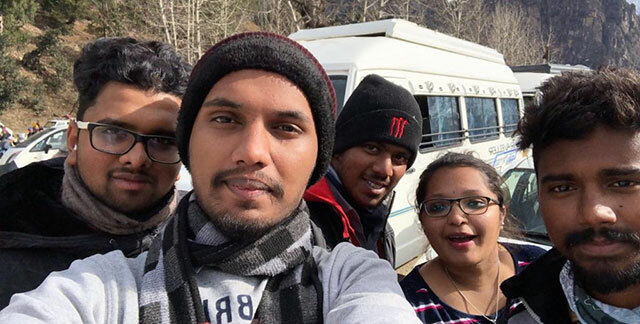 On the third day, we went to Ooty to visit a few places and purchase few things. This trip was very beneficial for us. 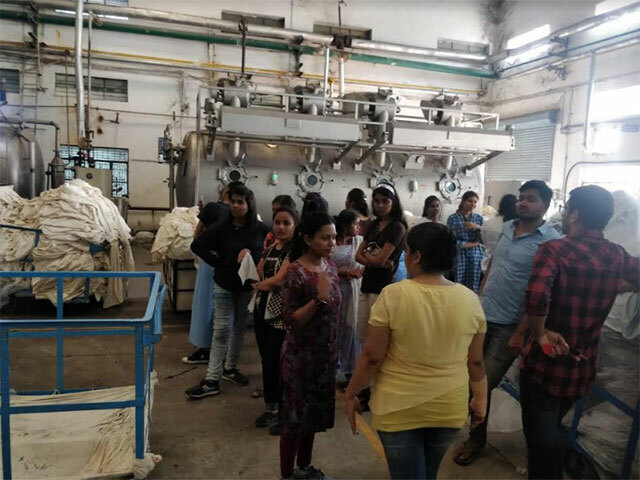 It helped us to gain a good knowledge about wet processes and apparel mass production. I’m keerthana from ICAT design media college, Chennai. We went for Industrial visit to Erode and Thirupur. 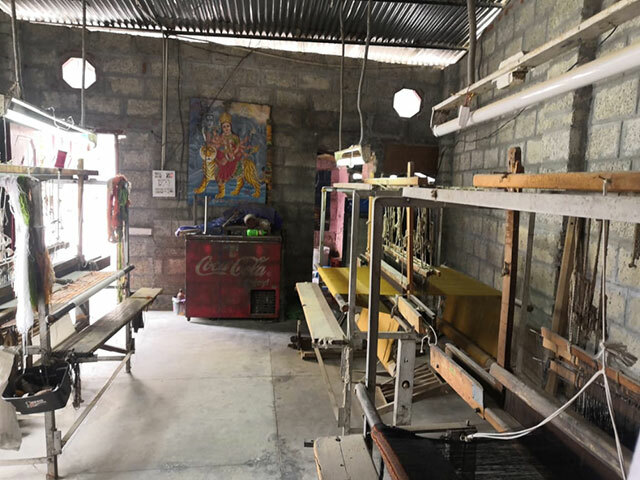 In erode we went to sivaprakash sarees in there they produce sarees which are pure cotton and screen printed. 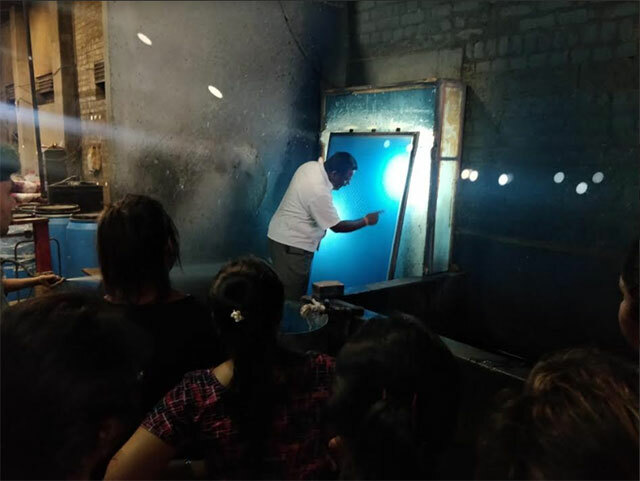 First design for screen is prepared ,then the dyes are prepared by mixing different color to attain the particular color. Then the fabrics are screen printed and are gone through different processes and will go for sales. Then we went to Thirupur for visiting different garment factories. 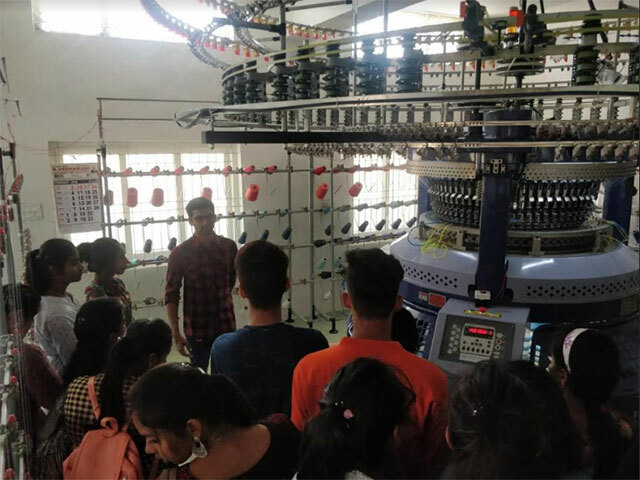 By visiting these factories we learnt how knitting industries and how production department works. 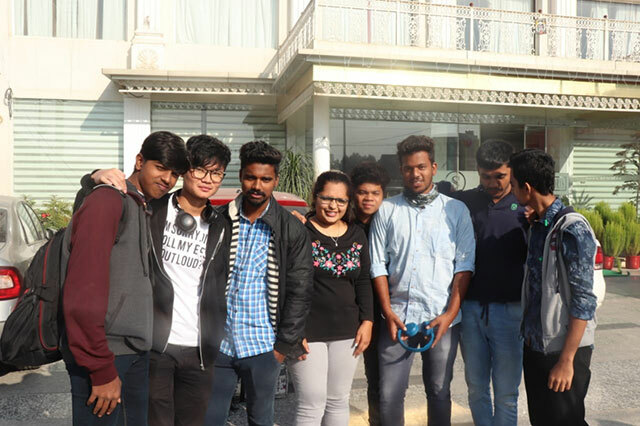 We thank our faculties and ICAT design and media college for this wonderful trip. 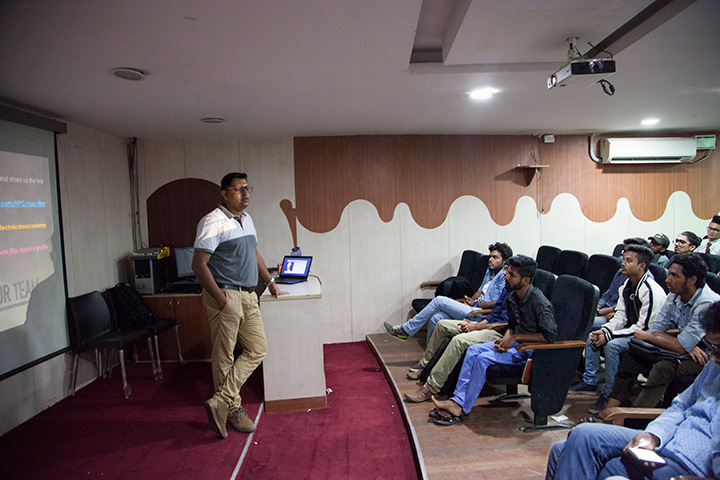 The session was conducted by Mr Abhisek Nanda and we were taken to the nearby metro station. The live sketching session was very useful, especially for level designing. 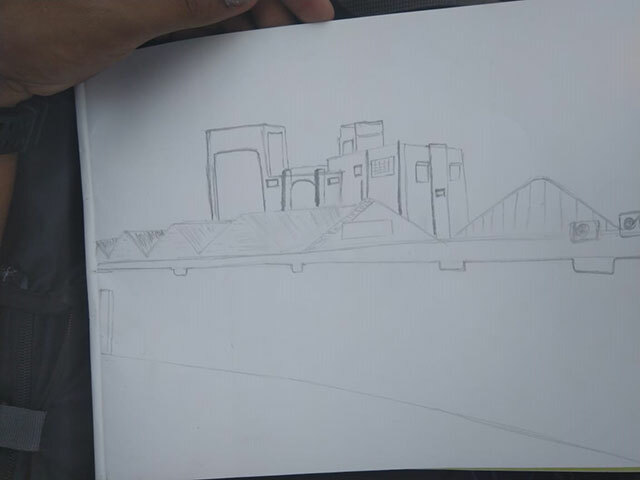 I sharpened my skills on 2 point perspective and really loved the experience of working outdoors. 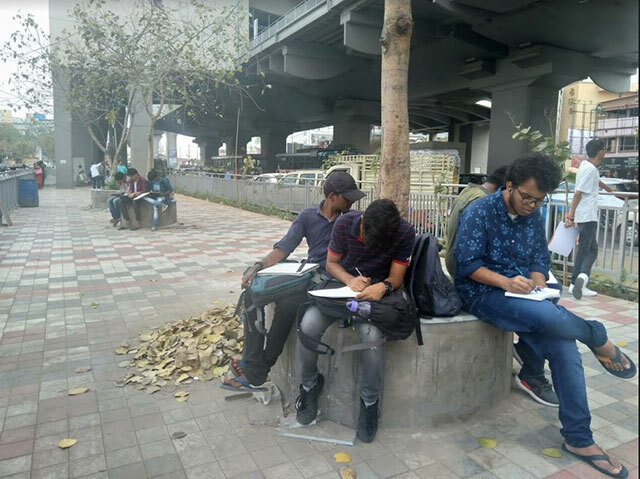 First Year students of the Interactive Media department had an outdoor ‘Live Observation’ class on the 2nd of March 2019 to understand the environment asset. 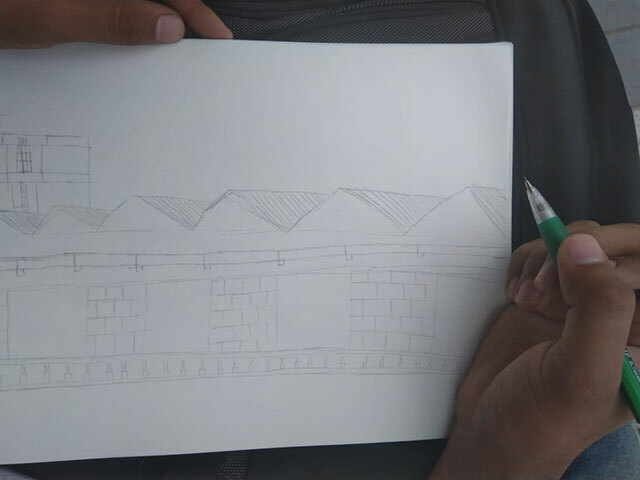 They studied perspective and proportion by analyzing the architecture of surrounding buildings and sketched in real-time. 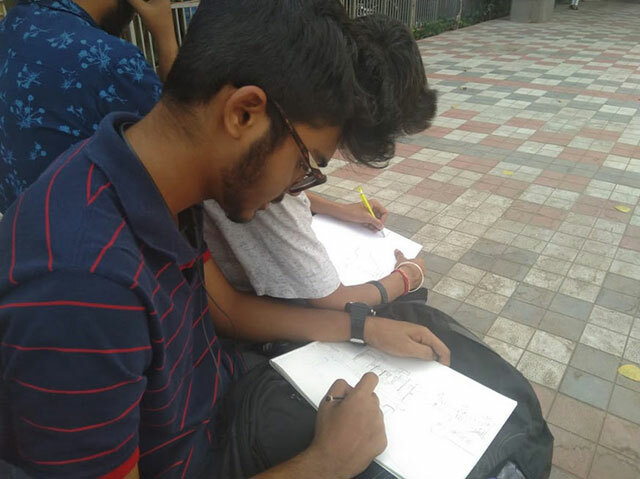 The kept their focus despite working in the middle of a crowded area and learnt a valuable lesson on managing their time. Travelling is always a source of joy and education, especially when one is going out with friends. 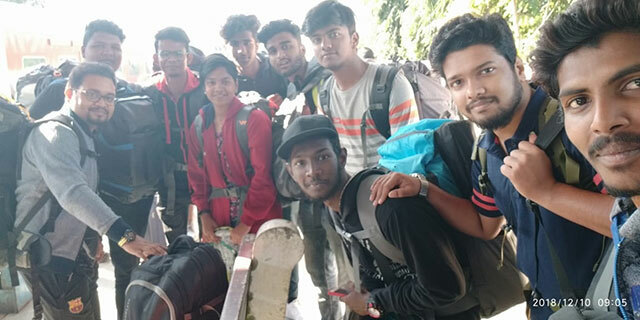 We as a class went to Pondicherry as a part of our DTCP (Digital Technology and Creative Thinking) module. 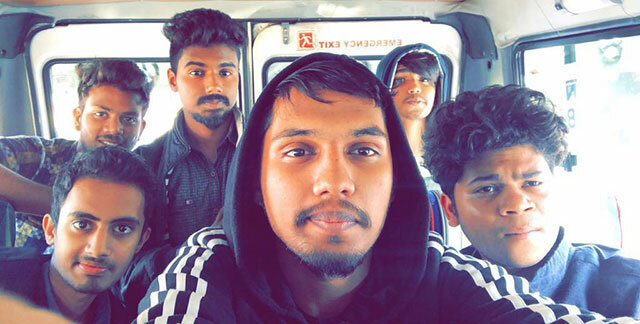 We started our journey from college at 7AM and reached Pondicherry at around 10:15 AM. 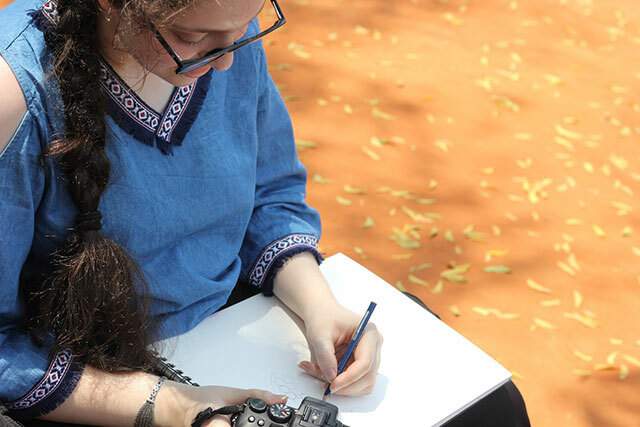 We visited Auroville which is an experimental township in the Viluppuram district of Pondicherry. It was founded in 1968 by Mirra Alfassa (“the Mother”) and designed by architect Roger Anger. 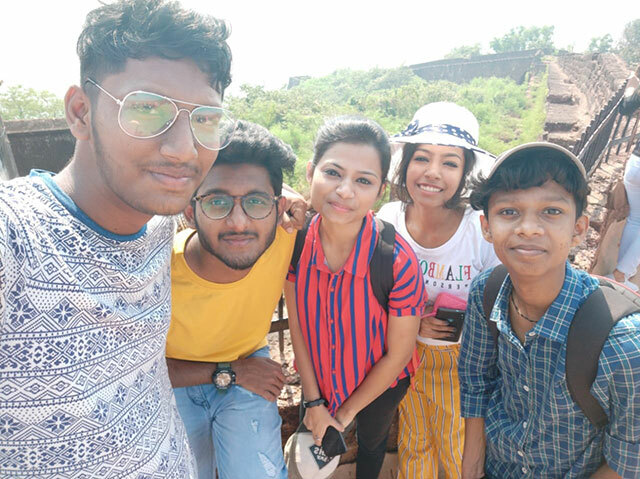 In Auroville, we visited the famous Matrimandir which is the most prominent landmark within Auroville and it is located right in the centre of the township.The Matrimandir is known as the ‘soul of the city’. 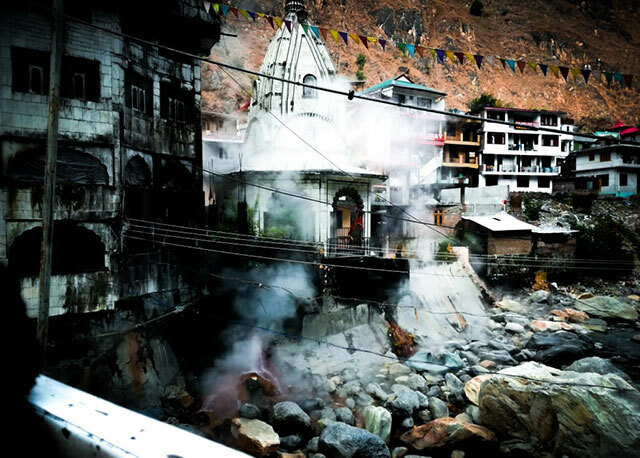 It is a place for acquiring peace and meditation. 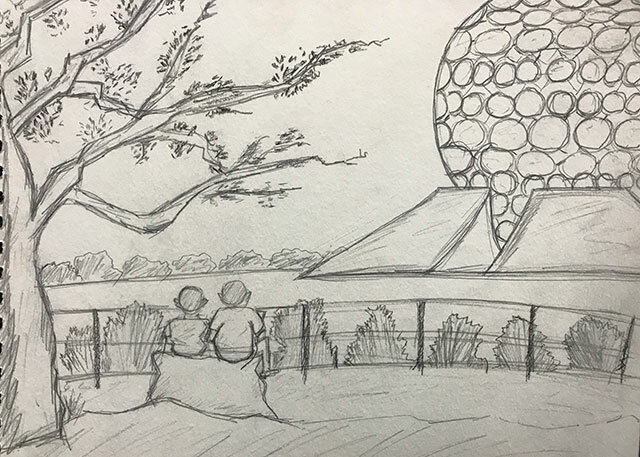 We made sketches of the Matrimandir and clicked pictures of Auroville. 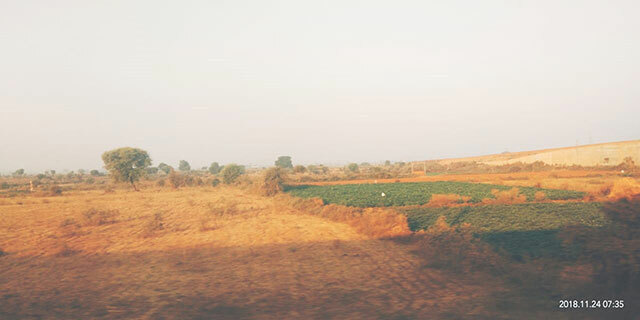 We started our return journey from Pondicherry at 4:30PM. 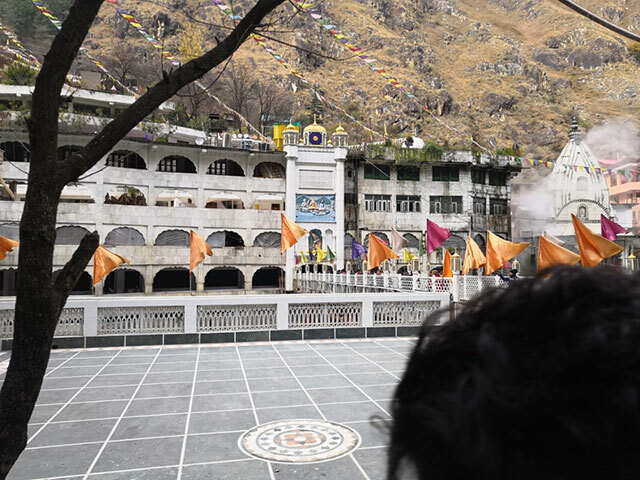 It was a different experience for us to visit such places which is known for peace and human unity. 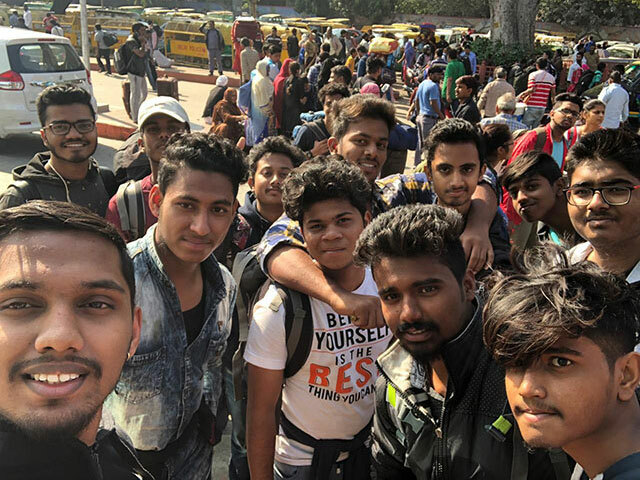 My friends and I really enjoyed the trip and hope our college would take us to such places again where we get to learn many new things. 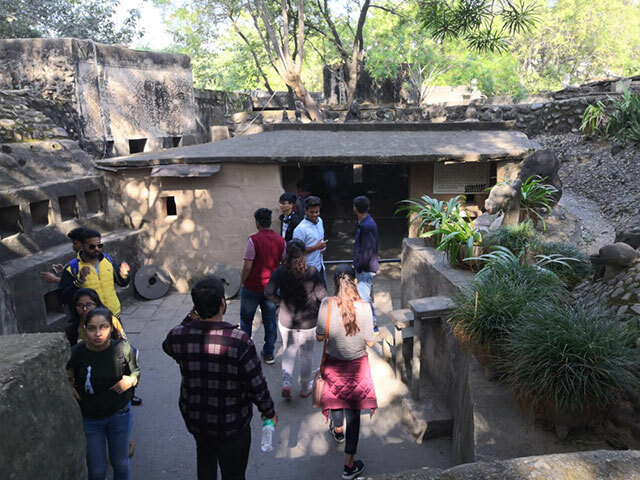 Going out of home, or the classroom, is fun and visiting places always tends to give us a new experience and learn new things. 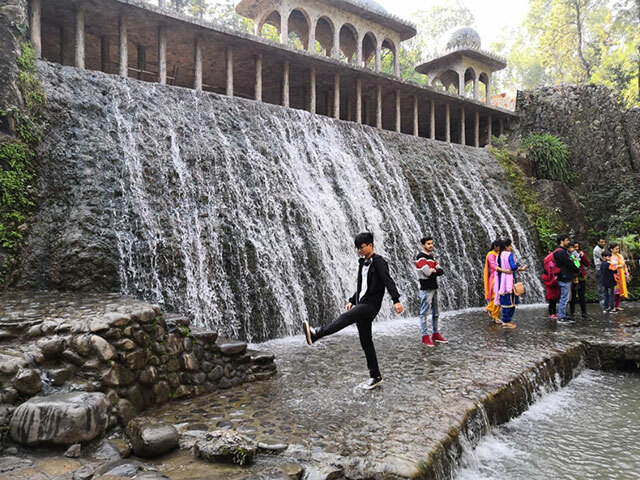 Some places are visited for its historical and cultural interests. 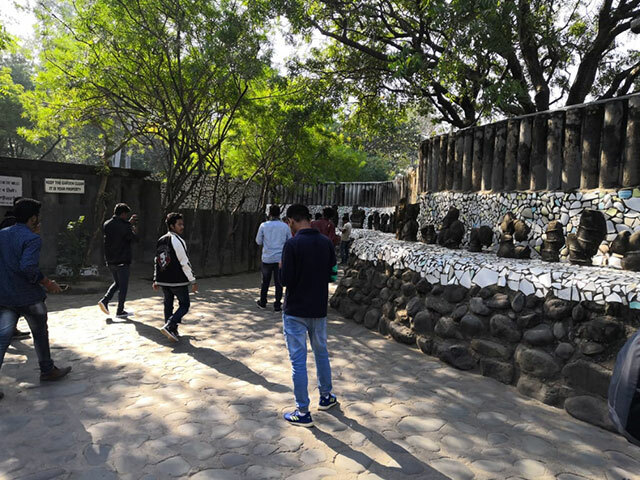 And one such educational trip was planned by our college and we the students of Graphic Design had an opportunity to visit Auroville (on 9th March 2019). 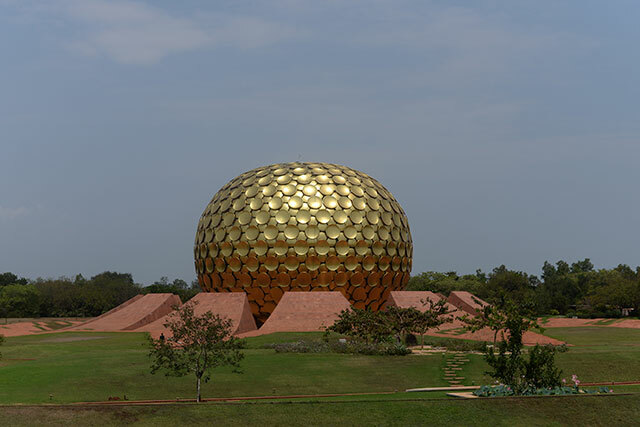 At Auroville we visited Matrimandir (Temple of The Mother), a futuristic, spherical temple covered in gold discs, located at the centre of the township. Matrimandir is equipped with a solar power plant and is surrounded by beautiful gardens. 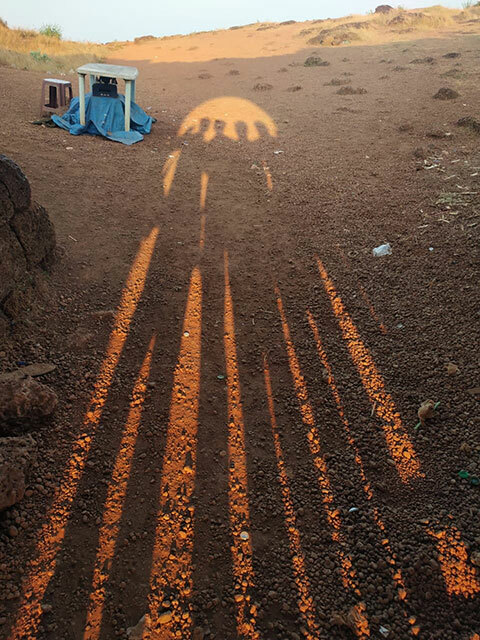 When there is no sun or after the sunset, the sunray on the globe is replaced by a beam from a solar powered light. It takes about 10-12 minute walk from the Visitors' Centre to the Viewing Point. 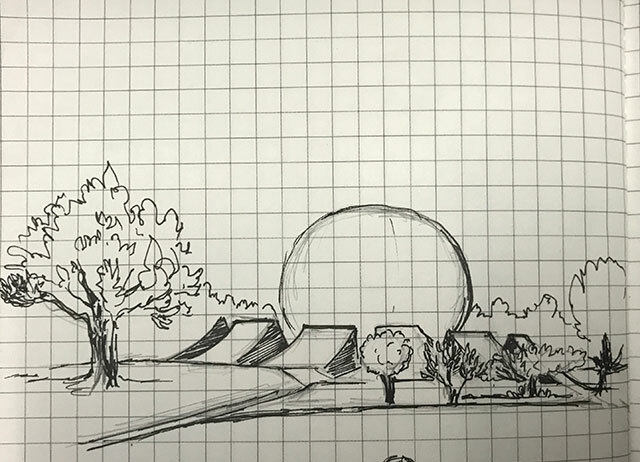 We observed the temple and did some pencil sketches of it and captured some photographs as a reference for our class work. 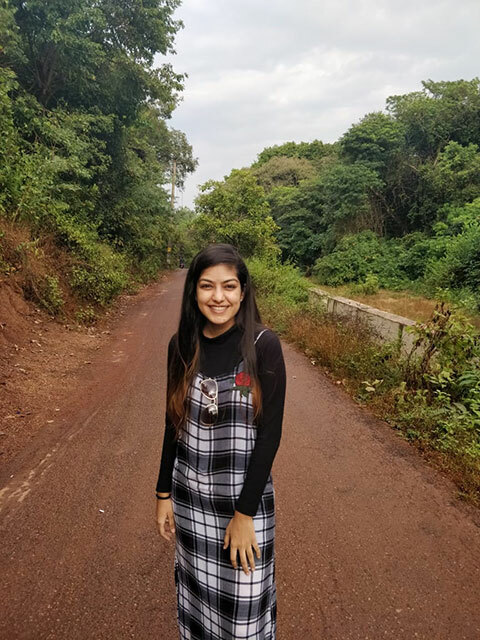 It was a wonderful experience visiting Auroville, like the previous visit to Mahapalipuram and The Government Museum. Looking forward to more such visits. 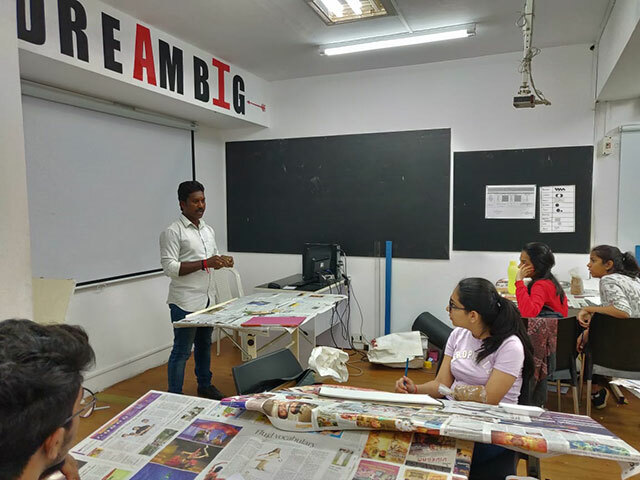 We had an amazing discussion followed by a highly educational lecture about printing with Mr Srikanth Nippatla on the 2nd of March, 2019. 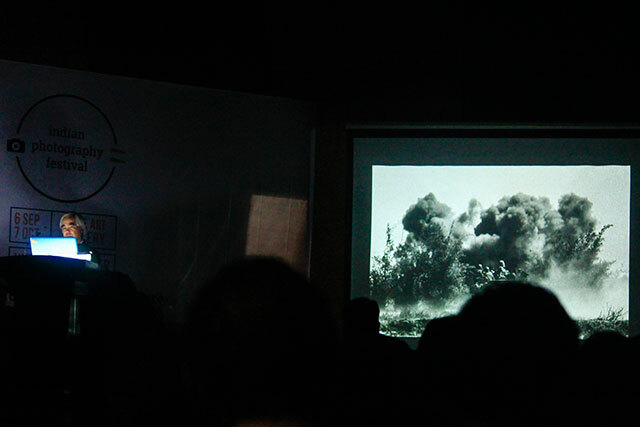 He spoke in great detail about the various technicalities of the camera, photography and printing, and also about life. He gave us insight on how and why, a photograph is considered powerful, and then spoke about colors and the emotions that they bring out. 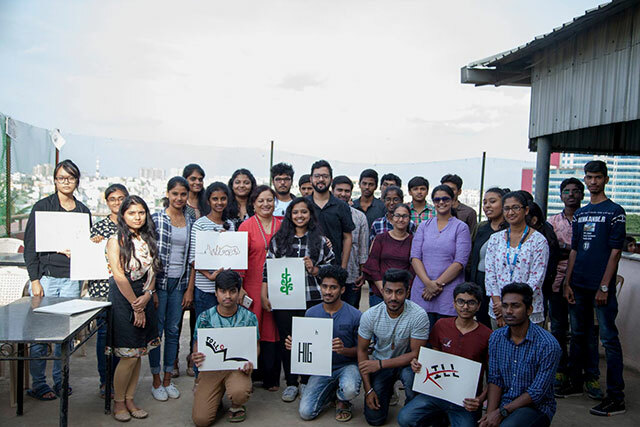 We are thankful to our college and our respected faculties for this wonderful opportunity. 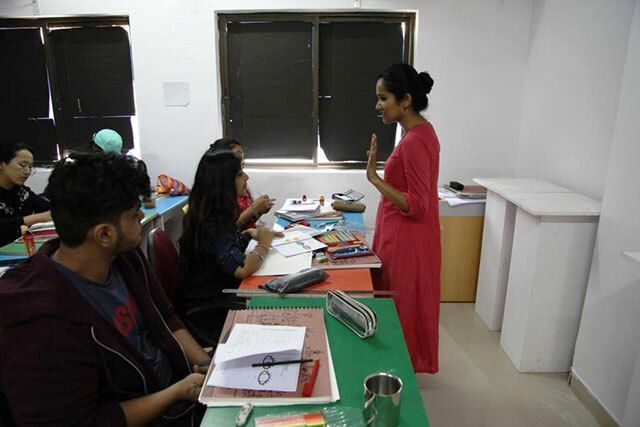 Olivia Maria Daly studying fashion design final year at Icat design and Media college Moumitha Mam from city on style gave us some information about to develop a stylized portfolio .We came to know many different types of job offers that can be done after our course she guided us in a way of wat should nd should not be in our portfolio. She told us her experience with her own start up and the was she is a stylist. She explained about how a stylist will be with the designer till the end of the shoot. She explained how brand are forecasted and they are branched down to luxury or affordable. 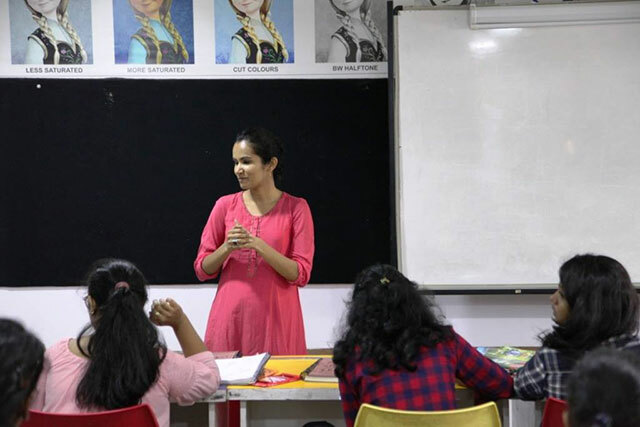 It was a very interactive class shared between the students and her. 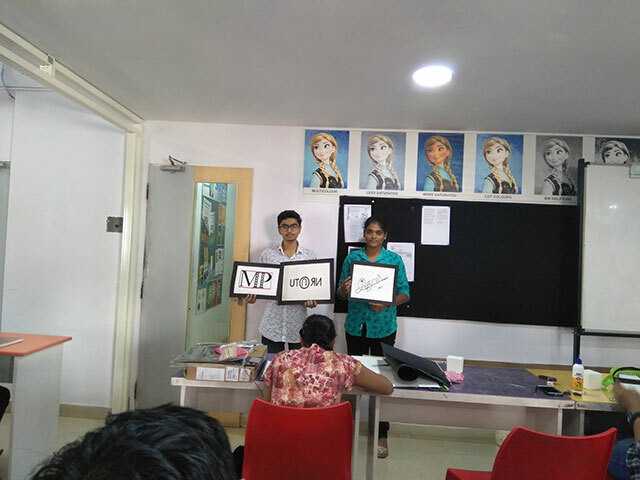 She took up her tym to make sure we understood and cleared all our doubts regarding the portfolio. She advised us not to refer to much of net suffering and bring out our own ideas. 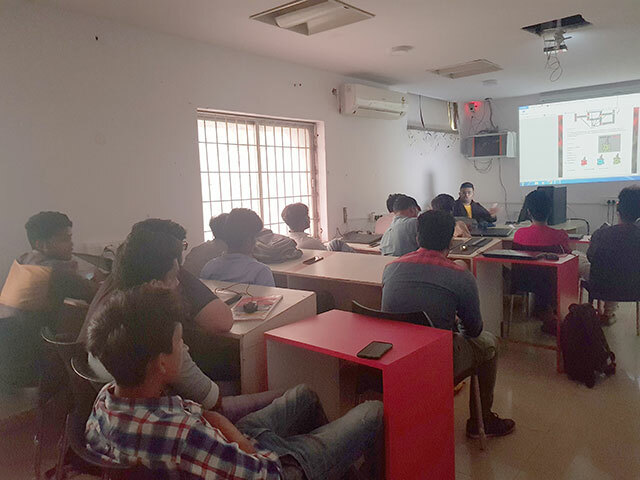 It was a very interesting class which helped us to make our portfolio better. 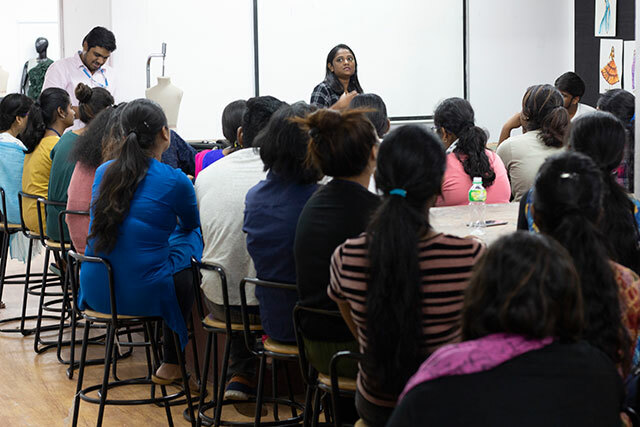 We had a great workshop by moumitha regarding our future career and for portfolio. 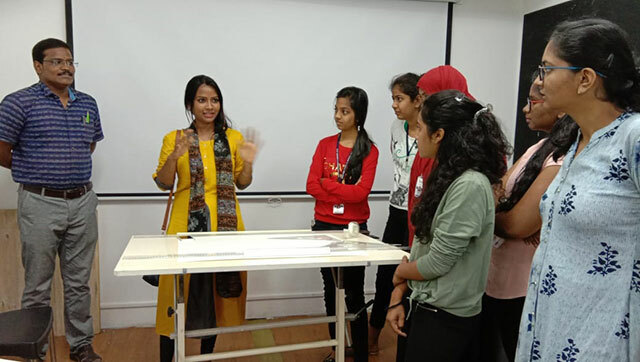 It was mazinging experience with her and we came to know about more professions in fashion design and what a designers can do for future plans. A journey started with excitement and a way of learning and understanding in a Better way. 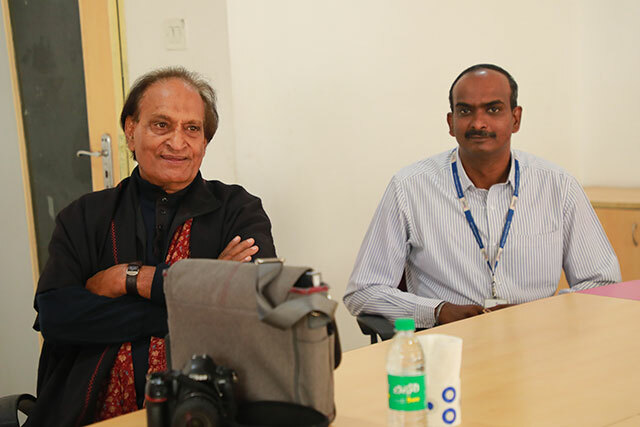 It was a pleasure to meet Raghu Rai Sir and know his long journey in photography. 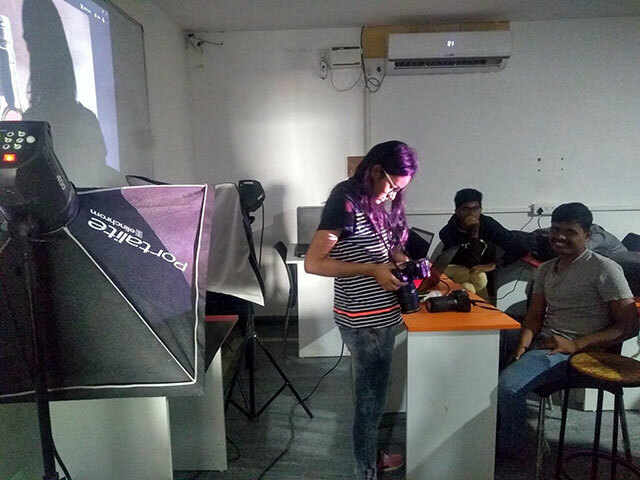 The workshop taught us many things which will be helpful in a journey of photography. This workshop was good and very useful, especially as documentary photographer and speech was inspiring and intracting, From yesterday my religion is not Hindu. 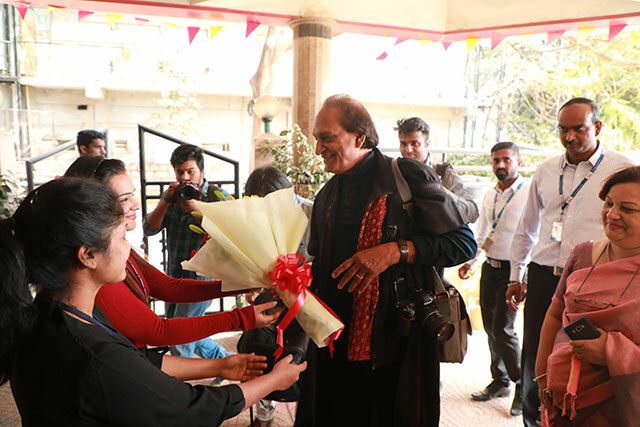 Thanks to raghu rai sir and to the college management for making this happen. 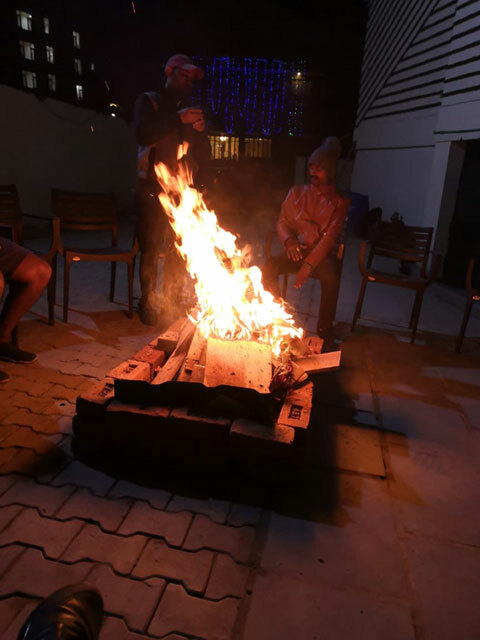 The workshop was superb.Good to hear his Life experiences and the Interactive session was on the fire. 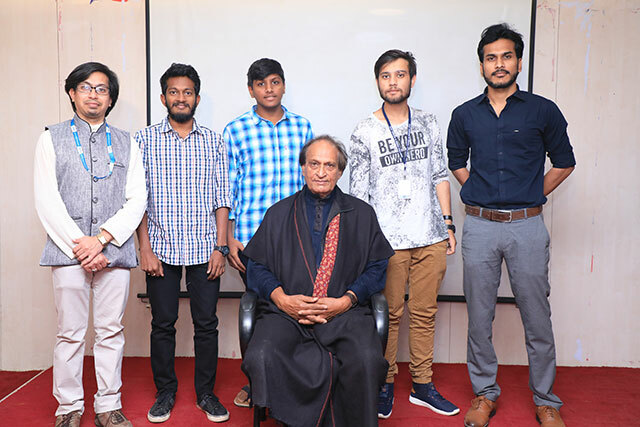 It was really a great opportunity to Meet RaghuRai sir thank you for bringing that. 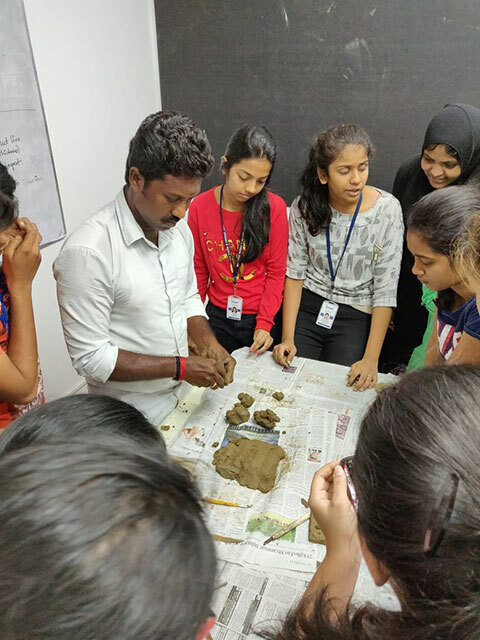 It was a good experience as we learnt many new things from the legend Mr.RaghuRai and the way to approach a subject. I just wanted to thank him for his wonderful speech that he shared with us. The greatest moment in my life to see one of the greatest in this industry. The workshop was insteresting and inspiring. I hope everyone's seats were on fire and everyone will become mad after the session. 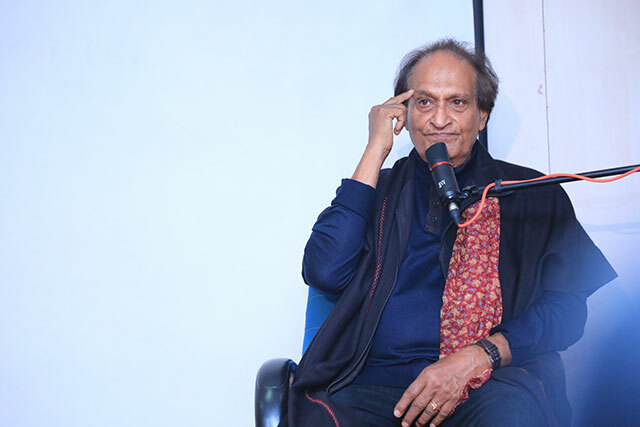 Thanks to raghu rai sir and the college management for making this happen. 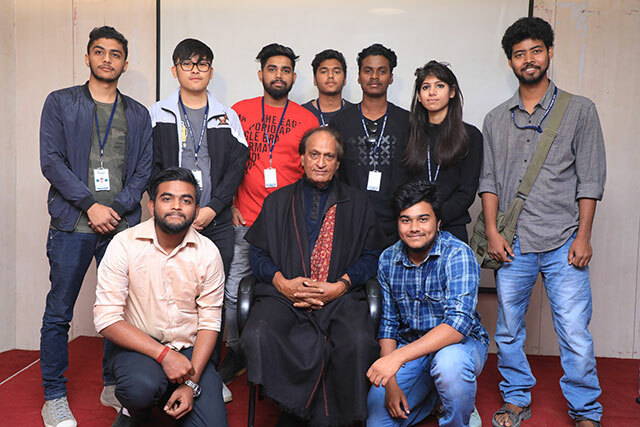 We got a wonderful opportunity to meet and have a interactive session with the legend Shri. 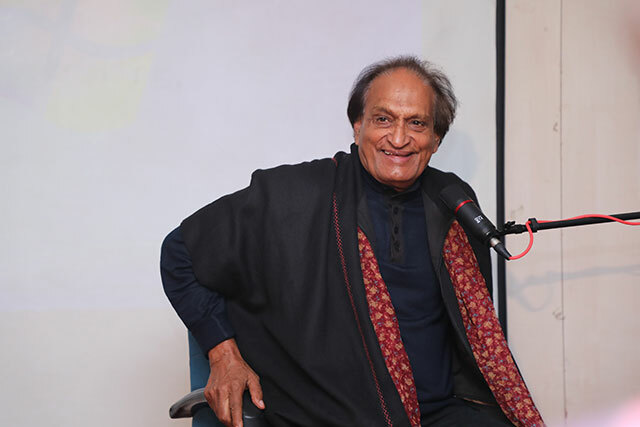 Raghu Rai. After the session along with him i got an idea on how we should develop our creativity skills and how we should shoot basically. Just about everything, had a lot of fun, have a lot of things to work on.Being able to learn and try new techniques while under the guidance of the instructor. 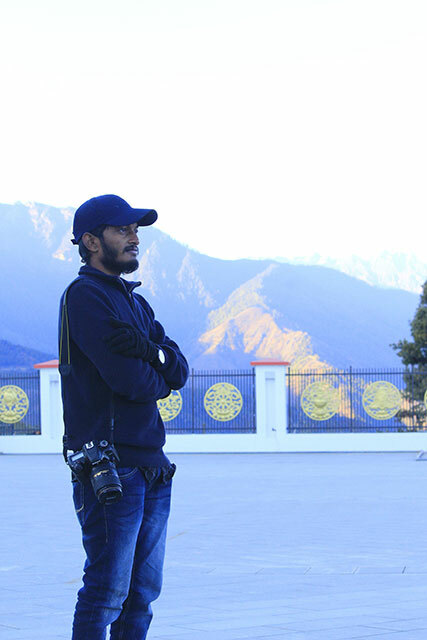 I just wanted to thank Raghu sir for the awesome experience. 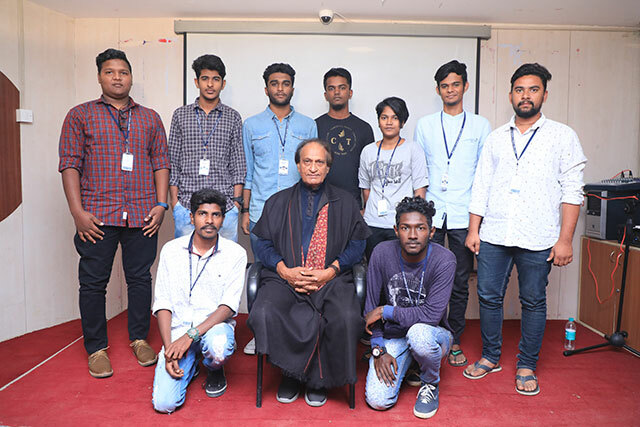 Meeting Padmashri Mr.Raghu Rai in-person was a Lifetime opportunity for every students who were keen on learning Photography. 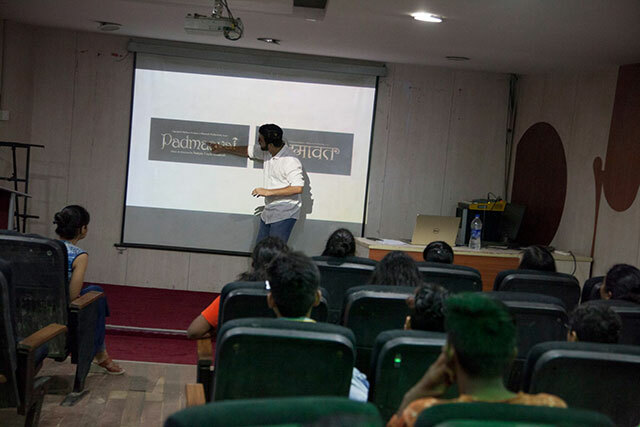 Every single words that came out from his words had a thousand stories and meanings.Students were very much careful to even question the legend, as choosing the question to ask to the Legendary photographer wasn't so easy job. Even though the session timing was less,the words from the mastro had boosted the Morality and enthusiasm of the students to a greater extent. Such words from the mastro has carved into the students mind. It was a great time meeting the master. 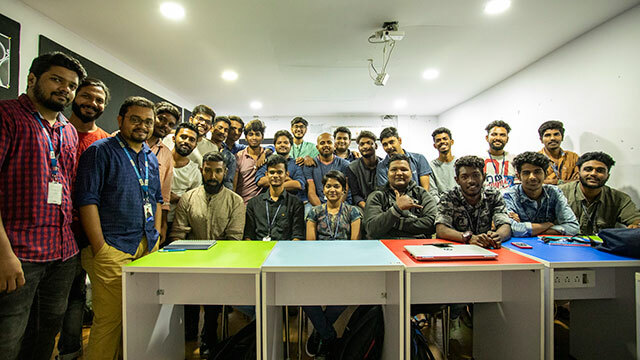 Thanking iCAT Design and Media college for such a wonderful opportunity. I will be always grateful to him . Thanks to ICAT for giving such a great convenience. 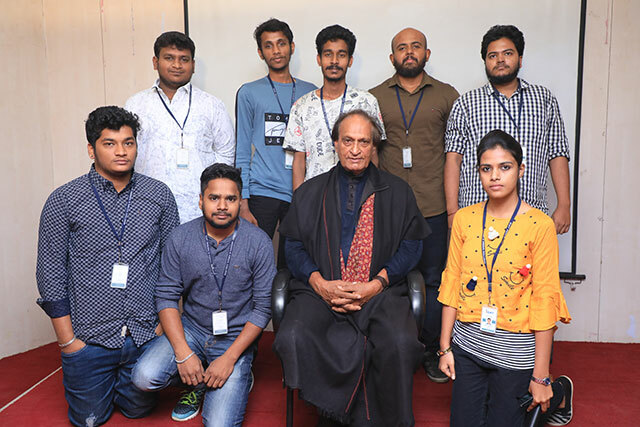 The workshop was very good and the session was very interactive as he shared his life experiences.It was really a great opportunity to Meet RaghuRai sir. Today we had a great opportunity to meet Padma Shri. 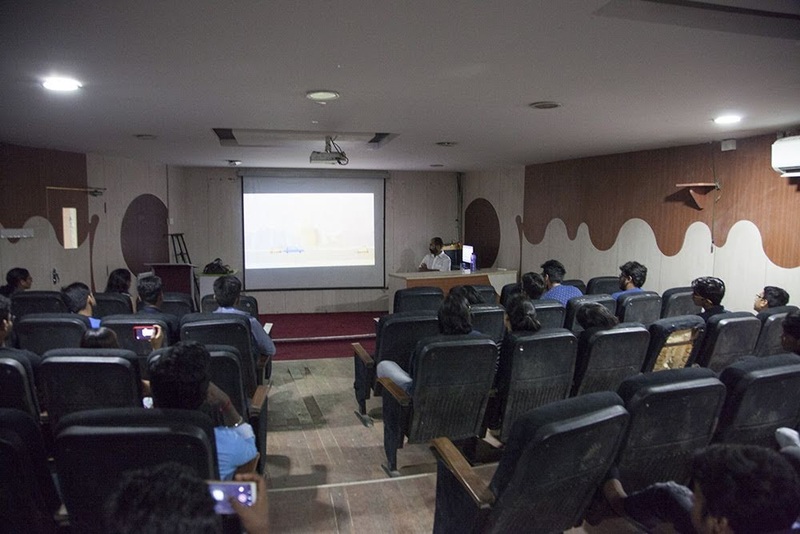 Ragu Rai , India's one of the best street and documentary photographers.We had a great day with him.It was really happy to hear his experiences over decades in photography.And also he shared how he came to this field.He told how to think creatively and do things differently.I thank our iCAT management and our faculties for organizing this wonderful workshop and we learnt a lot from him.I once again thank you for this wonderful opportunity. 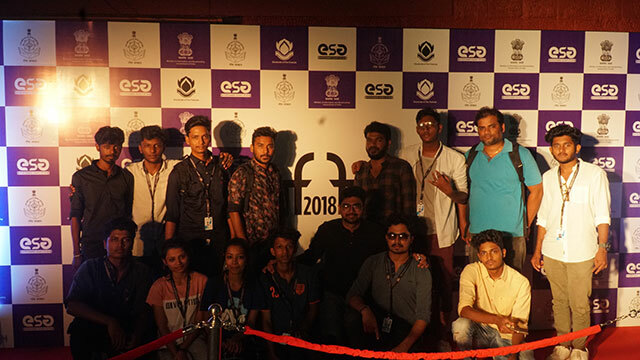 A nice experience for me to be a part of this. 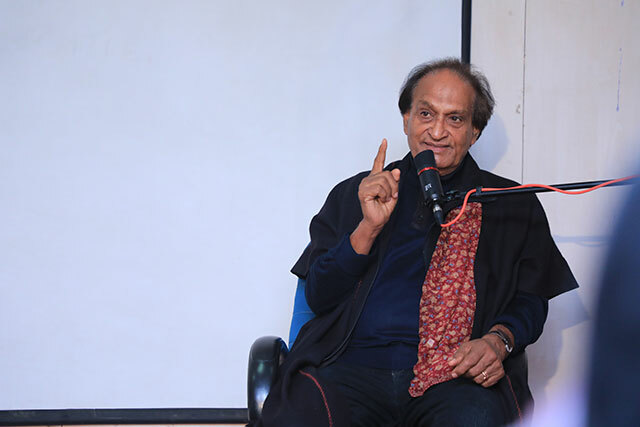 He thought a good lesson in photography, his words which made inspired,lucky to see the great legend raghu rai sir. 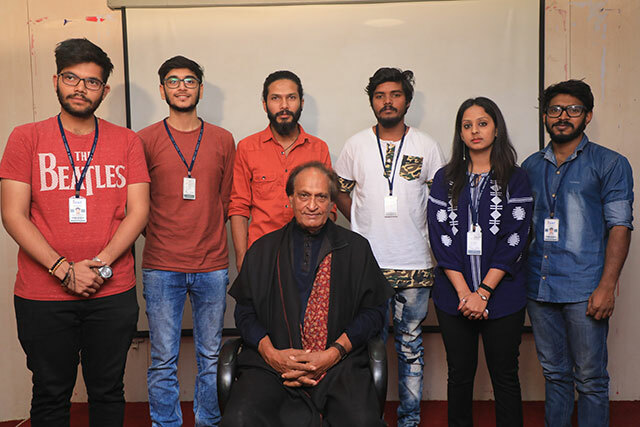 Its an great experience and pleasure meeting Padma Shri RAGHU RAI sir and we learned lots of things from him. It was one of the most memorable moments in my life. Hearing what the Master said completely changed my attitude towards photography. Ragu Rai was a man of great creativity. Seeing his photos and discussing the photos with master himself was a great experience for me. 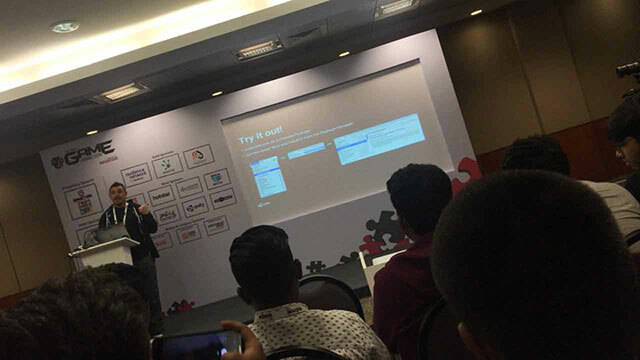 It was a great experience, and his talk was just awesome. Some of his words were really inspiring . It was a good expierence getting the ideas from the legend himself , and his point of view before shooting and the secrets that his amazing photos. It was a very good experience meeting one of the greatest photographer, and sharing his experiences and inspiring us . It was Awesome experience.learned so much about street and documentary.learned how to capture photo full of emotions.wonderful experience with a legendary experienced person. It was different from usual photography workshop, was interesting! I feel so lucky to listen Raghu Sir, it was really great experience to listen to his experiences and learning from it. To listen him live and living his moments was a great experience , i will follow his instruction to be free and believe in nature . It was a great experience. Learnt some good things from him. it was a great experince we learn so many things from him he share his life expereince with us which is very beautiful thing about him this i like the most . It was great. Thanks to ICAT for giving such a great convenience. 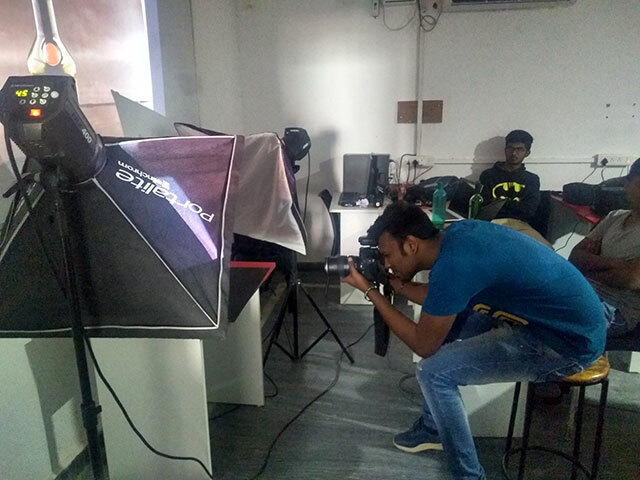 What an experience it was to interact with one of the best photographers in the world! Raghu Rai is a legend, albeit a humble human being who engages those fortunate enough to meet him at many levels. 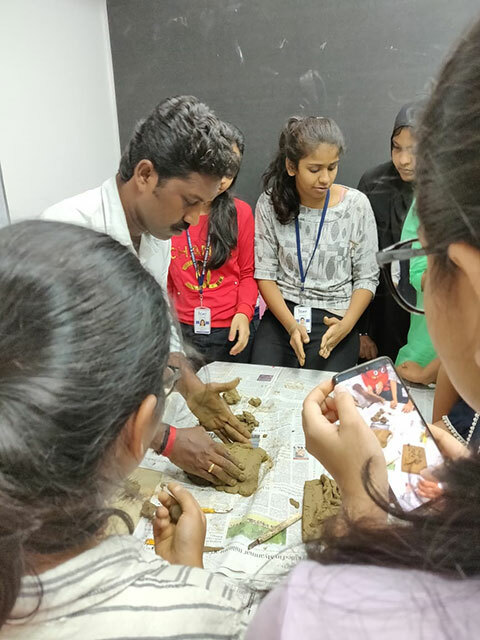 When I learnt that he was to conduct a workshop in our college, I thought that I would certainly take benefit of the opportunity. We learnt a lot from him today. 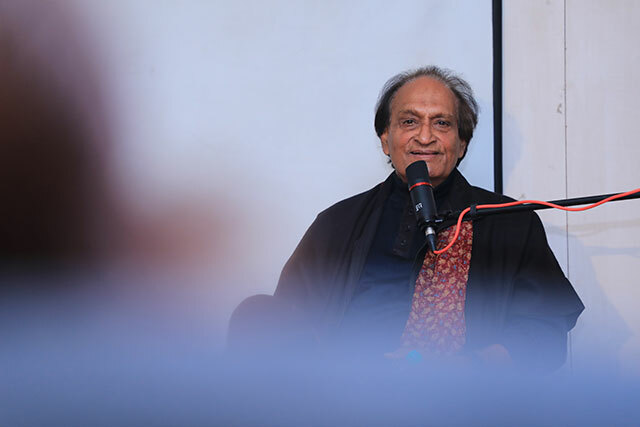 It was a Mesmerising experience to be in the presence of one of the greats, and hear him speak! 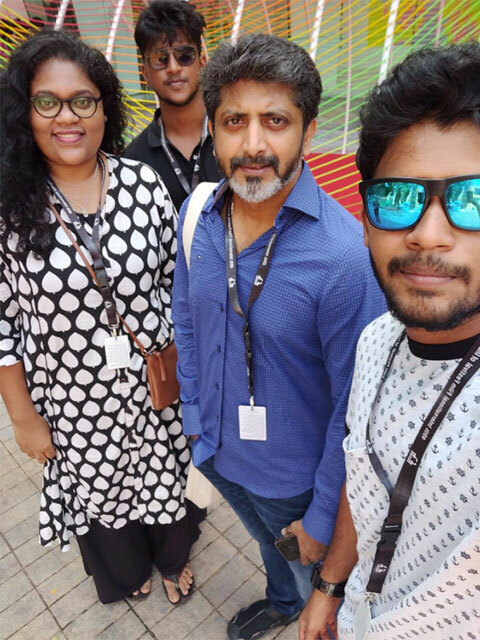 I always have a big respected for Mr. Raghu sir for his his work and his personality but seeing him in person spending few hours with him the respect i had for him as only grown higher & stronger. 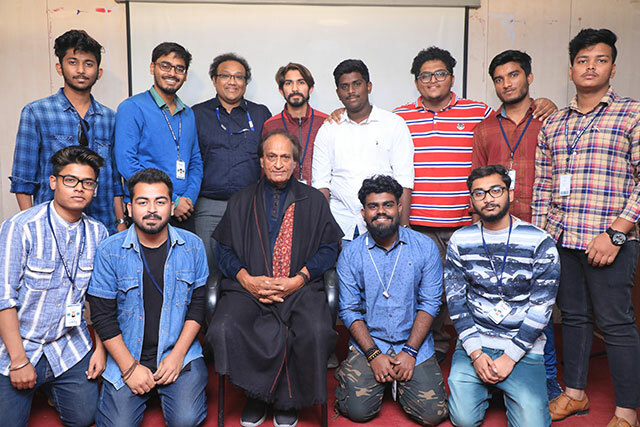 just wanted to say thanks to Mr. Raghu Rai for sharing his experiences with us providing us the valuable information it was a really great and a valuable day for some incredible information and techniques. 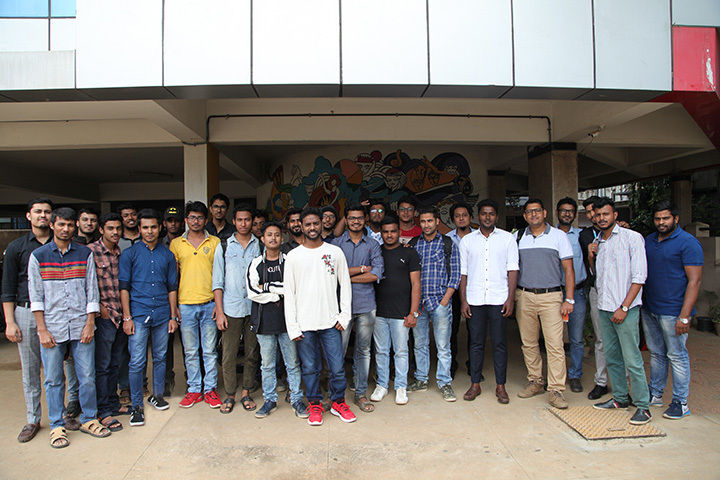 It was a great time with the legend he shared his most auspicious memories and guided us with tips which will help us to build a bright future. 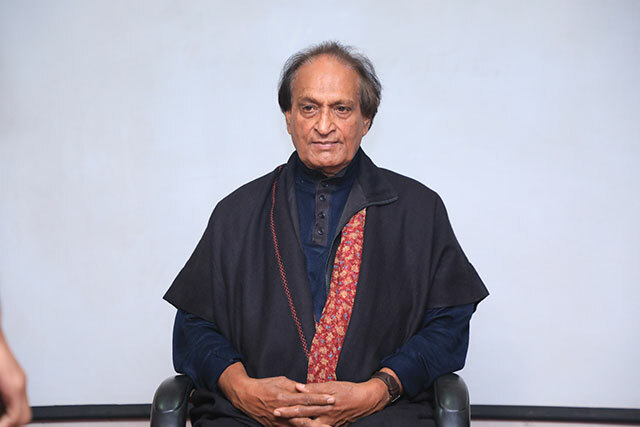 It was an Honour to meet a Lengendary Photograher Mr. Raghu Rai. His class inspired me alot. It was great experience. 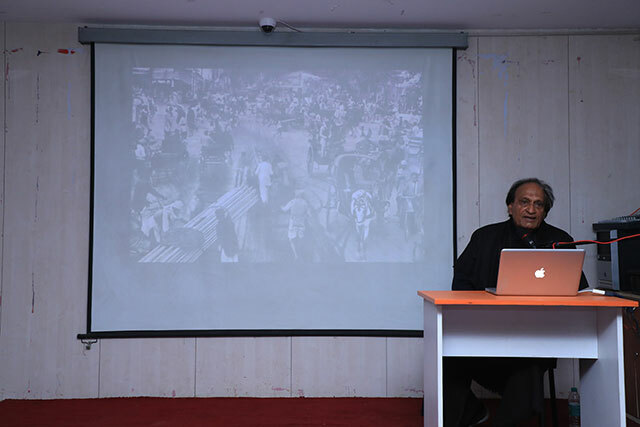 Thanks to Raghu Rai for sharing his experience to us. Really blessed to have you Sir. Thanks to ICAT for giving us this wonderful opportunity! I will be always grateful to him . Thanks to ICAT for giving such a great convenience. 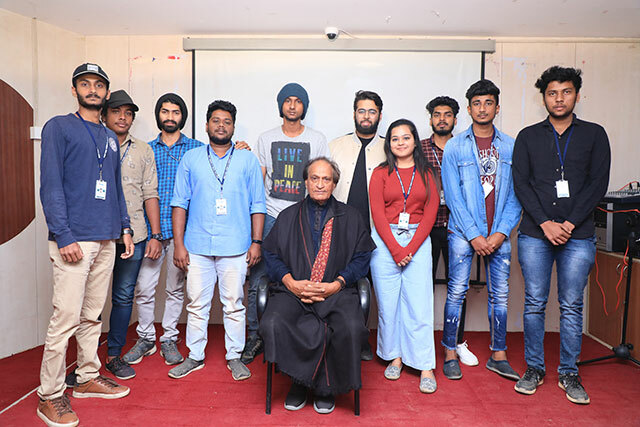 It was an honour to meet the famous,Padma Shri award winning photographer MR.Raghu Rai at the workshop organized by icat design and media college .Being a street photographer, It was a voluminous opportunity to learn from the great photographer. 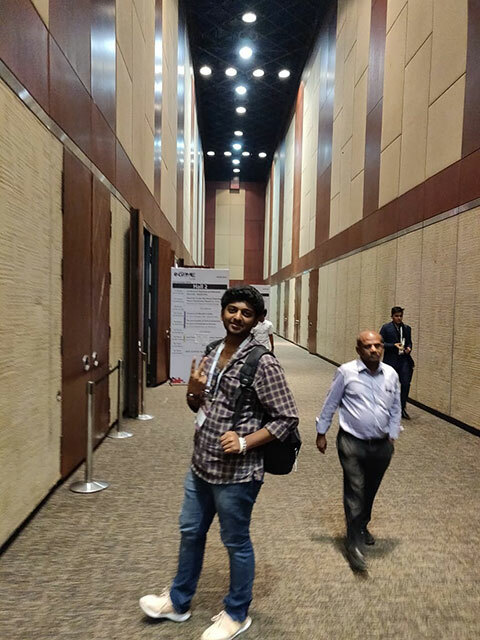 he cleared all the fundamentals during his speech.But the most important thing I learned from him is , a photographer should always listen to his heart...that is the ultimate place , photography comes from. 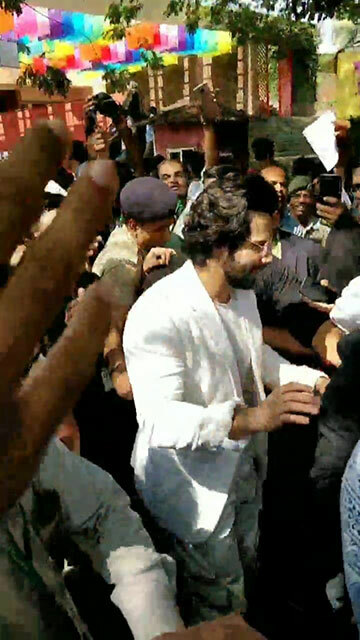 One of the best experience of my life, felt really blessed that we could see him in personally. He is the one I look upto, my idol. "One of the best photojournalist in the world" and i would like to thank him for his valuable words which motivated lots of new photographers like myself. And I also like to thank Icat for this life time opportunity. 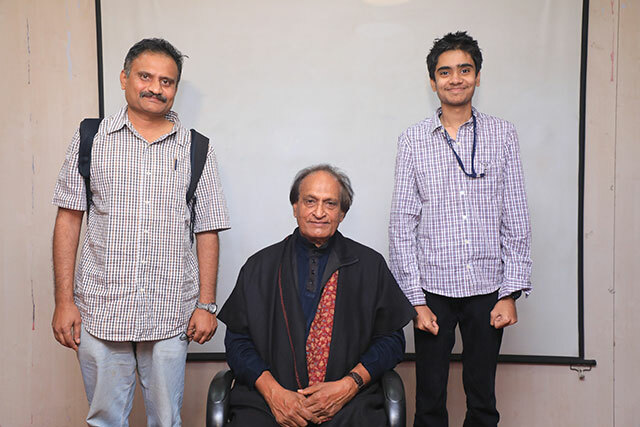 It was an great experience meeting one the best Indian Photographer and Photojournalist Mr.Raghu Rai Sir. Overall, I Personally learned many do‘s and dont‘s which should be followed while Photographing a Frame or a Picture. I would love to meet such an inspiring person again. Thank You Sir . We had a good experience , thanks giving this opportunity. 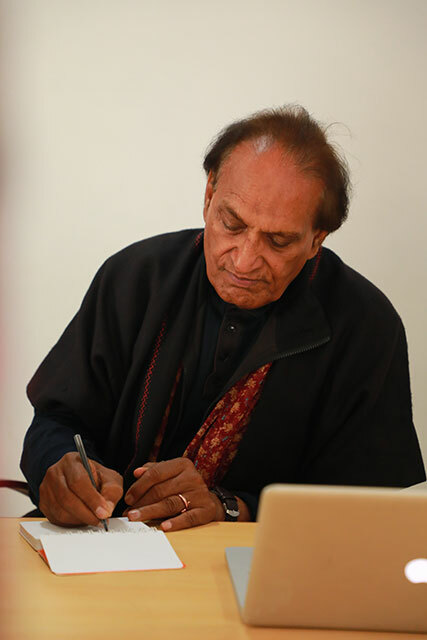 It is a matter of fact that today we have got someone like Raghu Rai, a legendary photographer. His short speech showed one of the main ways to stay focused to our aim. According to him, photography is an art, here it does not required any style, it takes a little different thinking and its presentation. If you want to create something new then you have to work from your heart not from your intelegency . His inspiration will help me become an Artist in the future. And lastly thanks icat to give me such an opportunity. And thanks to our sir. Their collective efforts have gone a step further towards our goal today. 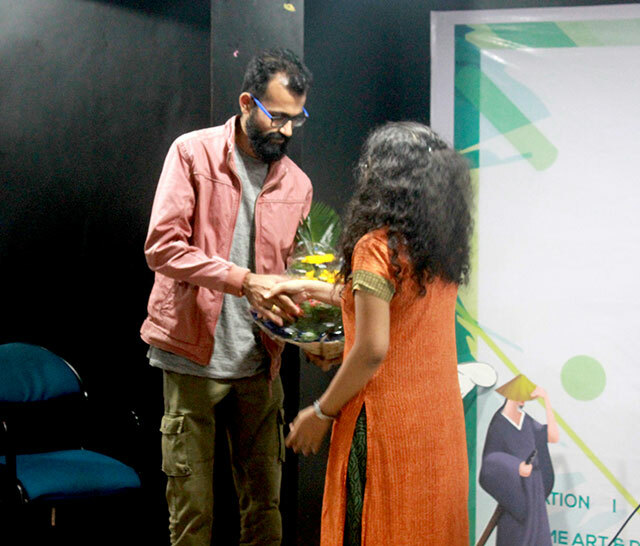 we were so lucky to meet Raghu sir,it was a greatest experience till date all thanks to icat photography department. 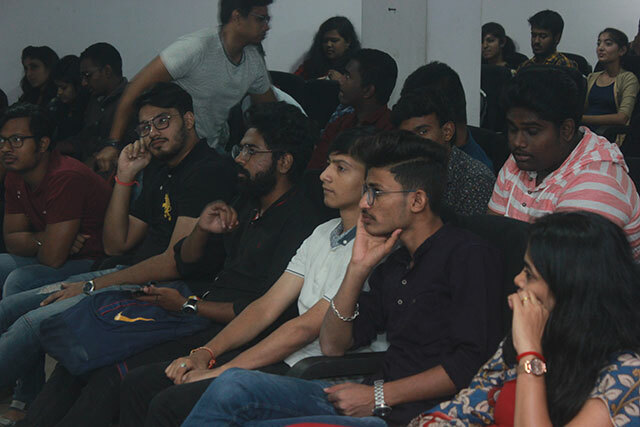 The seminar by Mr. Tushar Desai, a Matte Painting Lead & Concept Artist, was really good and as I am a first-year student, the information shared in the session was amazing and new. 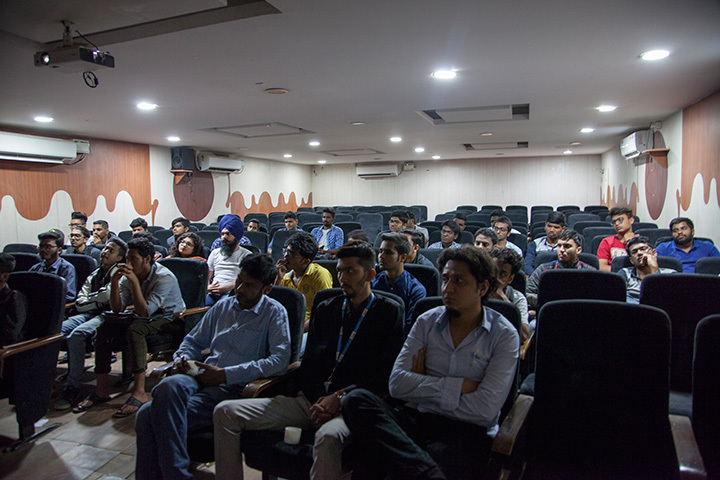 We got some good knowledge sharing and new ways to think and study about the VFX industry. He also told us about the working culture of the industry and his experience. He also told us about how to prepare ourselves from the very beginning itself for any kind of media and entertainment industry. We started our trip to EXCLUSIVE BHUTAN from HYDERABAD on 08-12-2018. We went from Hyderabad to Vijayawada first and we boarded NJP TRAIN from Vijayawada at night 10: 30. After boarding train, we met new people of our other branches their. After having dinner we slept. On the next day, we spend our time full of journey full day. On 10-12-2018 we reached to Jaigaon from NJP. 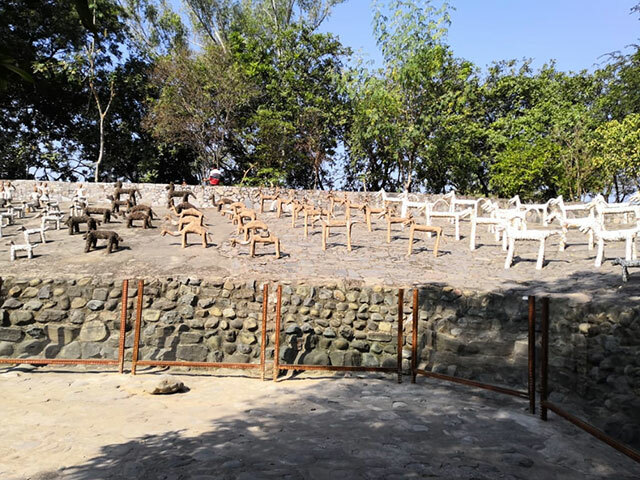 JAIGAON is the border place for INDIA and BHUTAN. At eve time we crossed the border gate of India and we went inside the Bhutan country. And we returned back in 5mins. We completed our dinner and we take rest. 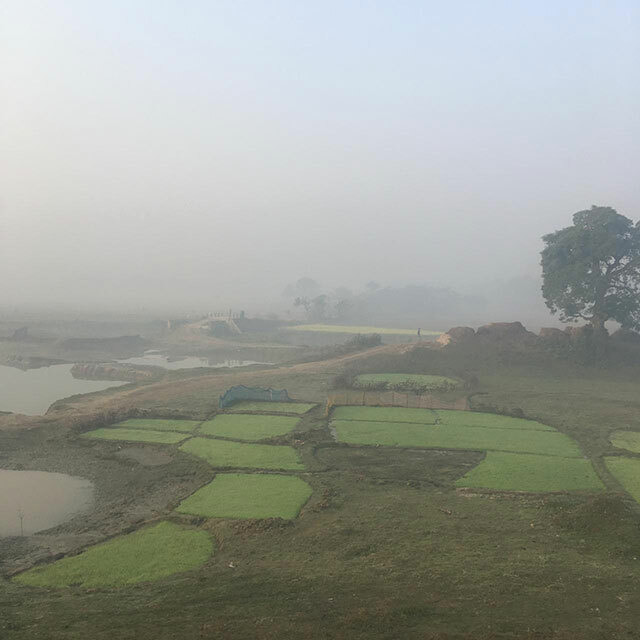 On 11-12-2018 I woke up in the morning between 6-7am then I sawed a beautiful climate. 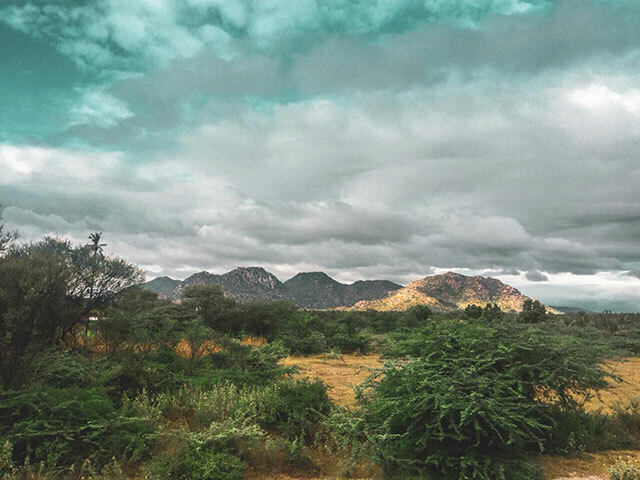 I clicked some photographs and I kept time-lapse for the climate I got a good result. After completing our breakfast we went for the immigration process. We thought it will be completed in 2-3hours but not it takes much time with irritation, at last, we completed our immigration process. 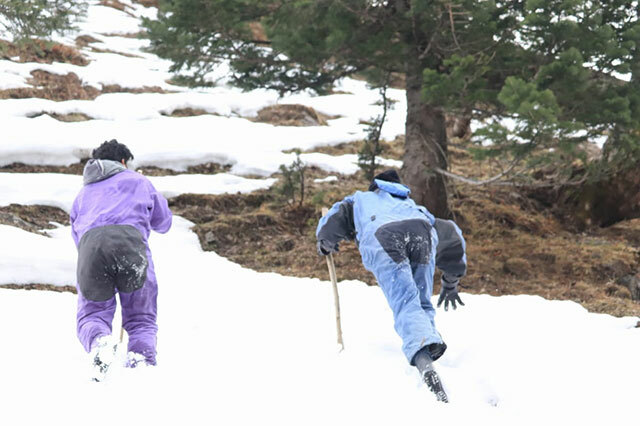 After the immigration process, we started to Thimphu. We sawed a beautiful climate while sunset. At 11ío clock we reached to Thimphu KUBERA restaurant. We freeze of that climate. We completed our dinner and check into the rooms we take rest whole night. 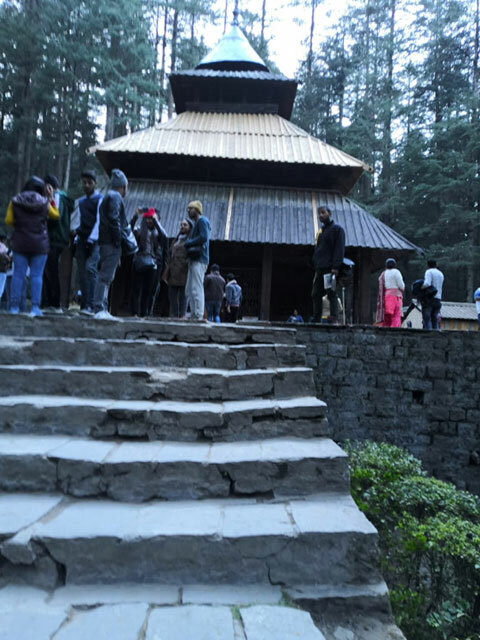 On 12-12-2018 after breakfast, we started our Bhutan sightseeing places. First, we went to memorial chorten Thimphu. We clicked some portraits of people. And we sawed the style of their worships of their god. After that we went to the folk heritage museum we sawed sculptures and arts making by students there. After that, we went for lunch to the hotel and we went to Buddha point this is the largest statue in Bhutan .after that we visited TASHI CHHO DZONG Buddhist monastery from outside their I sawed the parliament of Bhutan .after that we went back to the room. we had our dinner and rest. 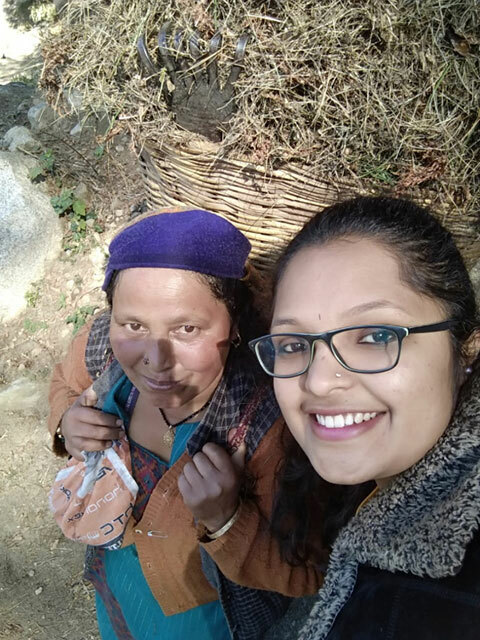 on 13-12-2018 after breakfast we traveled to Punakha . 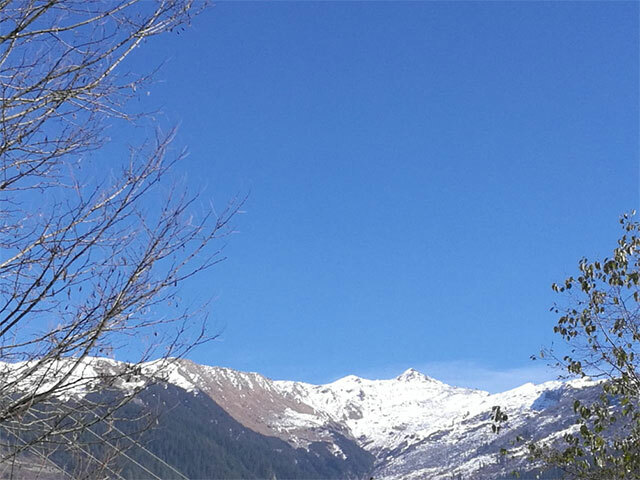 on the way we have seen DOCHU-LA pass there are prayer flags,chorten, mani walls and we sawed the Himalayas from there. 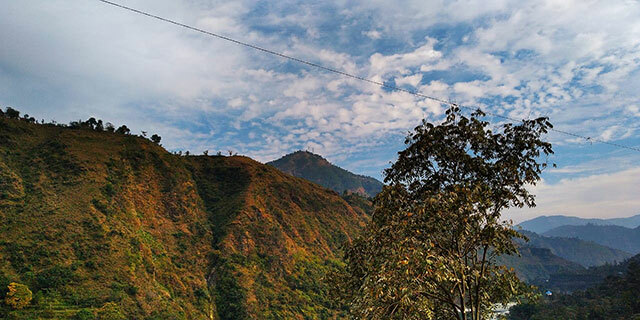 after seeing those Himalayas we got a feeling to go there. 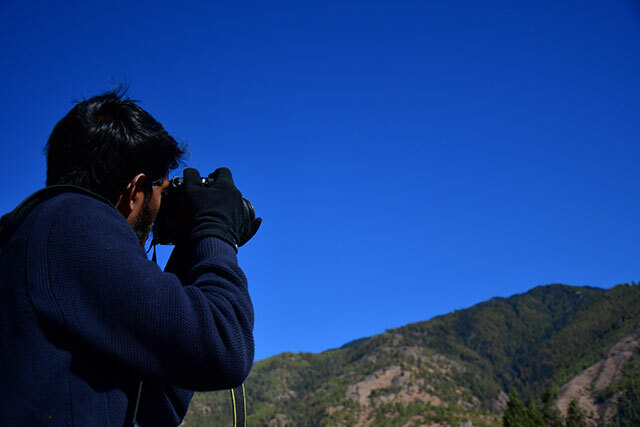 we clicked some pictures in "Chelela-Pass". 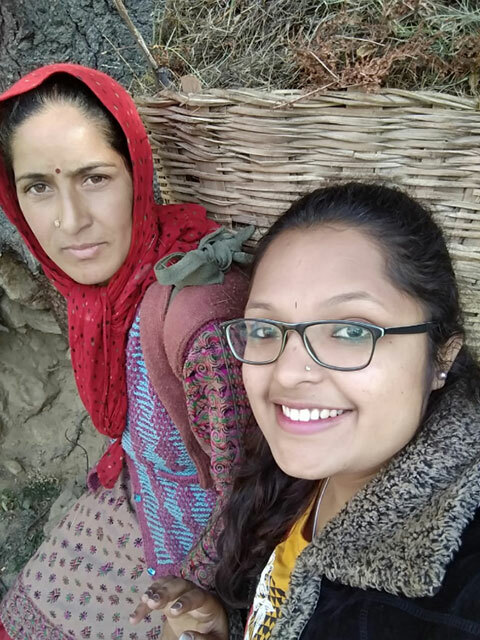 we sawed frozen water we clicked pictures of that and water drops.after that, we went to a village in Punakha .after seeing that village we get a laugh seeing the paints on the houses and the wooden items. 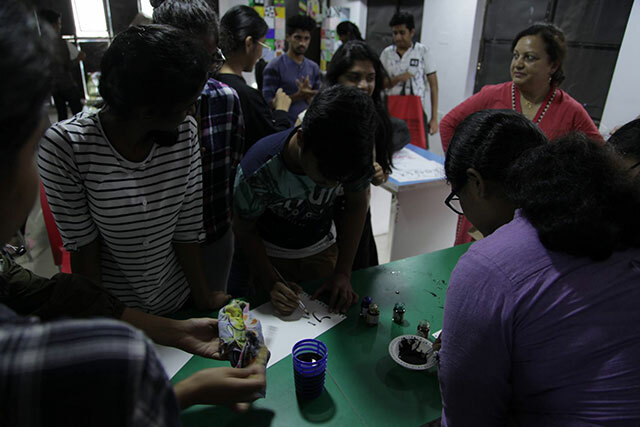 after we asked and interacted with some people about those paints and the wooden items. we clicked some portraits of people their and children. after that, we went to PUNAKA DZONG. 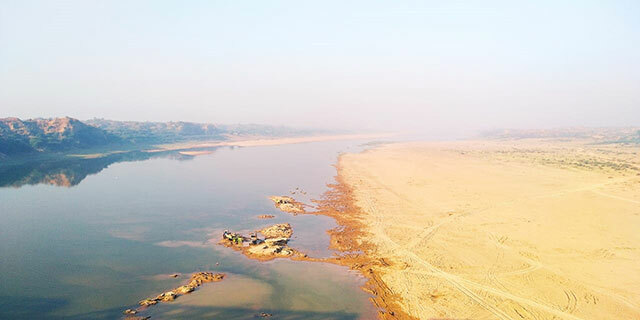 it was built between the junction of the 2 rivers named as Mo Chhu and Pho Chhu one is a male river and another is a female river. 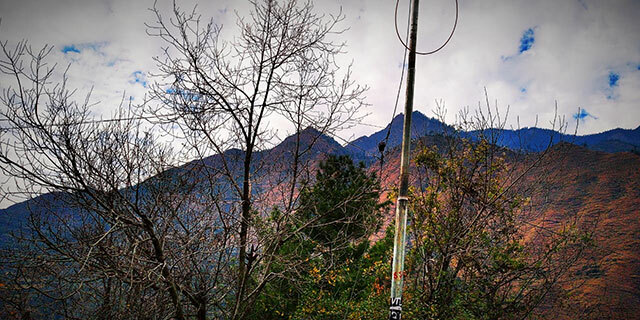 we got a good landscape picture of that. and low-shutter of water. 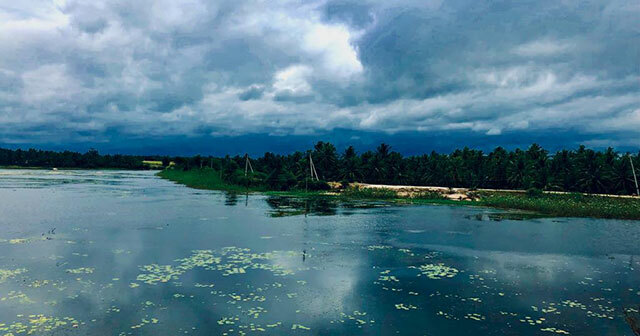 after that, we went for lunch near a river.after eating lunch we enjoyed in the water and clicked some photographs their.after that we went to the suspension bridge in the pleasant evening. after that we get back to the hotel we slept after having our dinner. 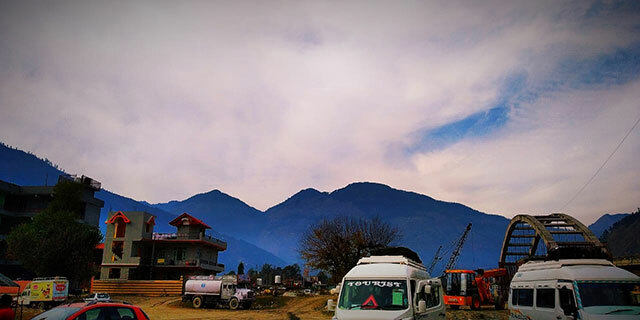 on 14-12-2018 our journey begins to Paro city from Thimphu. 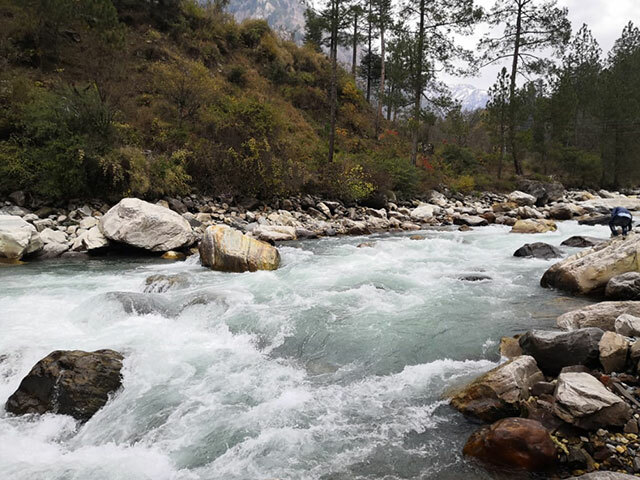 the roadway is very awesome.in the way to Paro we stopped at one point we clicked some photographs of water and there is a small suspension bridge also. after that, we went to TA DZONG museum but we didn't go inside because of time. 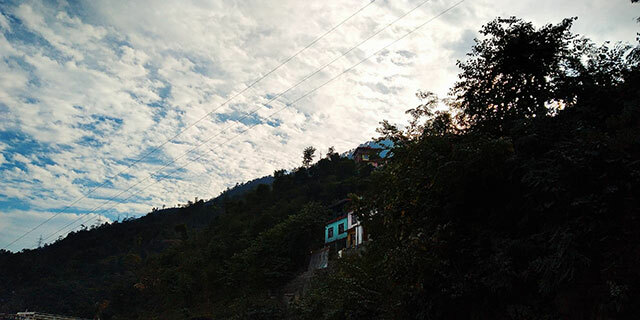 we visited a small gift shop beside that.after that went to check in to hotel NIVVANA .hotel NIVVANA is located between super location surrounded by mountains and pleasant climate.after lunch we take rest.we went out to roam over their.we completed dour dinner and slept.on 15-12-2018 after completing breakfast all went to tigers nest. but I didn't go because of my sinus problem. I explored the city and shopping in the town with my classmates up to the evening. 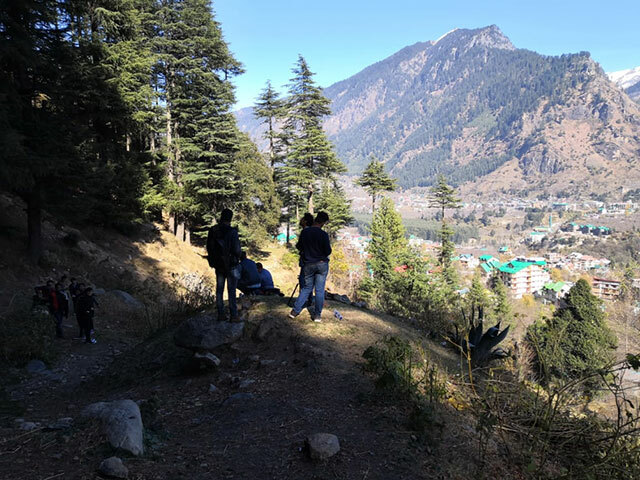 all the members who went to tigers nest came back to the rooms with the tired faces and slept.inthe night after completing dinner I shooted star trails.and I sawed shooting stars also their. 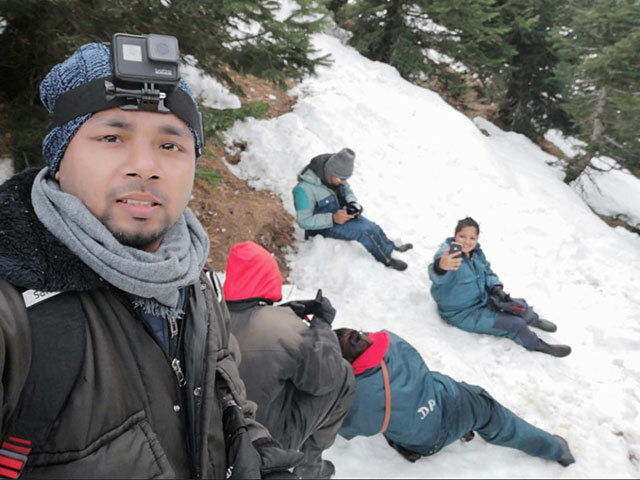 after completing shoot I went back to the room and slept.on 16-12-2018 after completing our breakfast we went to CHALELA PASS which is the highest peak point of Bhutan with full of flags. 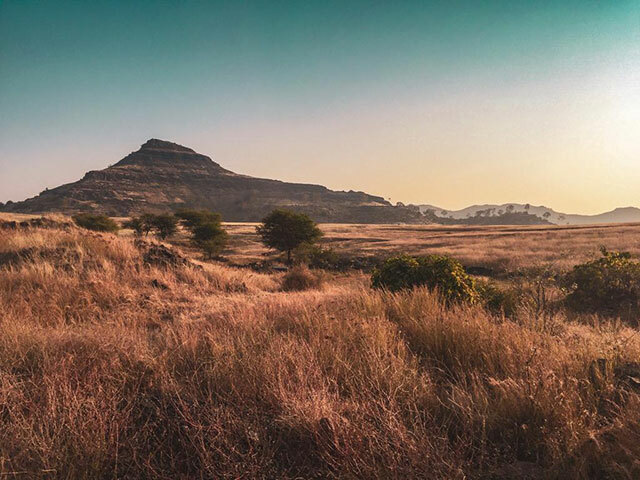 we got good landscapes pictures. we sawed snow mountains and walks their after that we stopped for our lunch in between the hill road. 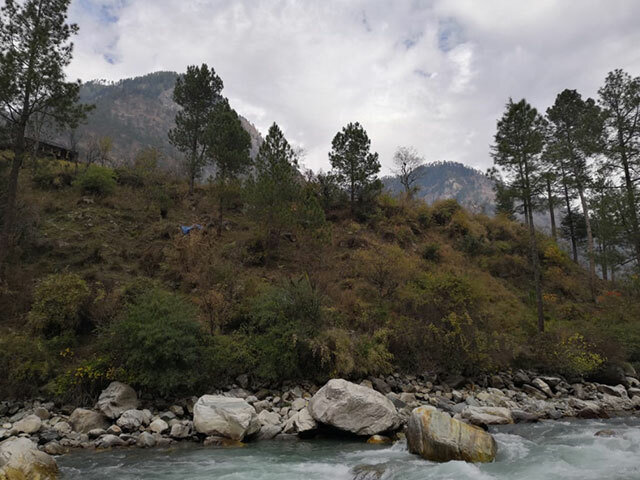 after completing our lunch we went to HAA VALLEY. there are some cultivations and monastery their I didn't click pictures there because of my some hand problem.after that, we went back to the room. on the way, we sawed the museum in the full of lighting.it is very nice and attractive. 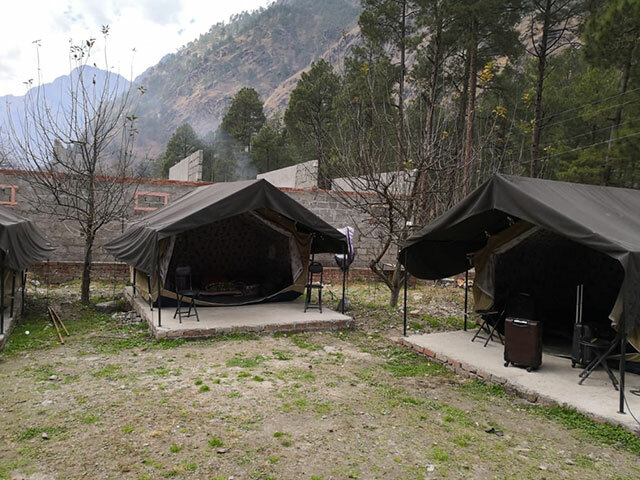 after going to the room we completed our dinner and take rest.on 17-12-2018 we after breakfast we went back to Paro to jargon .in the way we sawed very very beautiful valley and waterfalls there.at eve we reached Jaigoan and check-in to the hotel and had our dinner and take rest.0n 18-12-2018 after breakfast we went to NJP station to board the train to Vijayawada. 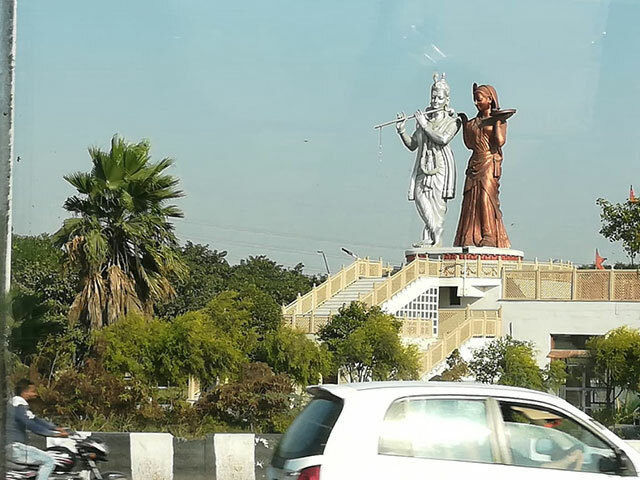 we reached Vijayawada on 19-12-2018 at 10:30 pm. we had our dinner in a railway station . 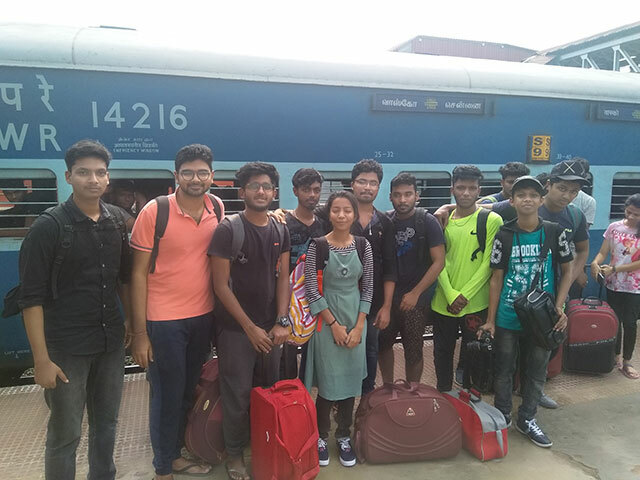 after completing dinner we went to Secunderabad from Vijayawada through train.we reached Secunderabad station at morning 7:30 am.trip ends. the overall experience of my trip is great. I am happy because I visited a new city and new people. people, they are very polite and friendly. I got some good portraits of them. and some documentary photographs too. and I got some astrophotographs because there is no light pollution much. IGDC was so awesome!!!! held in Hyderabad on 4th& 5th December 2018. 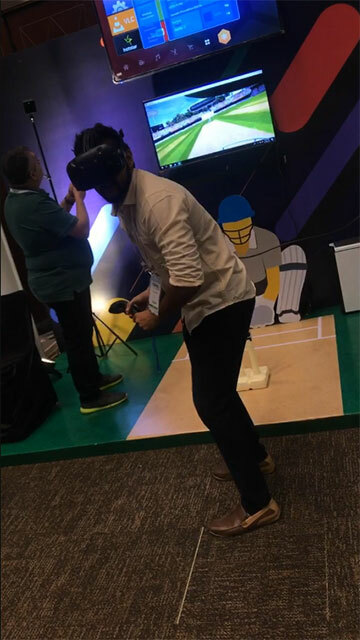 I enjoyed lot, learned lot, the expo hall filled with fun games. I saw people who tried to bring back best gaming cultures. I introduced myself to many top lead developers in the field. The panel talks were so interesting and educational. I learned rendering techniques to optimizing code. 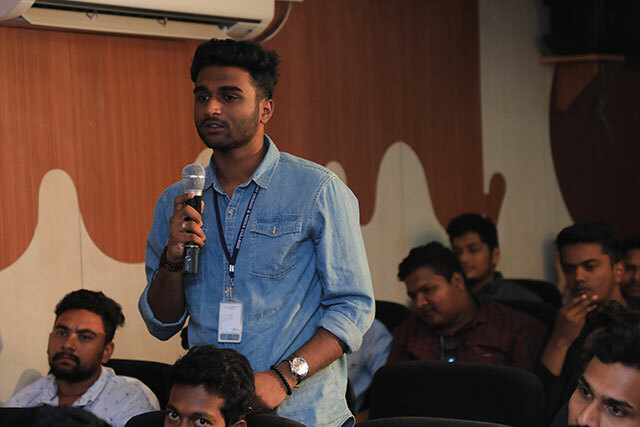 The talks was by many experienced industry peoples, so they shared the many common problems one could face in the game development. 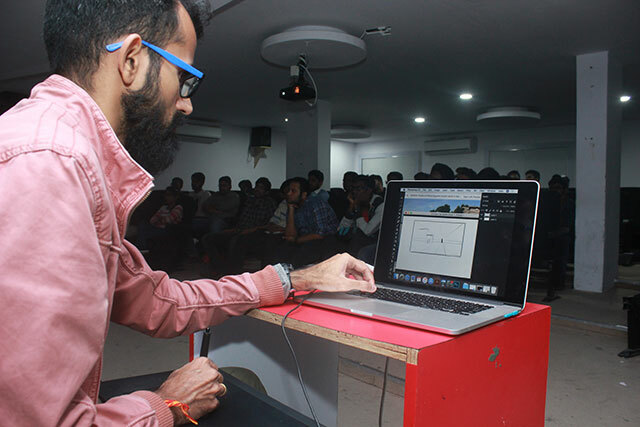 Our Alumni Mr. Rupesh also had a talk on real-time renders which gave me a boost in improving the render quality of my projects. I learned many 2D features of unity which i thought will be fun integrating into my own projects. I found interesting talks of Mr. Jones Boetel , lead programmer of the game - subnautica. He was speaking about streaming open world contents extending unity default terrain to a something voxel based terrain system which gave features like underwater caves , which the game mainly focus on. 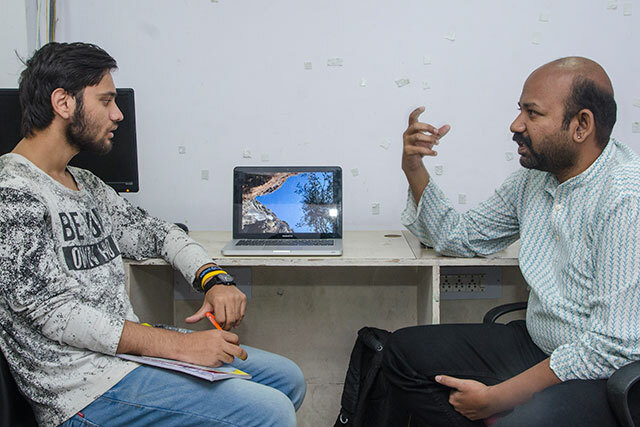 He shared many techniques on optimizing level data, so that we could extend the game area. I learned many new 2d features of unity from Mr. Rus Scammell who is the senior product manager of 2d in Unity.He was saying about 2d sprite shapes in unity , which i felt very powerful tool for world building in 2d, it helps to make organic levels in the different shapes i could think, he also explained how to extend this tool via scripting in C# that made me to think about various possibilities then he was saying about 2d rigging and animation ,it was an amazing feature inside unity that every artist will love, it helps to rig sprites directly inside unity and weight paint them and also animate with animation timeline, this reduces lots of problems and time. It helps artist to not worry about external software's which already do these kind of things , but a bit complex, unity offers these features in very few steps in few art pieces and few minutes of clicks anyone could rig and animate characters or any other sprites into unity, this tool gave me many ideas on developing my own 2D platformer in which previously i was worried about the animation part, but this tool gave me a hope. Finally the event also had a game awards show. 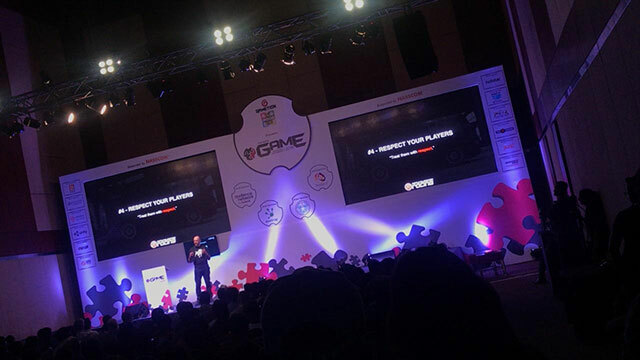 I saw many good indian game nominated for the game awards, many indie titles games in every genre, good developing team and lots more.The awards had different categorizes like studio game of the year , student game of the year , indie game of the year , and many. 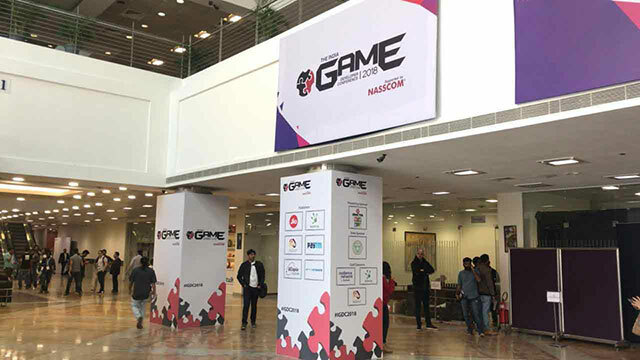 Good talents were praised through these events , which is a great thing for gaming culture in india. 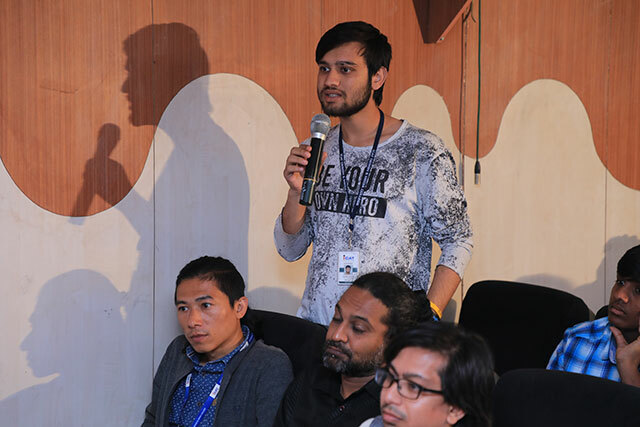 Overall the event gave me more interest on developing my own games ,, and bringing it into the world gaming. 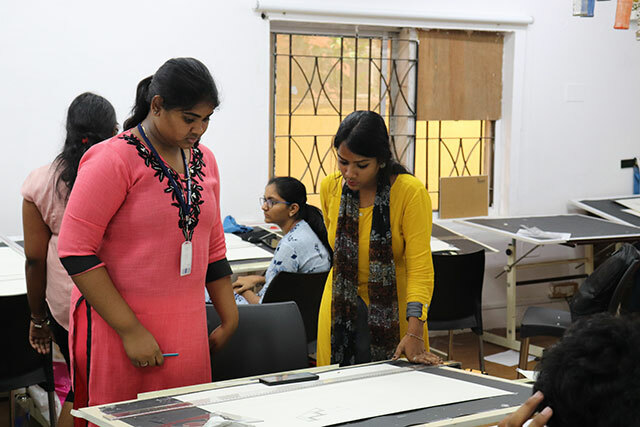 As a part of the study Module EADC (Evolution of Art, Design and Culture) we the students of Graphic Design Department were taken to The Government Museum and Gallery of Contemporary Art at Egmore, which is the second oldest museum in India after the Indian museum in Kolkata. 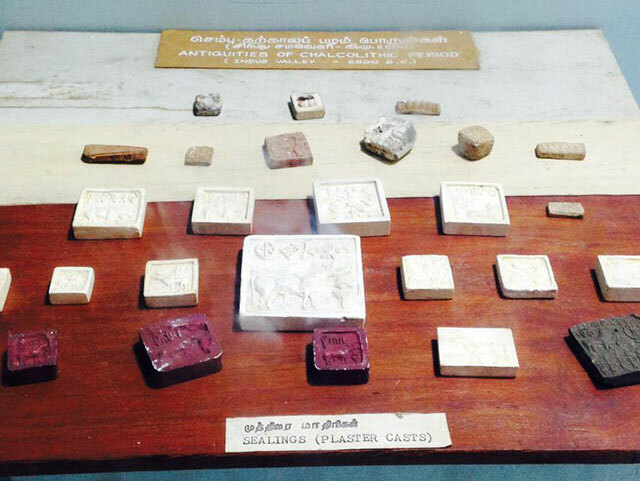 The museum has extensive collections from the Indus Valley civilisation (Mohenjo Daro & Harappa) seals to stone carvings of gods and goddess. 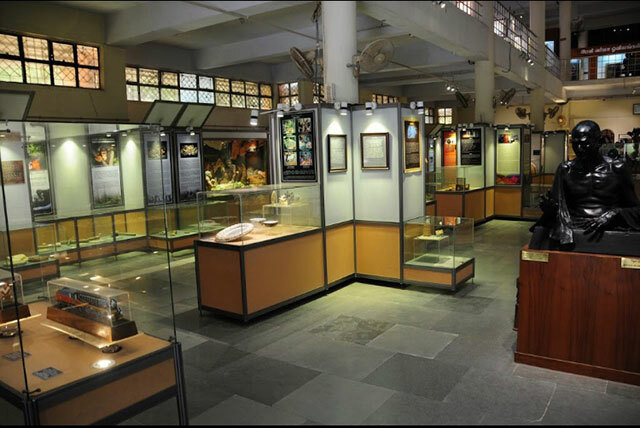 This museum has several departments like history, classical art, musical instruments and world civilisation. An enormous collection of weapons used by the East India Company takes up an entire section.The trip to the museum and the art gallery was an edutaining trip as we got to learn various types of art in the form of reliefs, paintings etc., We enjoyed this trip and hope to go to such places for learning more about art. 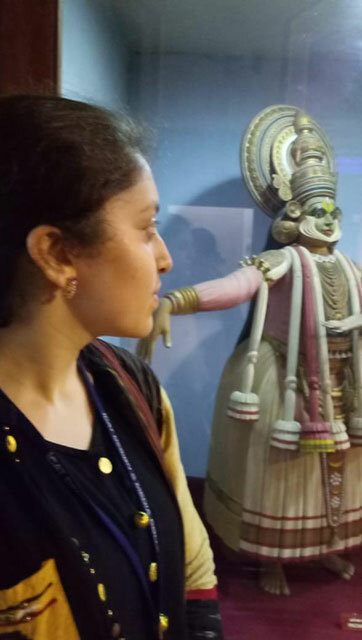 A visit to a museum is always interesting and educative as well, it makes us familiar with the history, culture, civilization, lifestyle, art and architecture of various cultures. 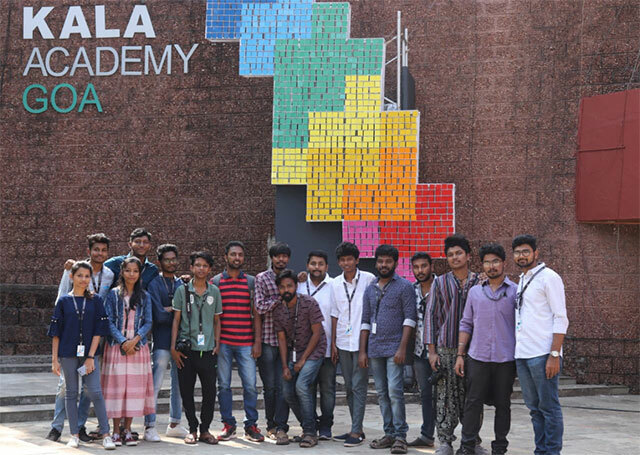 A field trip was organized by our college and we the students of Graphic Design and Animation departments got an opportunity to visit the Government Museum and Contemporary art gallery in Chennai. 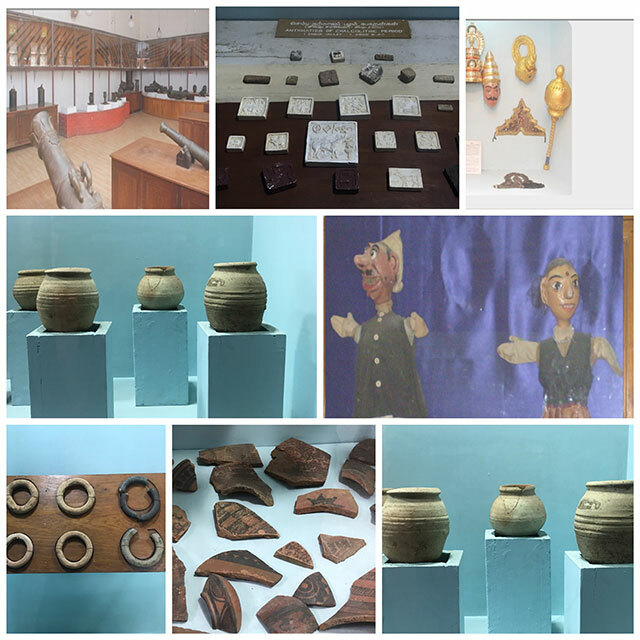 It is a museum of human history and culture located in Egmore, started in 1851, it is the second oldest museum. 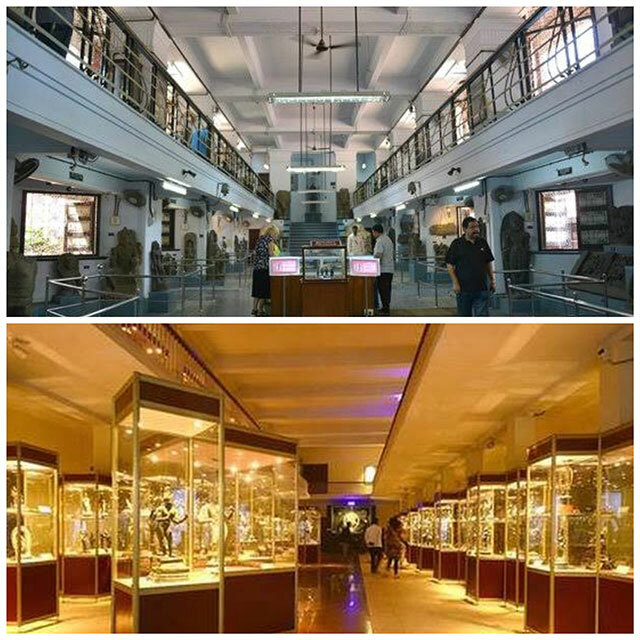 First we visited the arms gallery (Anthropology section), The entire hall is displayed with ancient weapons and armours like heavy sword, spears, daggers, body armour and also with the guns and cannon used by the East India Company and then we moved to an another hall which displays the seals, jewelry, pottery and the other tools from the Indus Valley civilization. 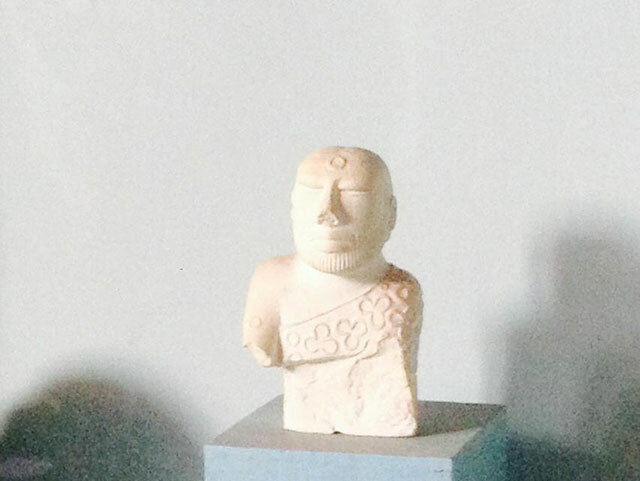 We then moved to the bronze and sculpture gallery (Archaeology section). Here we saw a collection of bronze figures ranging from the early centuries to the recent times. 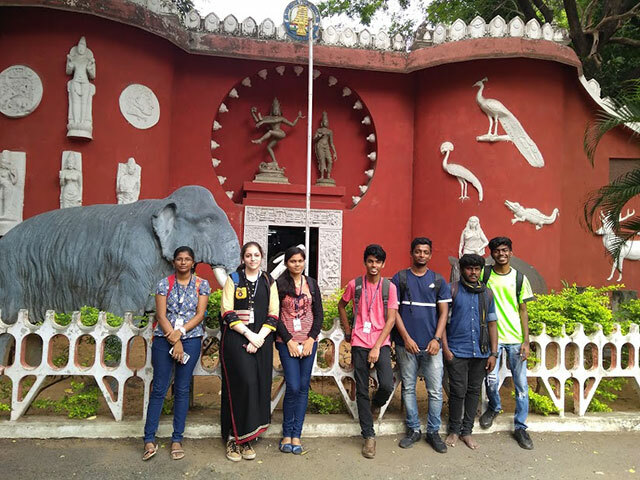 Finally, we visited the Contemporary art gallery which displays portrait paintings of British Governors, modern sculptures, traditional and contemporary paintings, and also paintings by Raja Ravi Varma. This visit enriched our knowledge and learning. 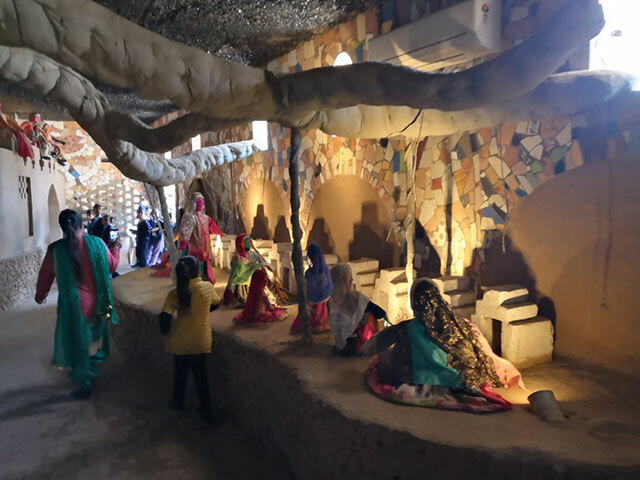 We had a wonderful experience visiting these places since it is indeed a storehouse of knowledge. 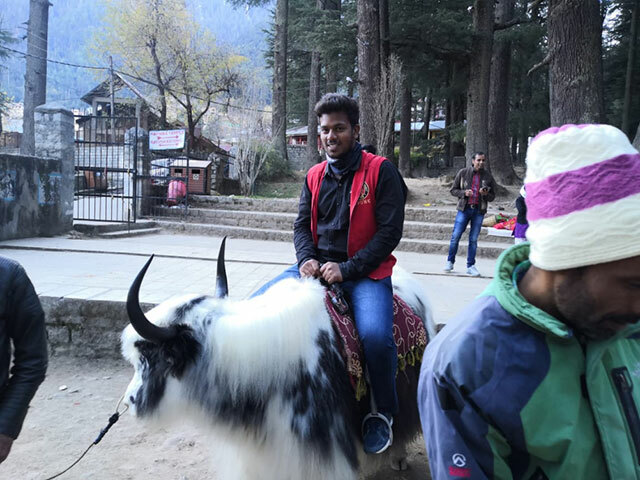 BHUTAN.. One of the most beautiful experiences have started in our life.The traveling which began from Chennai was a really new experience. Starting the day from meeting people and sharing thoughts and experiences with other students from the department. 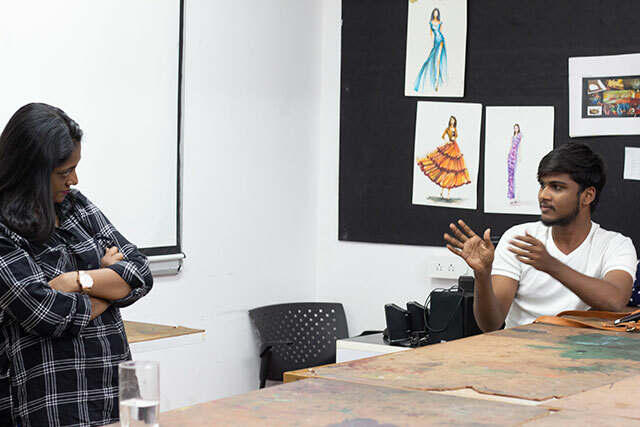 Interaction with teacher from different fields makes you realize there is so much to learn art which is amazing.. Looking and sharing thoughts with other students is the most happening thing. The whole day will be a good time to talk and plan with other students to work on the trip to Bhutan. Looking for the day ahead. Excited and Curious to see the life of Bhutan. 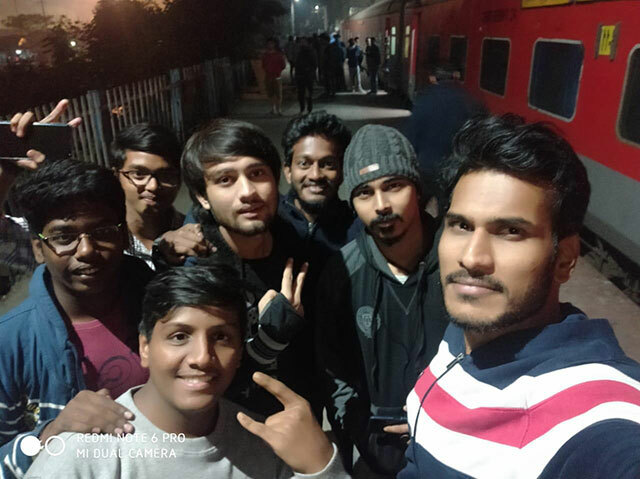 So we board the train on 08-12-2018 at 10:30 PM. We adjusted all our luggage and our seats perfectly. 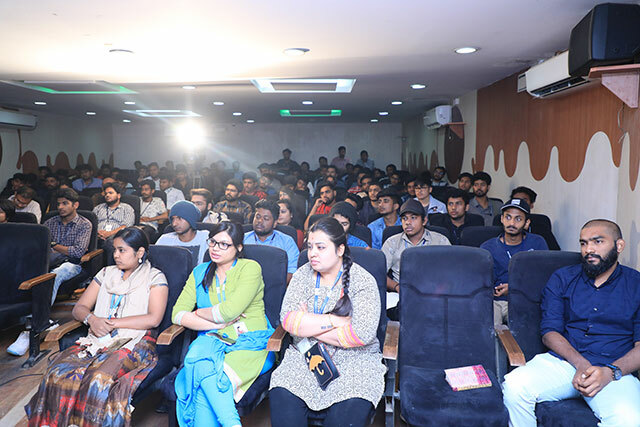 We met Chennai and Bangalore branch students and faculty. They were very friendly and nice to talk to. We introduced ourselves and they introduced themselves instead. Faculty of other branches is also very friendly. We made new friends. All are excited about this trip so far. Everyone is discussing what we going to do in Bhutan. Next day we spend the whole day in the train having fun, discussing photography. We shot some pictures of people, and outside world. Our train was 3 and a half hours late. 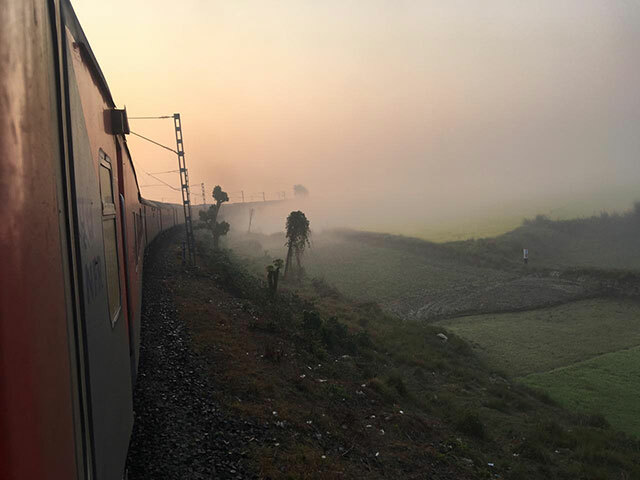 The actual time for it to reach NJP is 5:30 AM but due to fog etc, we reached there at around 9:00 AM. Then we all had a great breakfast and we took a little rest than we board the bus till Bhutan. 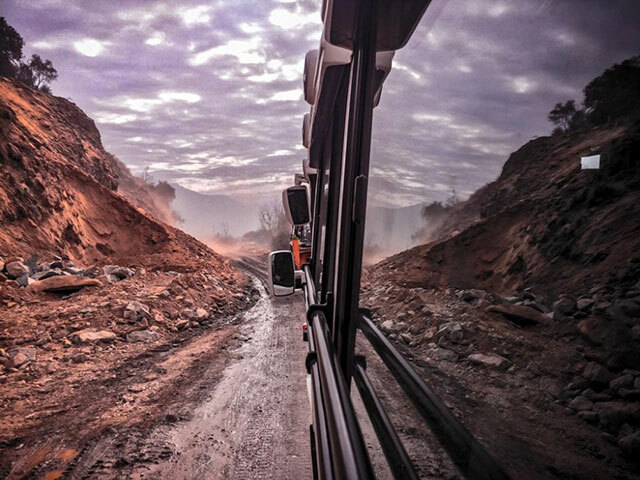 The journey is going on and we all are excited and curious to see the life of Bhutan. 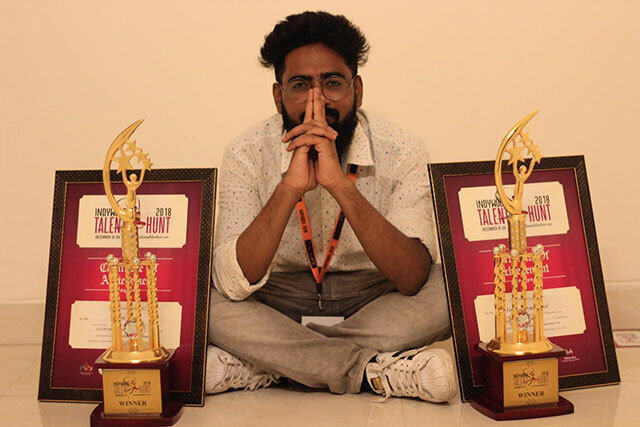 Last year, I went to Indywood Talent Hunt for participating in a character designing competition. I did not win but, I met people. I met people who were different. I met artists who were accomplished and artists who were struggling. We just dream, but there are people actually made them true. But, I got to know all well-established stars are actually human like me and you. What made them different then? 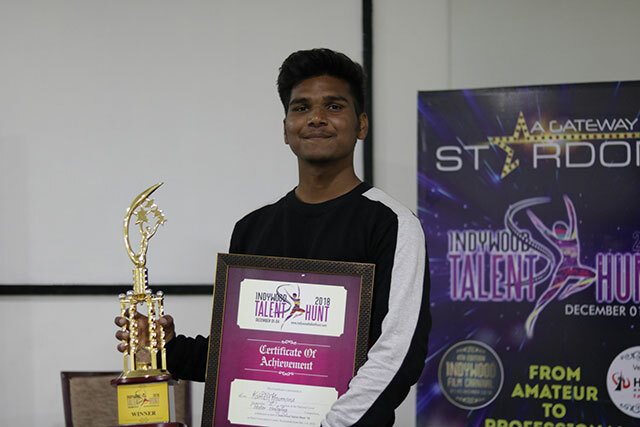 I volunteered for coordination this year Talent Hunt ‘18. When I got close to them I saw those scars, marks, burns, injuries which they got during their journey. They were stubborn, with a never-give-up attitude. Then I told to myself, ‘Set a goal and Stride towards it. If you don't have a goal and a dream you're dead. Crave for it’. My win and my achievement are nothing compared to the experience I had. Yes, it was huge and I had a great time. But, NO! this is not it. I'm still on my way to somewhere big!!! 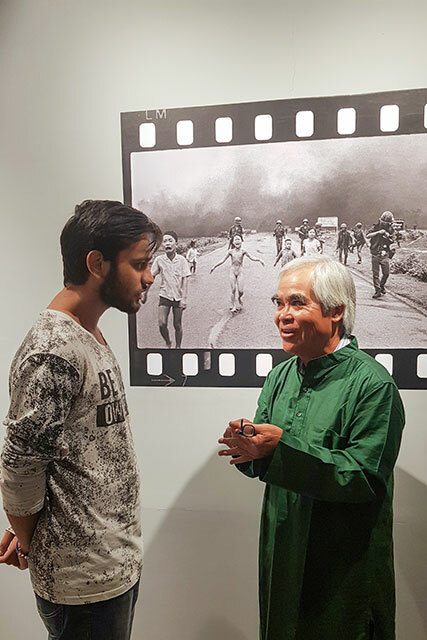 Getting the opportunity to meet Mr. Nick Ut, a Master Photographer who won both the 1973 Pulitzer Prize for Photography and the 1973 World Press Photo of the Year for the photography "The Terror of War", showing a running girl severely burnt by Napalm bombing during the Vietnam War, at the Indian Photography Festival ‘18 was like a dream come true. 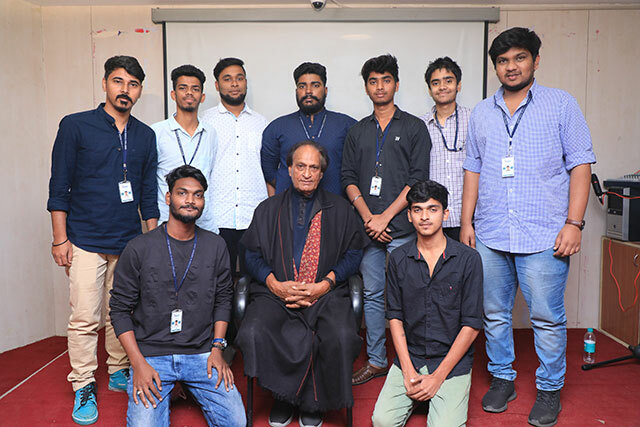 It was an enlightening experience to have interacted with the man who stopped the Vietnam War with nothing but a photograph. I felt so inspired that I promised to myself to produce such a good body of work and make an impact on the world like how he did through his works. The day has finally arrived. The day we were waiting for a long time - Our Bhutan Trip. And this is going to be for hours and hours. Throughout the train journey of almost 2000 km, we were having fun, discussing photography, and of course about Bhutan and our plans there. We shared jokes, opinions, interests, and knowledge. 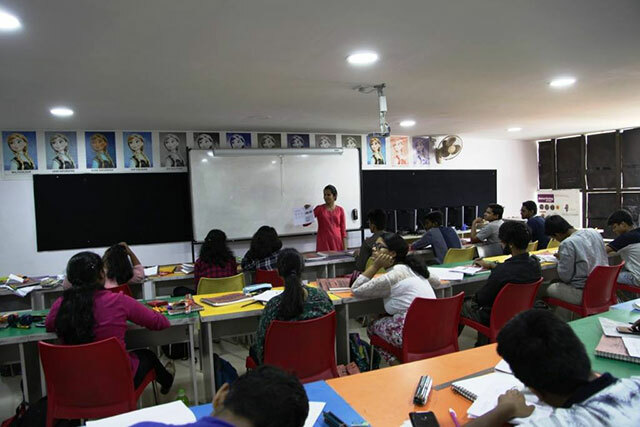 Our faculties Mr.Charith and Mr. Srinivas, who were strict in the classes, surprised us with their friendliness. 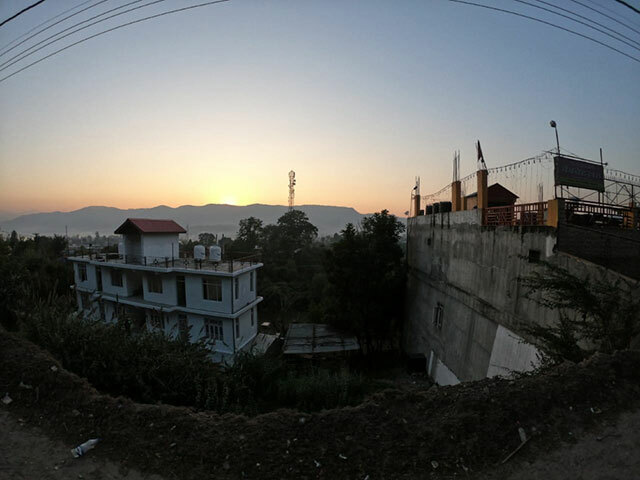 Thimpu, Bhutan is just a few hundred kilometers now, and we are moving towards the border. I am thrilled and really looking forward to this journey to explore many new things and capture those through my camera. 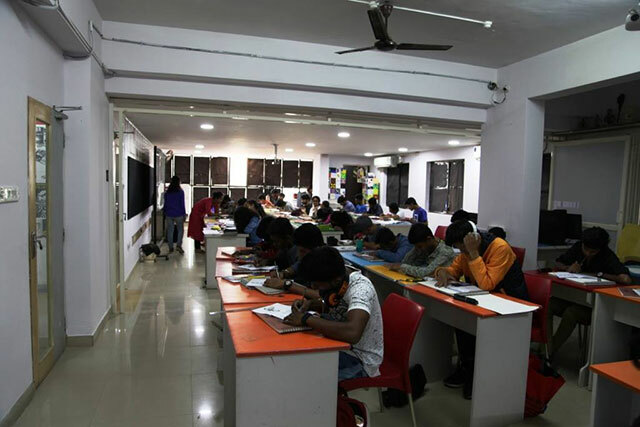 One of the most interesting stages in life that gives you an opportunity to explore is the “college phase”. Life at college is the time when the teenage years end and we all dive deep into the ocean of new beginnings and possibilities. The golden period better equips you for all the challenges you will face in life and creates a strong foundation of knowledge. 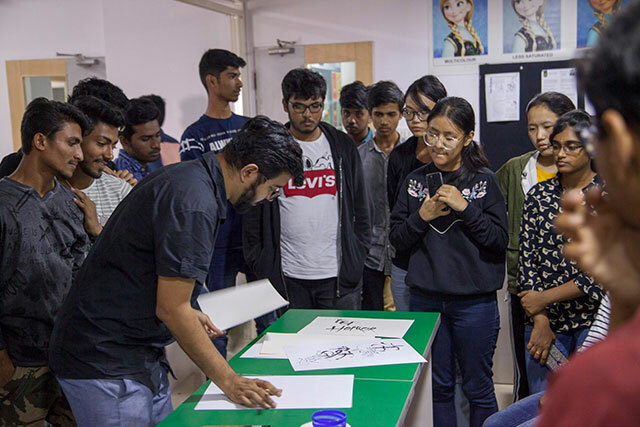 My experience at Icat Design and media college has taught me one fundamental thing – life is unpredictable. It might be good, it might be bad, it might be weird, it might be hectic but still you will be loving it. Basically college life prepares you for all this. Its a perfect blend of joy and hardship. Its been 3 months in ICAT, I meet different people, interact with them, learn about their culture and grow as a person. Here the most important thing to be learnt is how to communicate and how to judge others behavior. Here I educate myself for sitting through presentation lectures, cope up with surprisingly strenuous syllabus. I have got few oppurtunites to learn from few great minds like Ar. 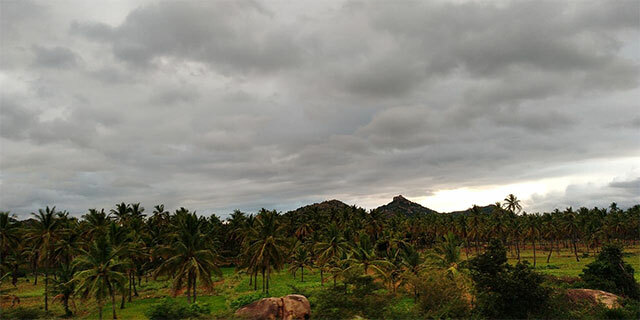 Yuvarani. 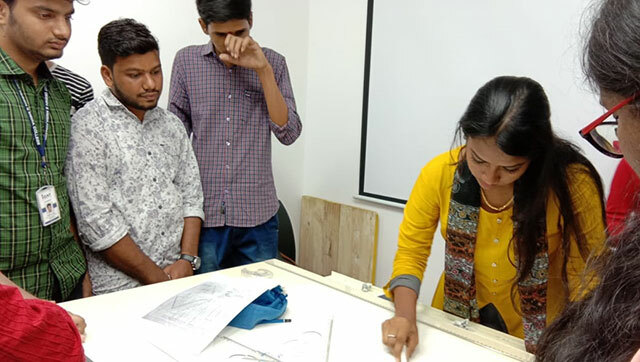 She taught us amazing manual drafting skills in a one day work shop on 10th October 2018. She changed my whole orientation on drafting sheets which in turn changed my working habits. She taught me from how to hold a pencil to get a perfect drafted sheet. I am so thankful to Icat that they gave me the opportunity to attend such knowledgeable workshops. People might try motivating you saying you should only study during your school life and relax during college life, but that isn’t completely true. After starting your college you start on a new journey of your life. 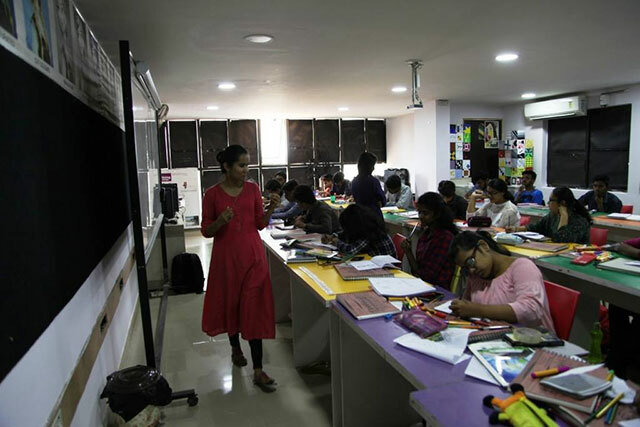 After coming into this college I learnt that learning never ends. Here I share common interests and at times even common ideas, but what makes you different is how you implement that interest or that idea in your own innovative way. 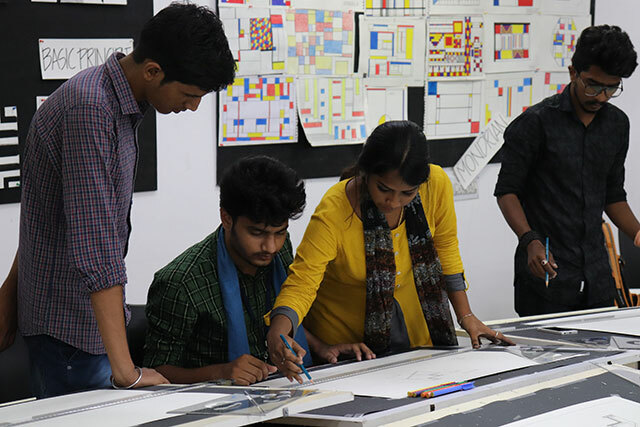 In all these day to day learning, fighting and brain-storming, the faculties of ICAT are always there to guide me, motivate me and keep pushing me to become an accomplished interior architect. 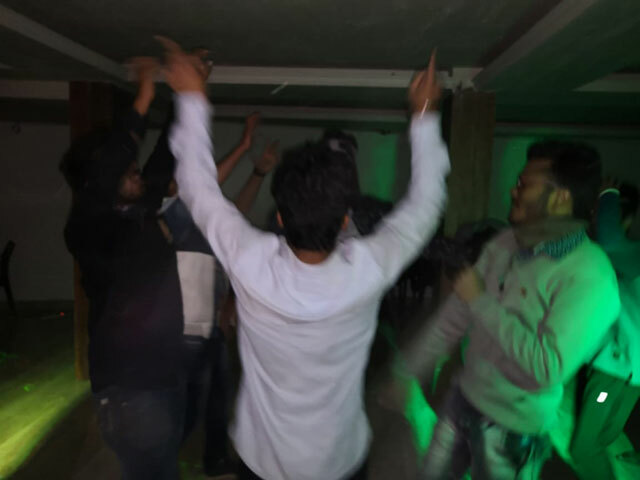 So, one fine day when i will be seeing pictures of my college life having good times with my friends i will definitely land up smiling and rejoicing the memories because that’s the beauty of ICAT it will even stay with me long after i will climb those ladders of success hopefully one day. Life at ICAT is a wild mish-mash of experience as well, There you go guys!! I hope this helped you all to debug some myths about life in and around ICAT. 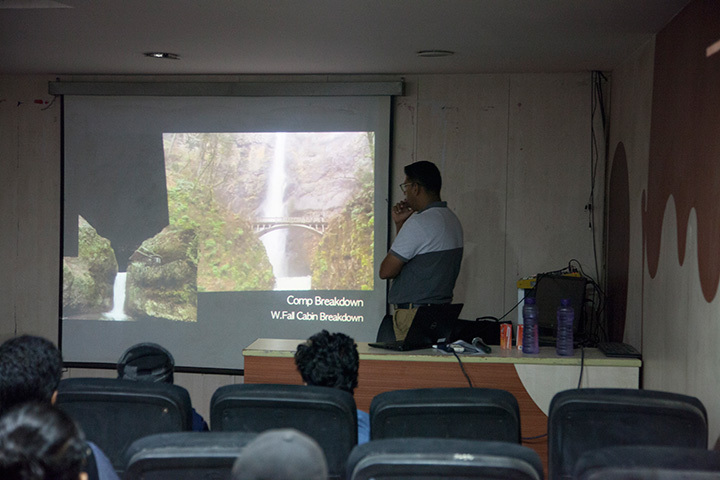 A workshop with srivatsan Sankar was an amazing experience for understanding the importance of traveling. The taught us how to focus on the topic to shoot while traveling as travelers have a lot of problems handling them selfs. The personal experience over the workshop was grate. 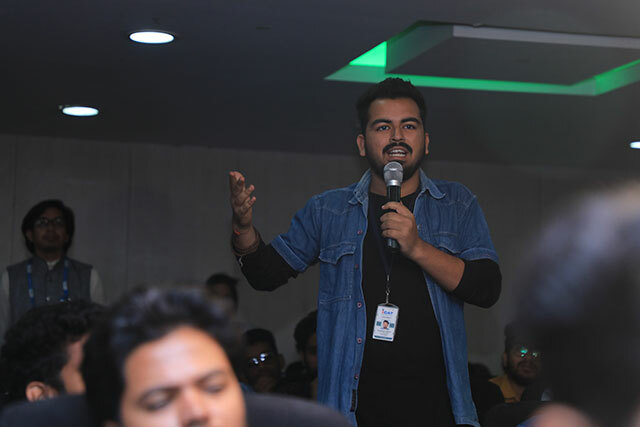 The understanding of putting content in the world was quite easy.. As srivatsan had introduced films in front of us I was pretty excited to talk and share my ideas to him. It was good talking to a expert about how does the world revolve around the photographer. 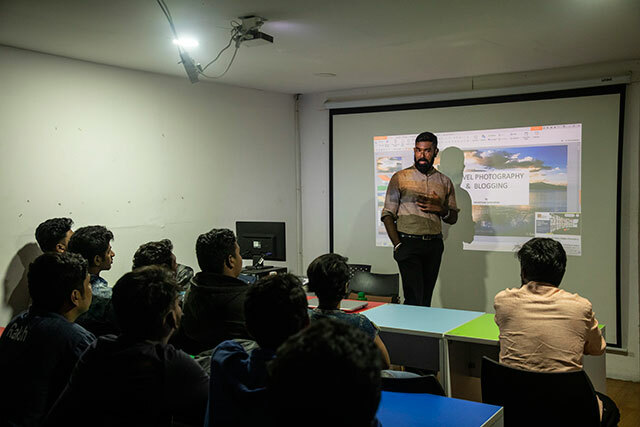 Today's workshop on Travel photography by Srivatsan Sankaran sir (Travel Photographer , Founder-Madras Photo Bloggers) was really great.I was really a great experience for us.We learnt a lot from him,for example how to plan oru trip,how to do research,blogging tips,travel photography basic tips and a lot.The best part is he guides us how to plan and what to do for our upcoming Bhutan trip.We assure that we will implement whatever we learnt today in our Bhutan trip.I personally thank our college management and our faculties for this wonderful and great Travel photography workshop.I thank Srivatsan Sankaran sir also for spending this worthy time with us. We are hoping for many more workshops like this.Thank you. I wanted to participate in the ‘Indywood Film Carnival’ since I joined ICAT as I heard a lot about it. I registered for the IFC 2017 but, there were better people than me. So why would they select my work, right? My design didn't get selected. I took that as a challenge and started improving my skills. 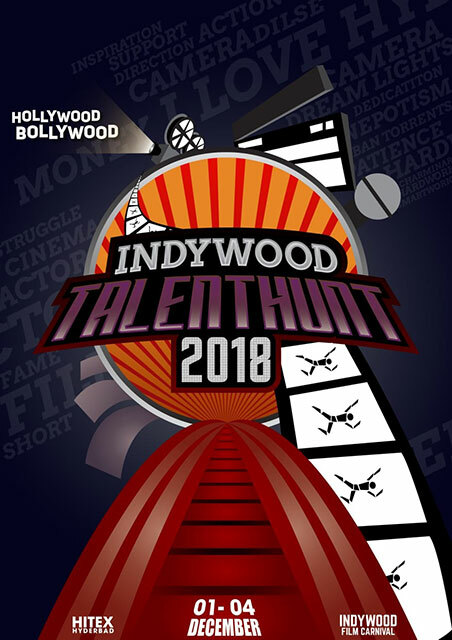 This year ‘Indywood Talent Hunt 2018’, I submitted my entries for the Poster Designing Competition. Then I got a call informing me that my work is shortlisted for finals and asked me that if I wanted to compete in the finals or not. 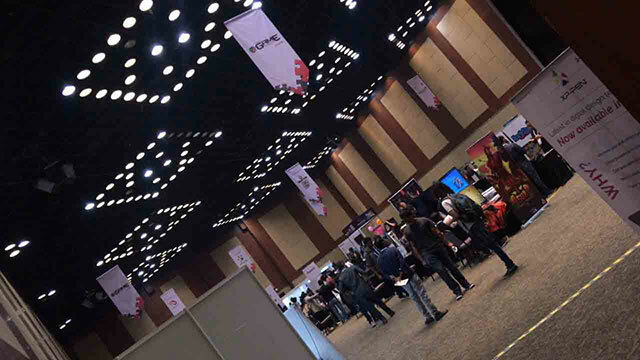 When I reached the venue, it was a huge crowd of various creative talents from different fields. 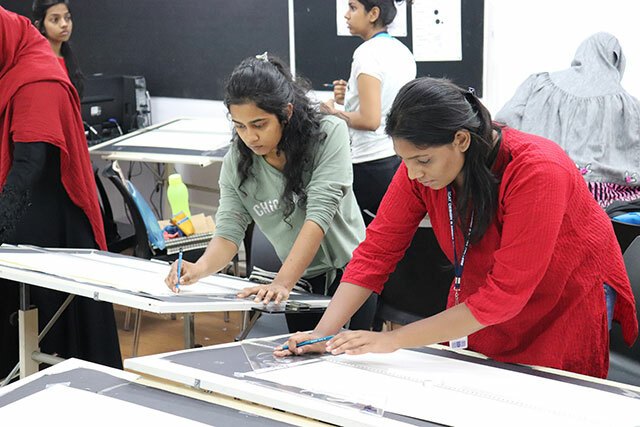 In the finals of Poster Designing, there were 26 designers from all over India. 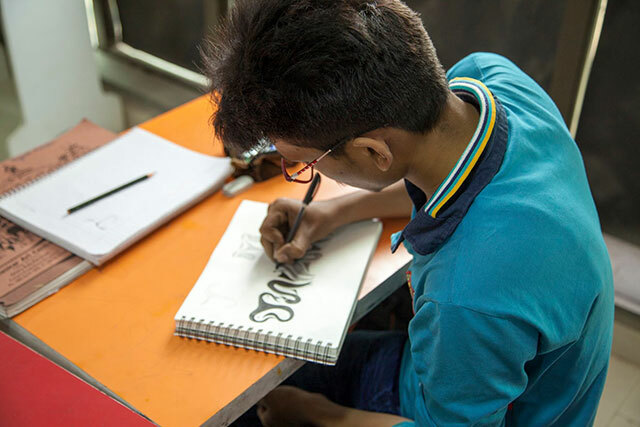 Some were designing the poster manually and some were doing it digitally. More than worrying about winning, I started working on my design for fun and experience. Later, when they announced me as the WINNER, it was too hard to believe as there were so many other good designs. At the same time, I felt proud that my Poster design won over the other good designs. I was feeling like “Okay! You did it. Go get it”. The whole experience was great and good vibes were everywhere. I recommend to our college to encourage more of our students to attend the carnival and participate in the talent hunt as this will expose them to talents all over the country. 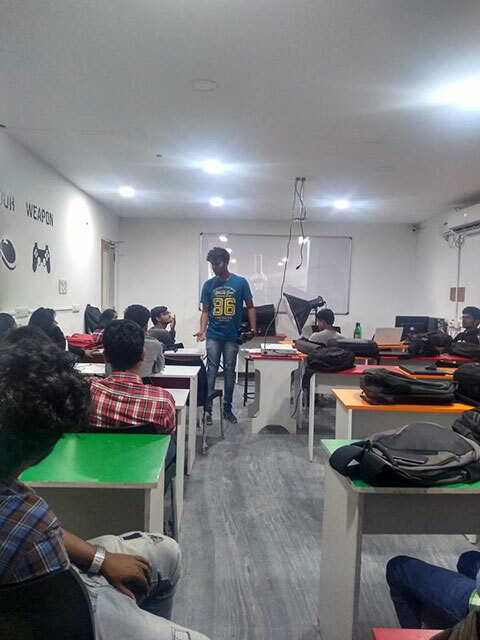 We have experienced and enjoyed our school life to the fullest and now it’s time for empiricing our college life and I have given opportunity to do it in ICAT DESIGN AND MEDIA COLLEGE. I enrolled for BSc. Interior Architecture course. The day I entered this college the vibes around me were very positive. 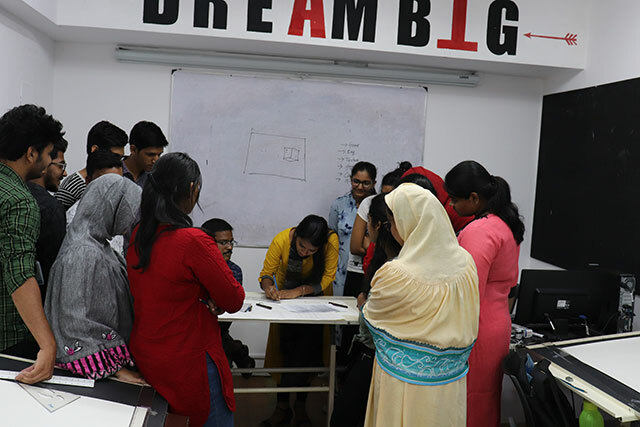 They started our course by an induction program where they explained three years course in nutshell. 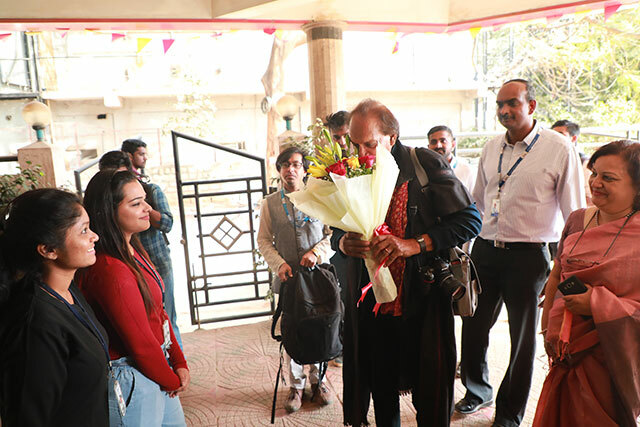 It was a very warm welcome by college faculties and they made every student comfortable by friendly interaction. The faculties here are very humble and supportive. 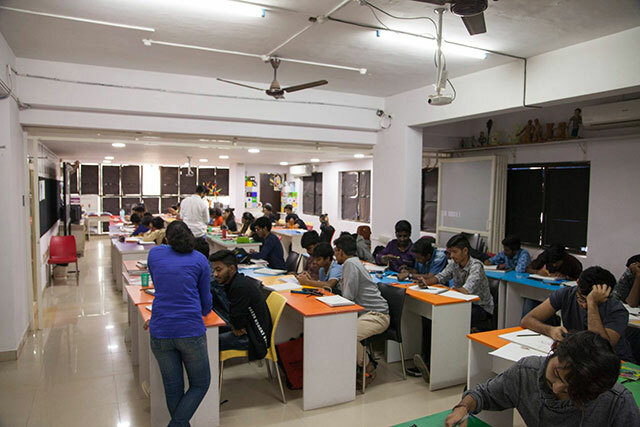 Here we follow more of practical classes than theoretical. 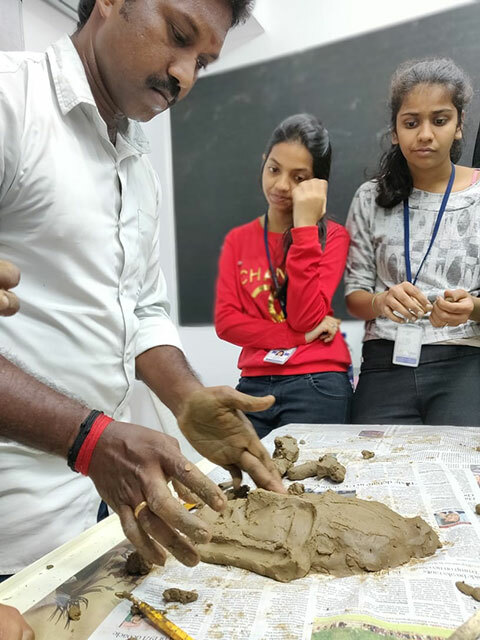 I had a workshop on 24th October 2018 which was held by Mr. Salaman who is a fine artist, I got the exposure towards clay modelling. I made a tribal mask using clay, which was fun. 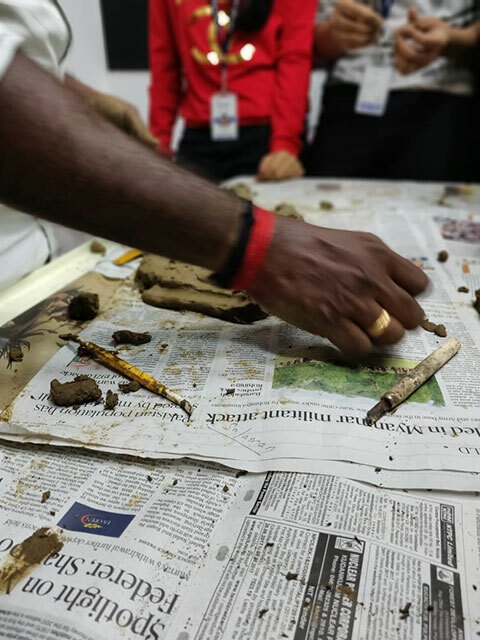 I learnt a lot from the workshop, this makes me feel proud that I’m studying in such college. Today successfully I have completed three months here and I am sure this college will help me fly very high later. 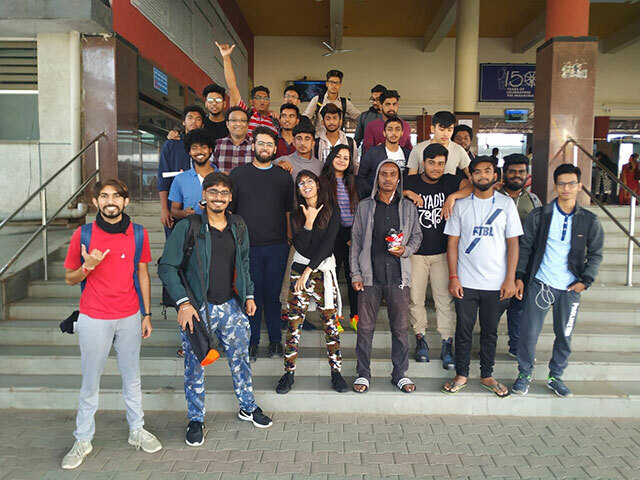 On day 3 of our Goa trip, we went to IFFI 2018 silent movie screening, “yes I'm Mauli”. 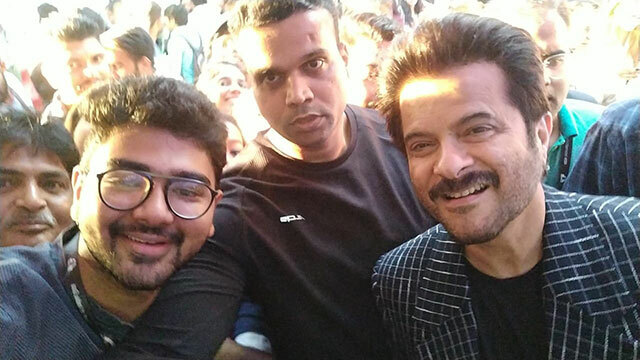 We also went for a talk show with "Mr. India" Anil Kapoor and clicked a few pics with him. 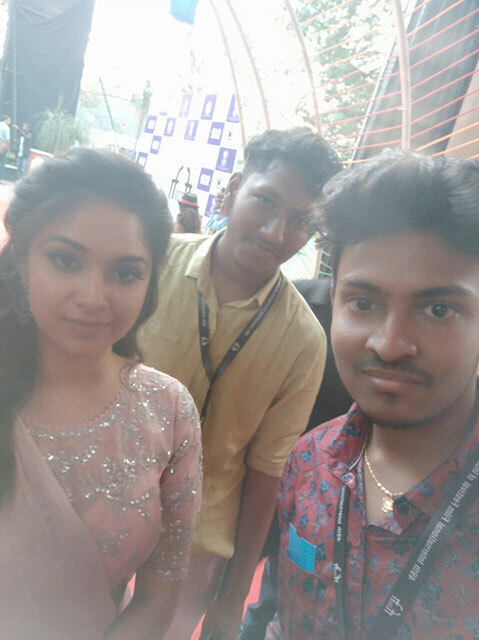 We met various Tamil directors namely Mohan raja, Ram and Gnynavel(green studios) and also some south Indian actress like Keerthy Suresh. 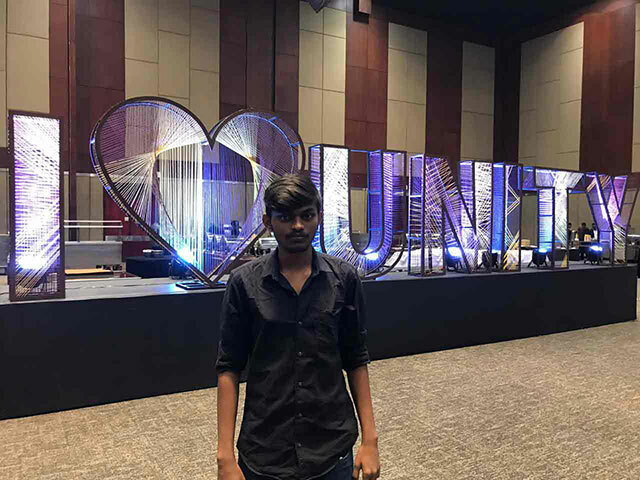 Later that day we again went for movie screening of movie "Peranbu". 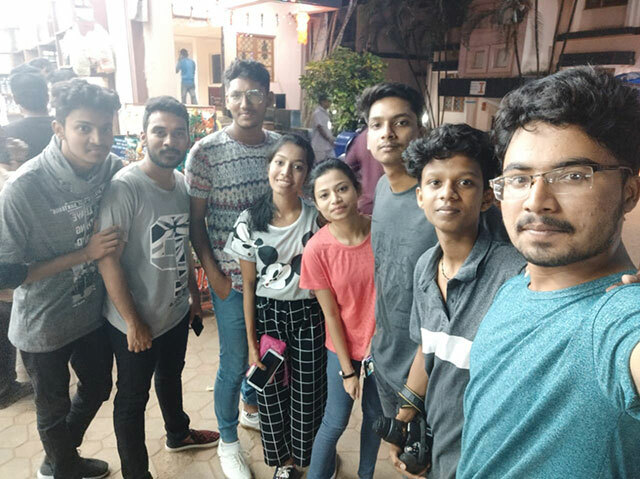 Day 2 at Goa trip Firstly, we have started to visit Panjim market a local market at Goa. Then we went to watch a movie "A Daughter of mine" which is screened at INOX IFFI film festival. We also had a chance to travel on a boat in a River Cruze, which has ended up successfully around 7pm. 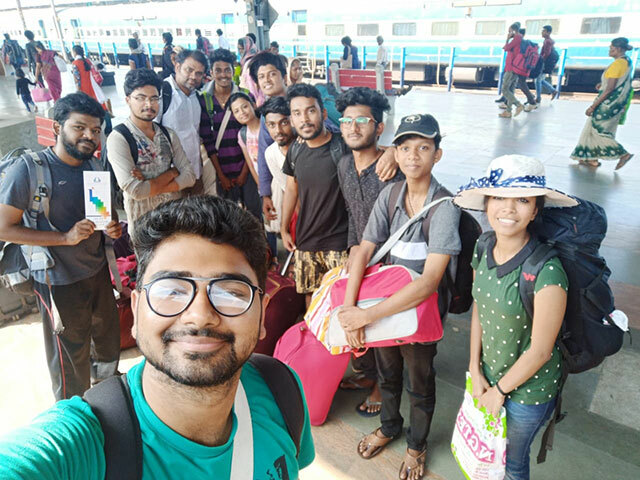 It was an amazing start at 2.15PM from Chennai central to Goa at Chennai Express. 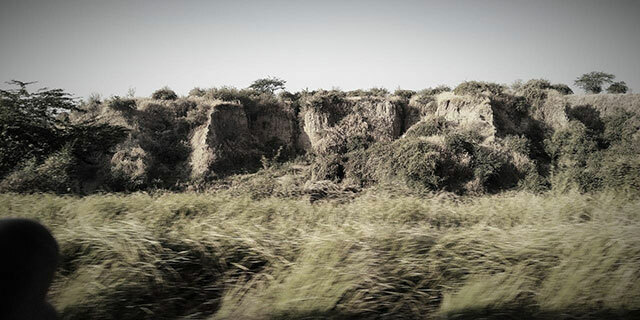 The next day we reached Goa at that morning had breakfast and started for side scene went to Aguvada fort. 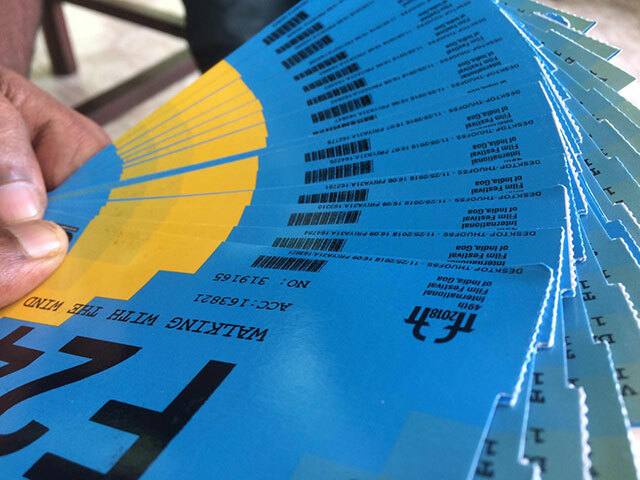 Went to Kala Academy collected our IFFI tickets. We happen to meet few Hindi actor. Got movie tickets for the movie "A Daughter of Mine" which was all that great. 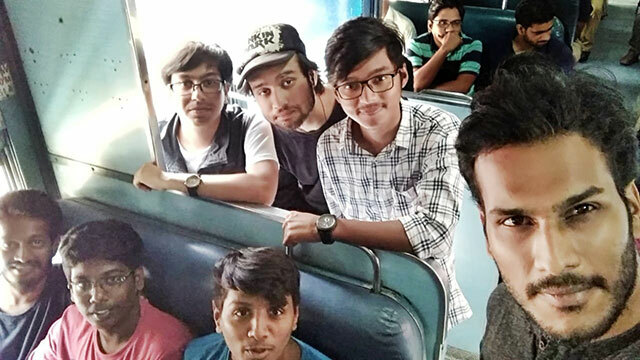 On the last day with all our memories at IFFI we boarded our train back home. 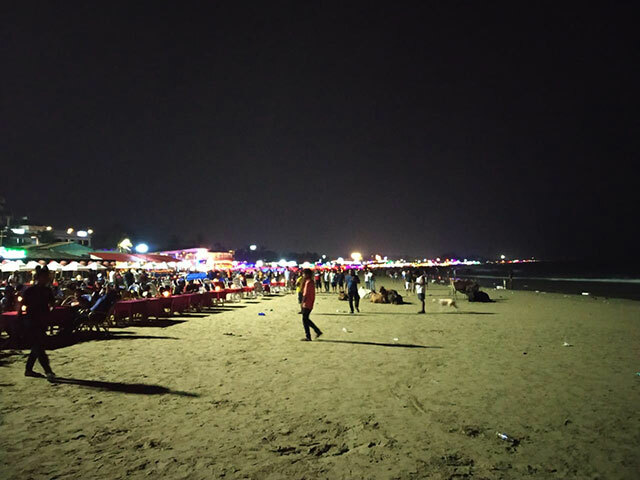 Physical reached Chennai but mentally stuck up at Goa, with memories to fill a lifetime. 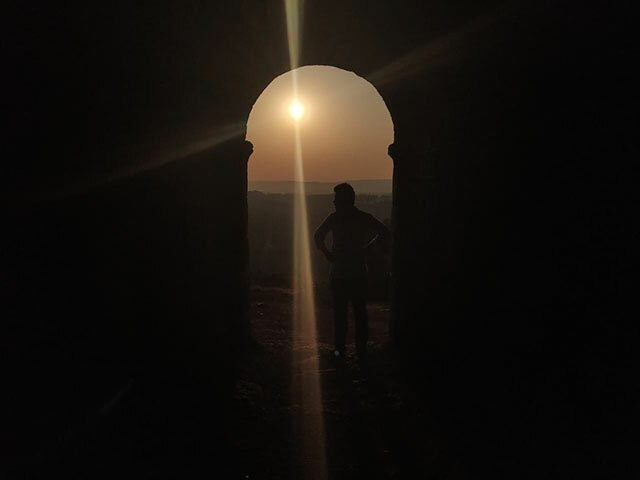 Our fun-filled educational trip to Goa we happen to visit Chapora Fort to watch the morning Sunrise. 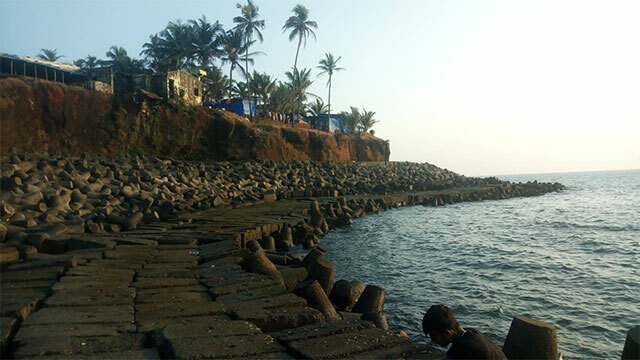 Later, we went to Vagator beach to capture some of nature's beauty. Then we came back to our resort got into the train around 3pm. On 28th November 2018, at IFFI festival near Maquine palace Inox we met Rakul Preet Singh and Diana Penty. We took few photos of them and got a chance to have a quick conversation with alot of questions for which they graciously answered. After that we met few film directors from both Malayalam and Tamil industry. 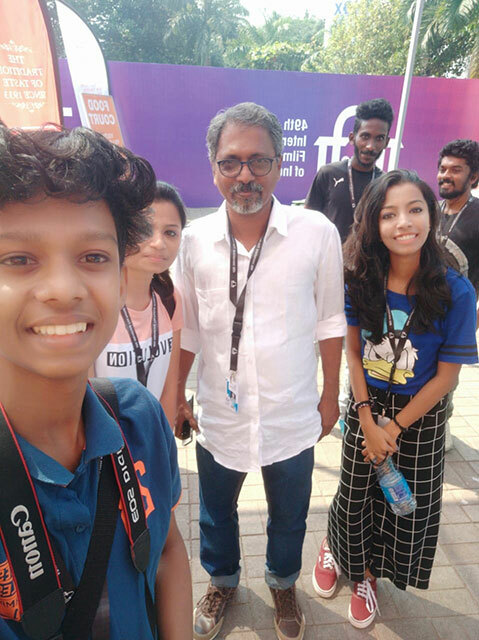 Abrid shine, Malayalam movie director famous for his movie "1983" which screened at IFFI, and Lijo Jose pallisery, won best director for his Malayalam feature film "Ee.ma.yau". We met spoke and took photos with them. 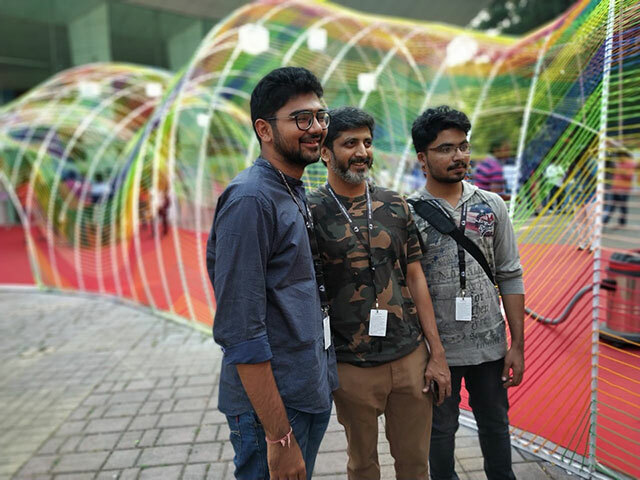 Later then we met film director Mohan Raja of blockbuster Tamil movie "Thani Oruvan". 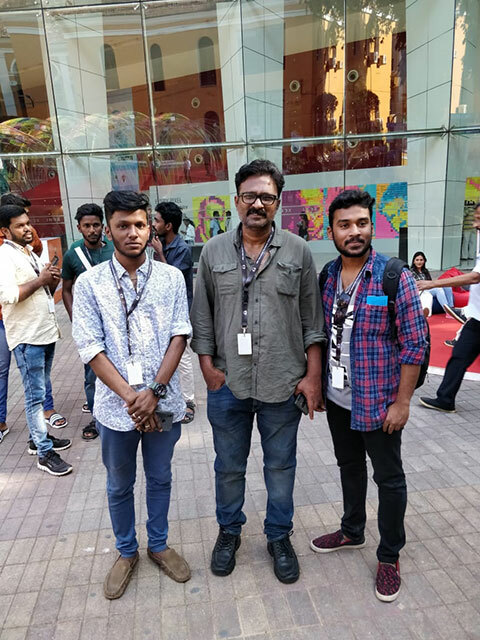 We also met few national award winning director like Jayaraj and Ram. 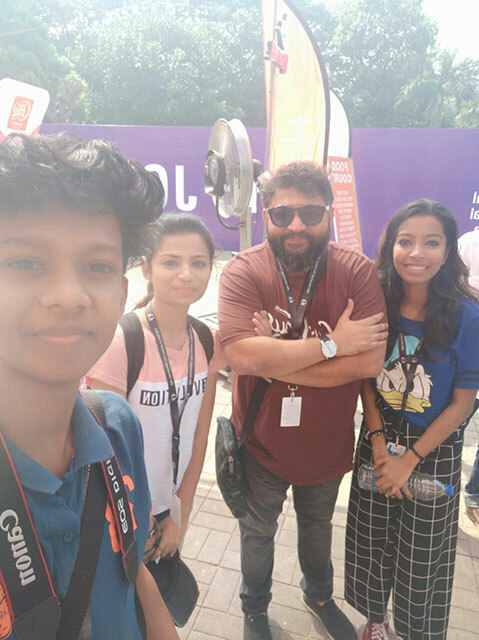 Director Ram’s "Peranbu" movie director was screening at IFFI. 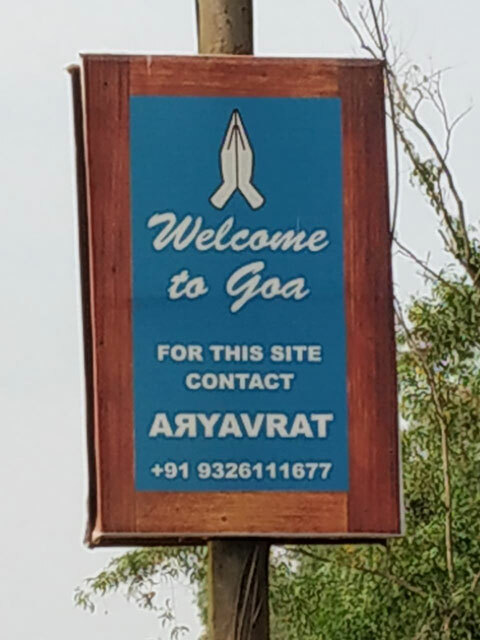 We also had a chance to visit few local blissful and beautiful places around Goa like Anjuna rock beach and many other places. We also happen to do some shopping. We all were so excited to meet and talk to these brilliant people. 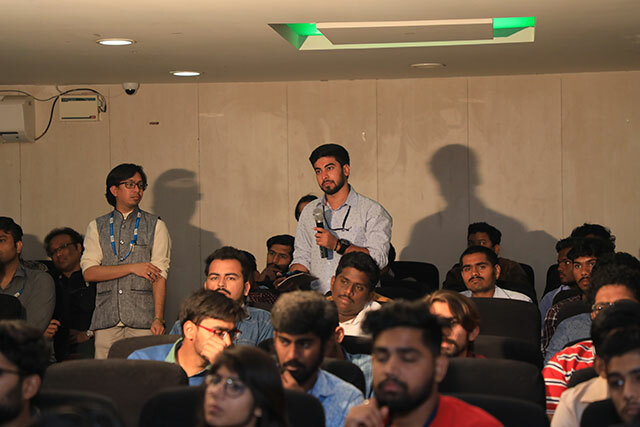 IFFI gave us a wonderful platform opportunity and we are all so thankful to be a part of the festival. 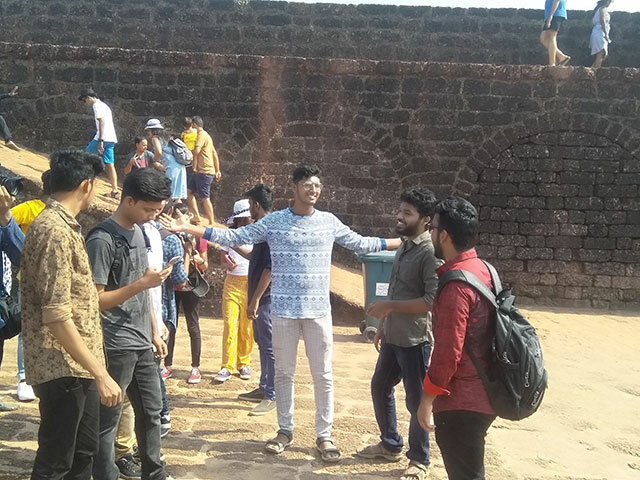 Today we went to the Chapora and the Aguada fort. Standing in a location that has had blockbusters shot was surreal. The intricate architecture on the rusting fortress while it was raining was stunning. It was an experience that we will never forget! 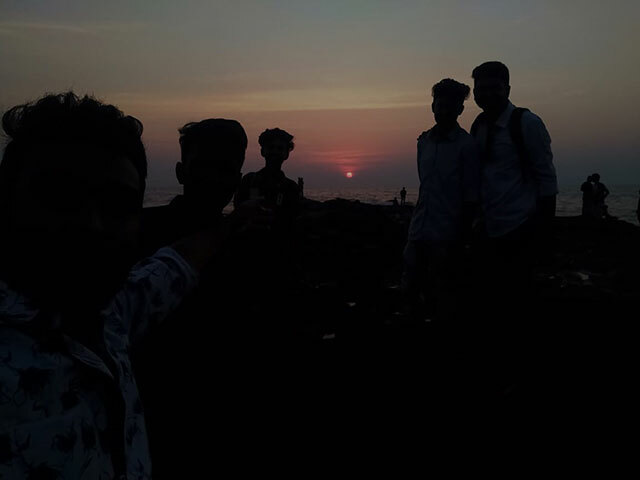 The last of Day of our Goa trip To Anjuna Beach was quite a memorable one for me because we were able to encounter beautiful sunset at the beach as well as the cold breeze of wind and sound of raging ocean water at seashore made it more perfect. 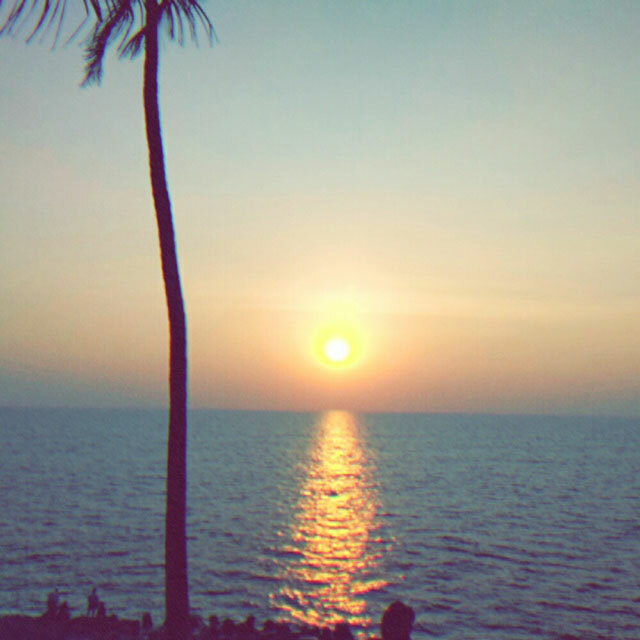 The way my mind felt peace and contented, I said to myself, "Watch more Sunset, than Netflix". 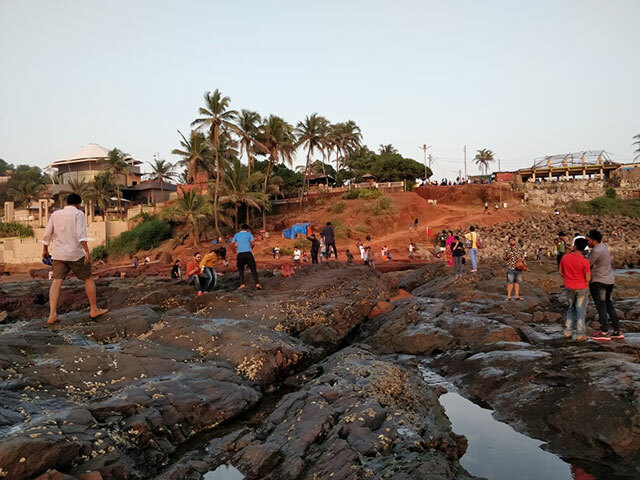 In our trip to Internation Film Festival of India (IFFI), Goa, we visited a beach and that was one of the most beautiful places of Goa. 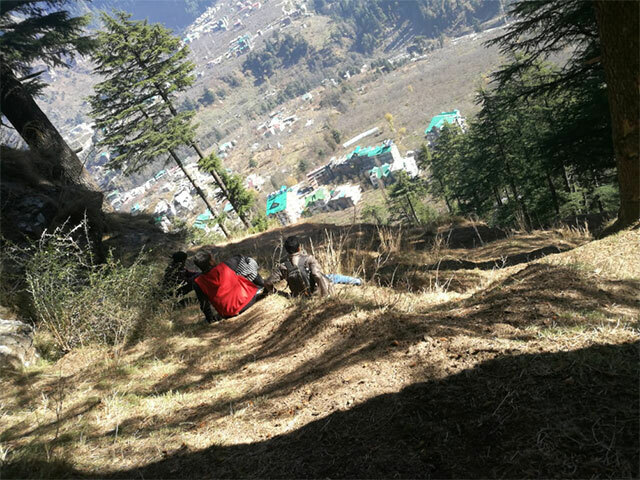 I was very much connected to nature and it gave me new perspectives of the same old things I was seeing till then. I felt the ocean waves speaking with me and the sunset showing all its beauty. 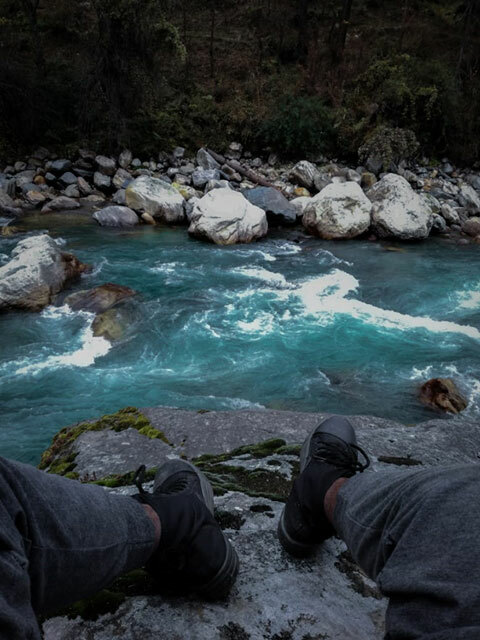 The more I was indulging in nature’s fascination, the more I lost myself to it. But there comes the reality check. 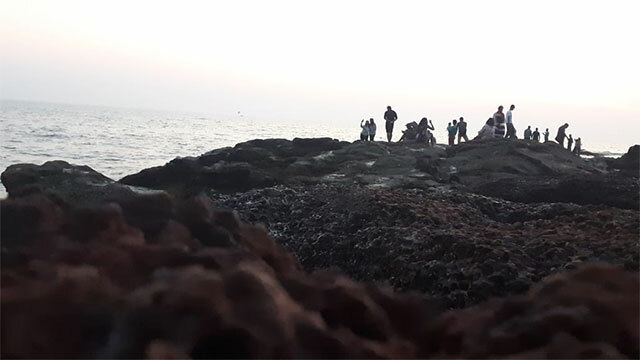 While I was walking towards the water, I really got scared of the rocks and stones on the shore, as those were slippery and sharp. To reach something awesome, we need to struggle and overcome our fear, I guess. Overall an awesome experience to treasure. 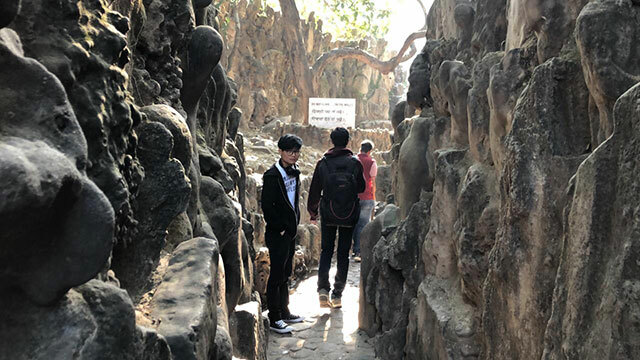 This trip gave me an insight into what I am doing and what I should do. 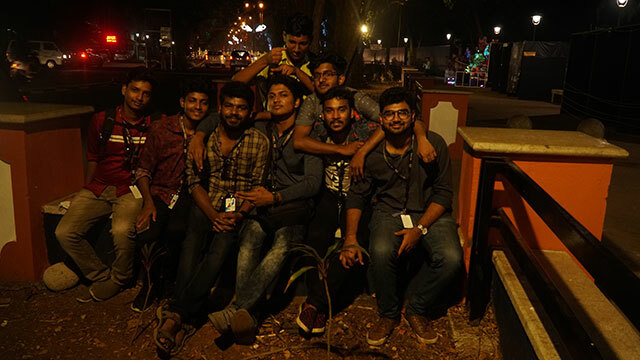 It was an amazing trip with my college mates and obviously had lots of fun and joy. 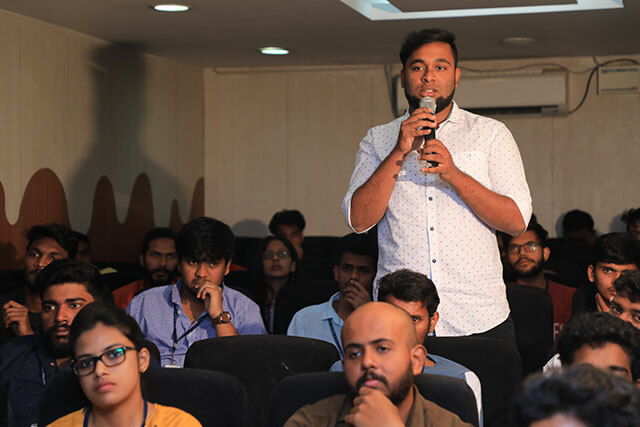 But, more than that, I got to know from many industry professionals about the film pipeline, general mistakes being committed by a filmmaker and also the success secrets. It gave me the zeal that one day I will screen my film in IFFI. 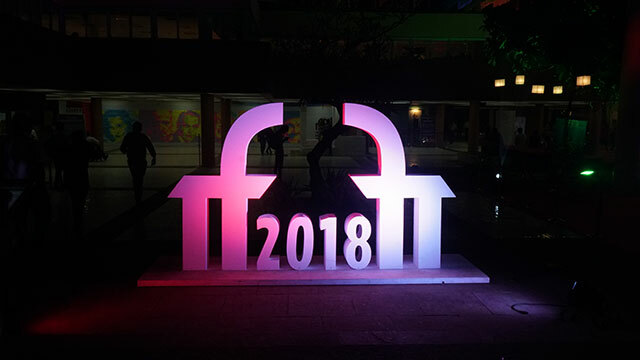 To day we are at IFFI and its a great pleasure to be part of this festival. 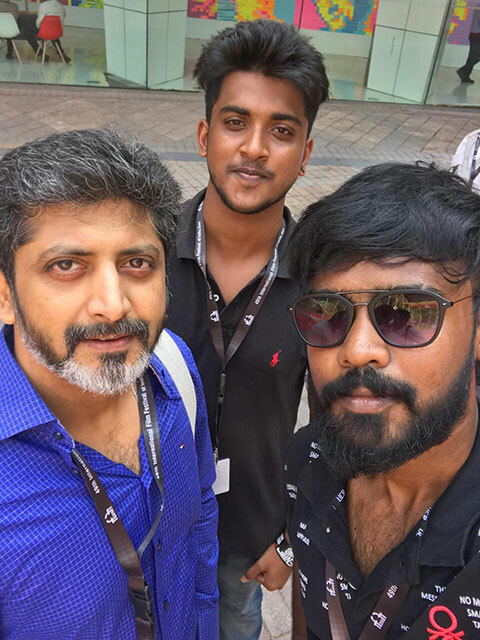 Surprisingly we meet Mr. Mohan Raja, Director of Thani Oruvan. 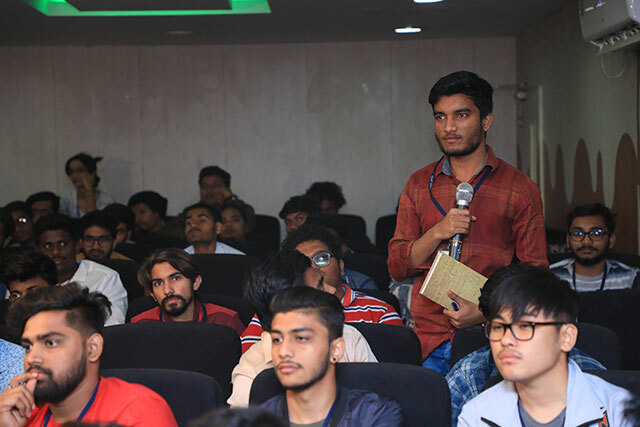 Being our guest at college cultural MIRAKI 2018, he shared few suggestions on watching movies. 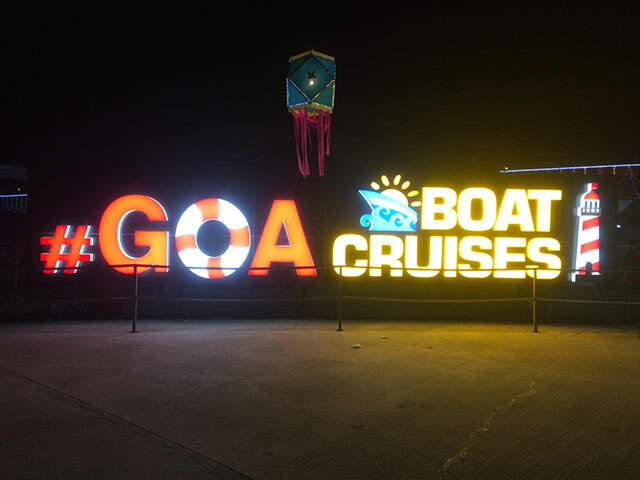 It was a great day to start the festival at Goa. 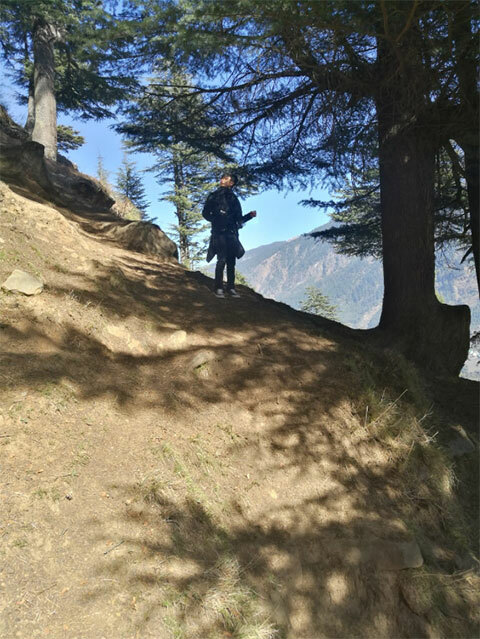 Today we started our journey from kasol to "pahadon ki rani" Shimla. 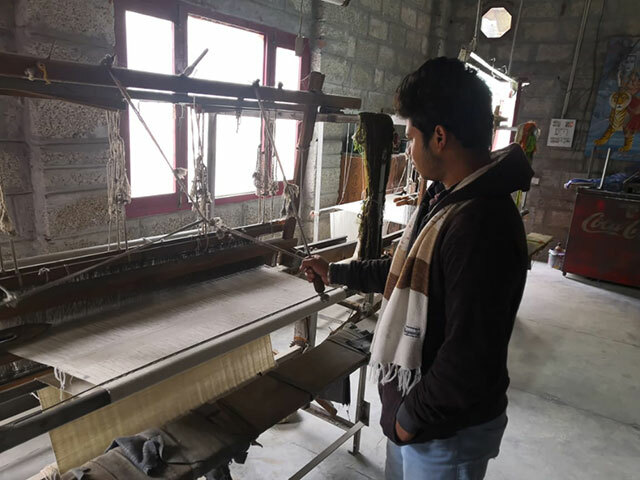 On the way we went to kullu shawl factory where we saw the how shawl are being produced. 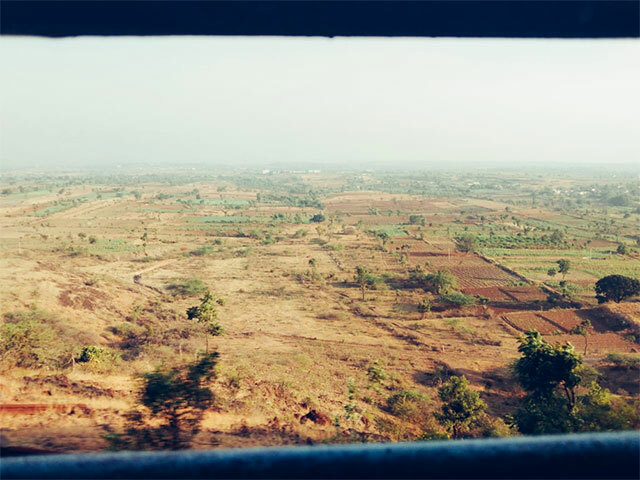 Later we traveled through the valley capturing a lot of scenic beauty. 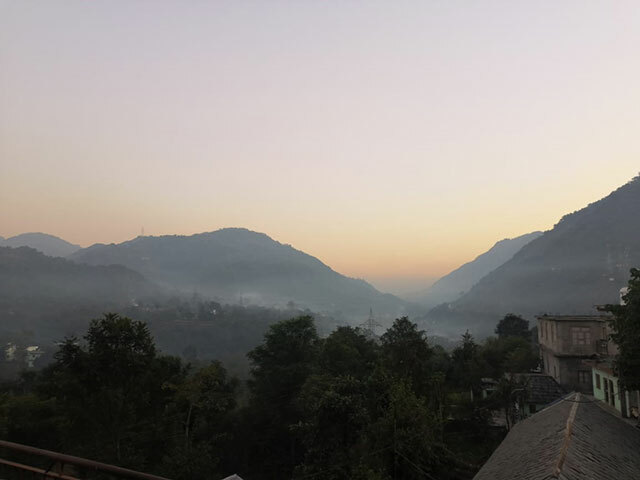 Night we reached shimla. 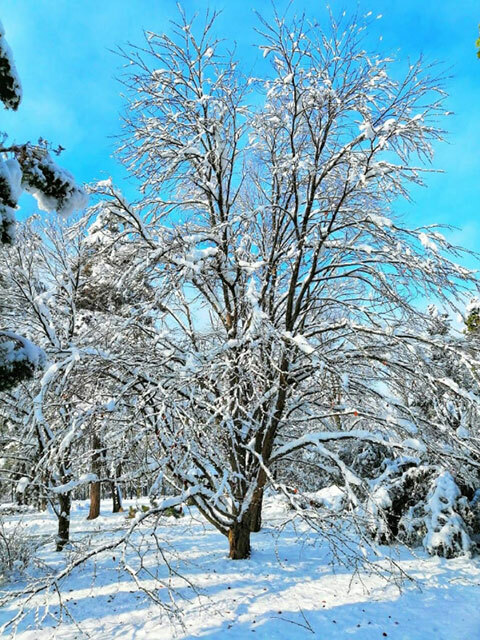 But the journey will be worth remembering for the beauty of nature. 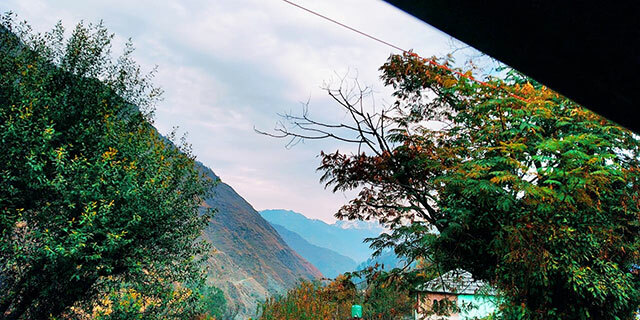 Today we started our journey to kasol which is situated in the valley of kullu Manali. On the way we went to manikaren which is situated on top of hot spring water. 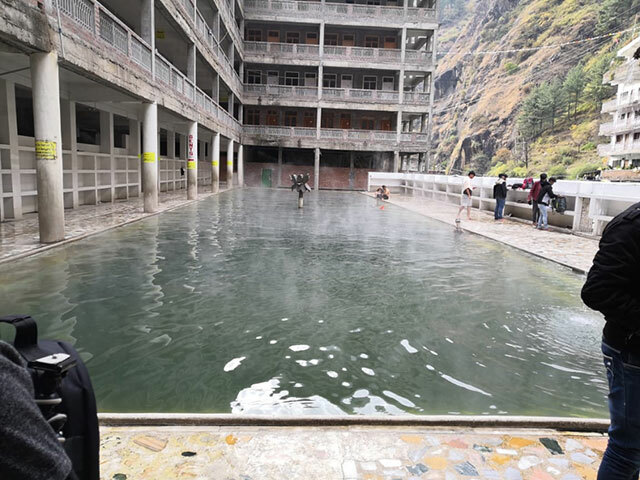 We took bath in hot spring, and found that temperature of water is so high. We relaxed and then went to gurudwara where they prepare food for langer on same hot water. 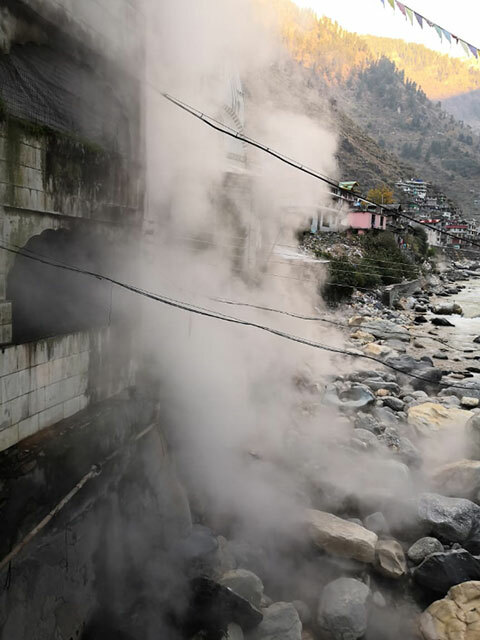 Whole area is on that hot spring. 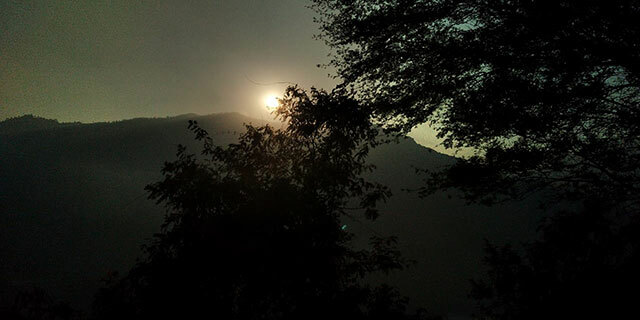 It was amazing to see the nature's mystery. 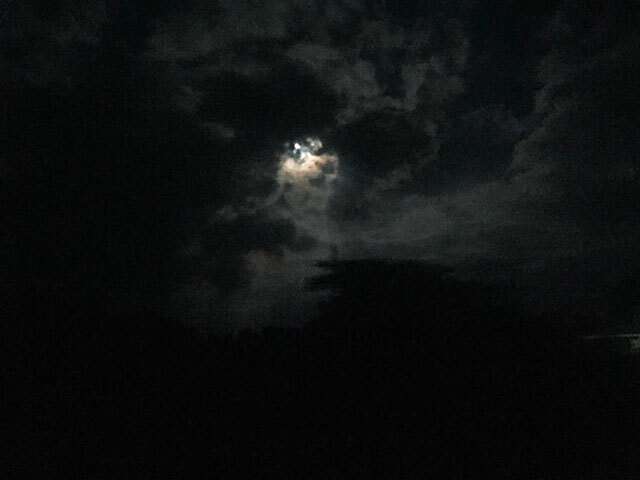 We reached and saw a campfire program under the sky. 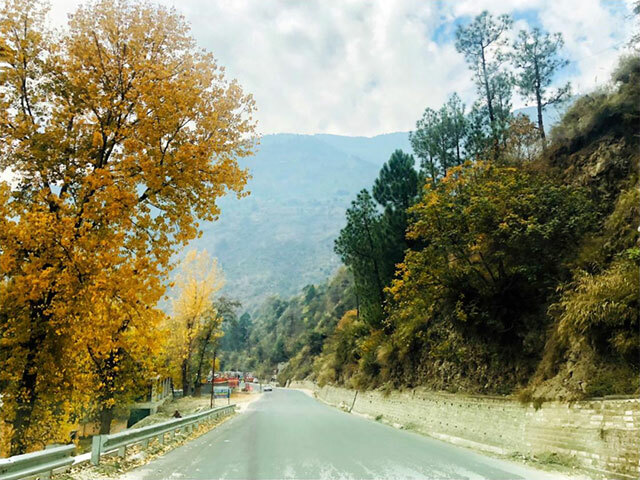 It was freezing cold here but beauty of nature is giving us hot vibes. 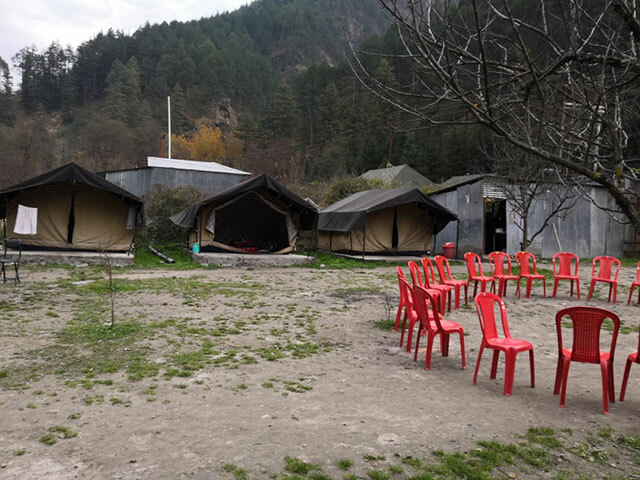 Today we have to spent in tent, which is first time we are doing. It is just amazing experience. 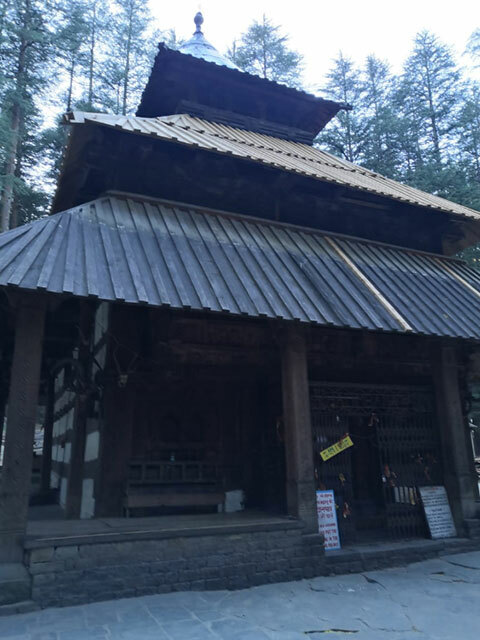 In the evening went to "Hadimba" temple. 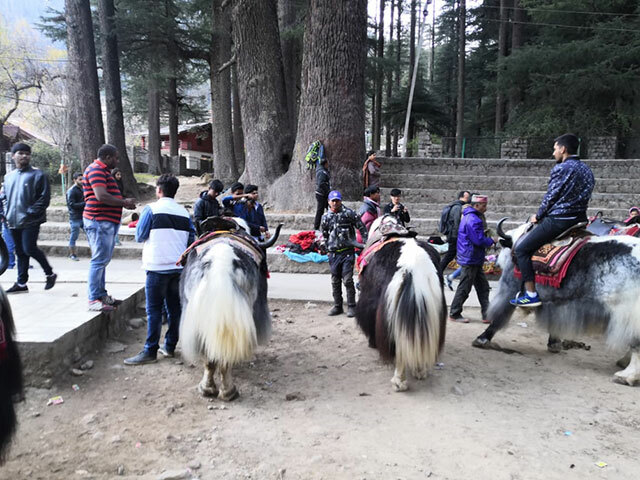 Where we did yak riding and got yo know about the history. 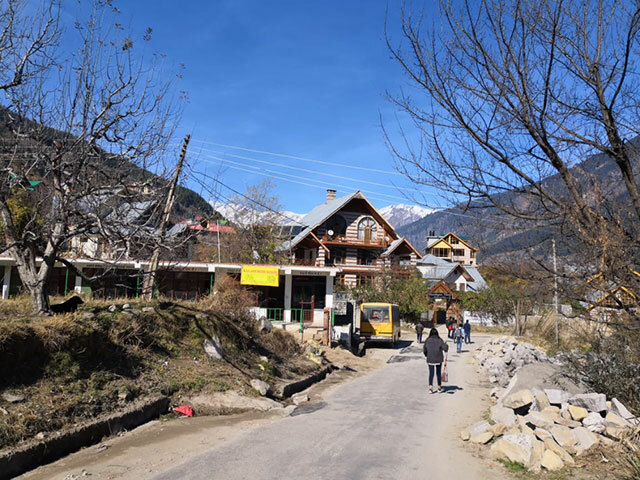 Afterwards we wend to mall road of Manali for shopping. 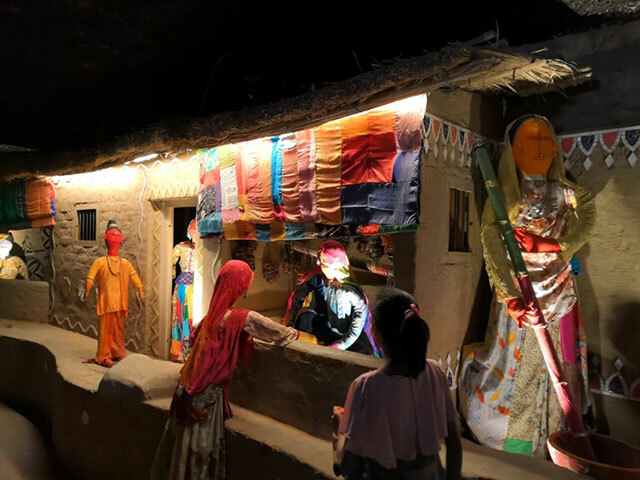 We found many local shops with different variety and many items made of woods and hand woolen shawls, muffler and others. Its good too see people are friendly and helpful here. 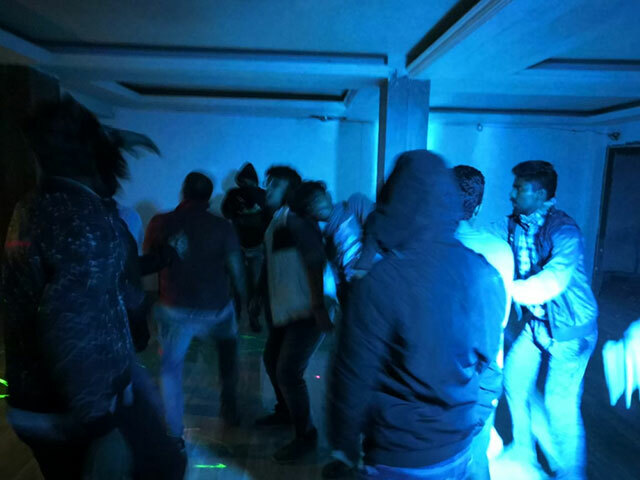 After returning to hotel we had DJ night arranged in hotel. 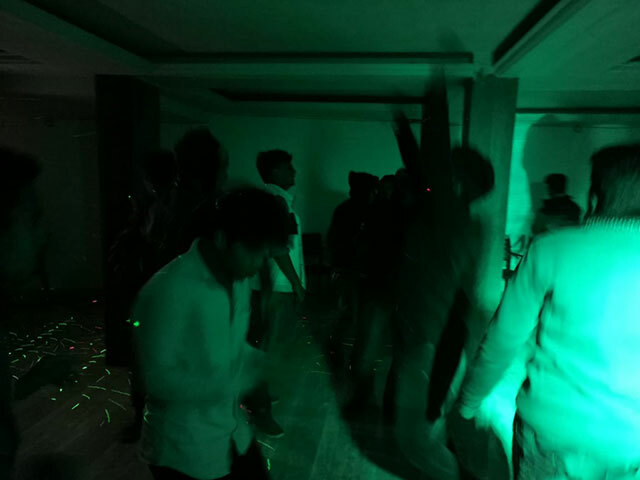 Where we dance and enjoyed. 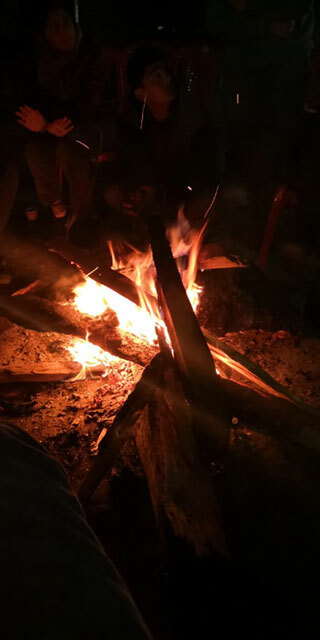 In night we had born fire. It was good to make us hot and also we played some games. It was indeed an immensely great experience playing with our college students. From Day 1 of the practice to the final match, it was great hard work we all did. 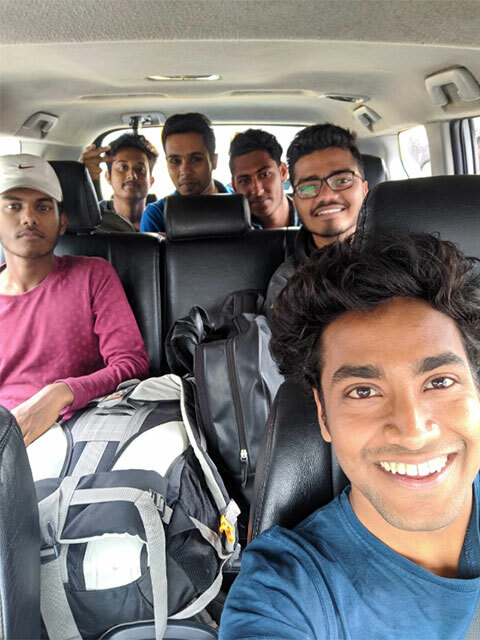 Though the practice was from 6:00 AM in the morning to 6:00 PM and make us really tired, we always looked forward to the next day to go for our practice session. Our staffs supported us so well at these times. 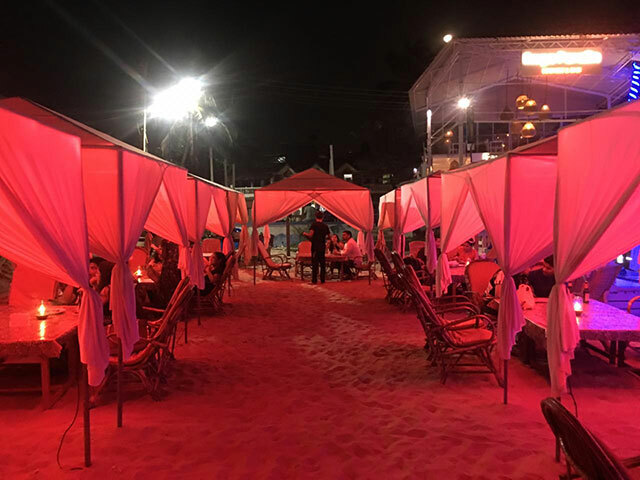 The most fascinating thing was the atmosphere of joy and happiness maintained throughout the event. Though we lost the final match there was not at all any scene of sadness, it was the excitement and satisfaction of being part of this tournament. 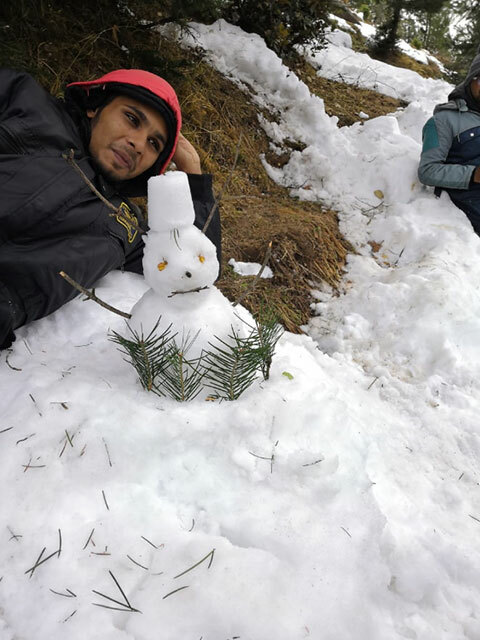 Today we went to snow point- "Gulaba" where we got to see and play with snow first time. 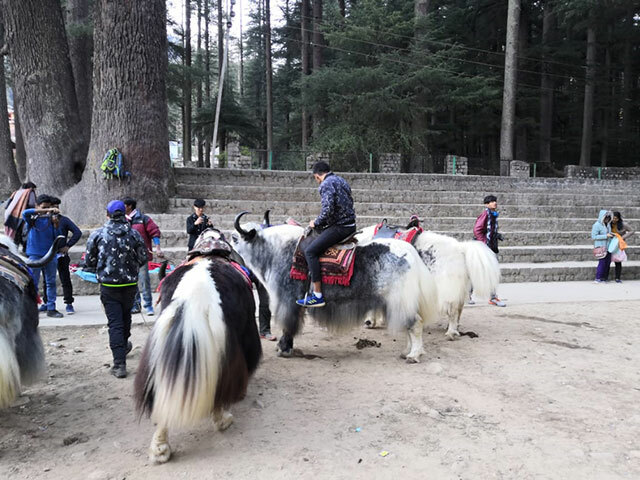 We did horse riding to travel up for some distance and then we did trekking. It was amazing experience. We made snowman, and played with snow. 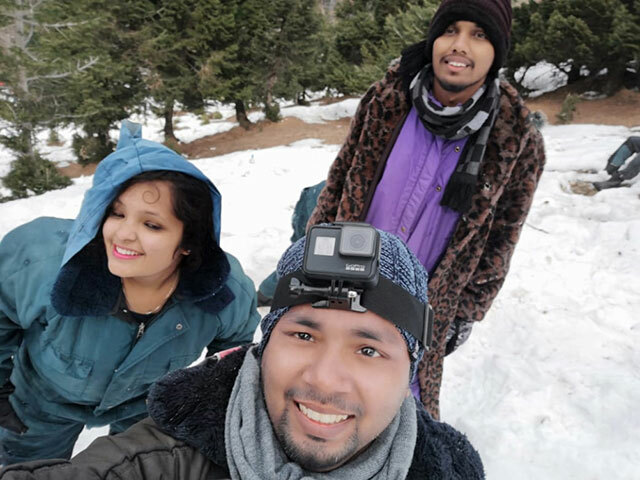 It was freezing temp but we enjoyed a lot. 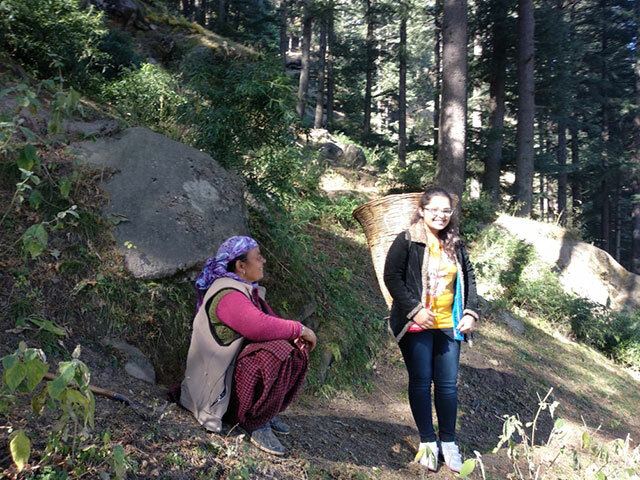 Interacted with the nearby people and got to know about their everyday hurdle for living. Lovely view and overwhelmed response from the locals. 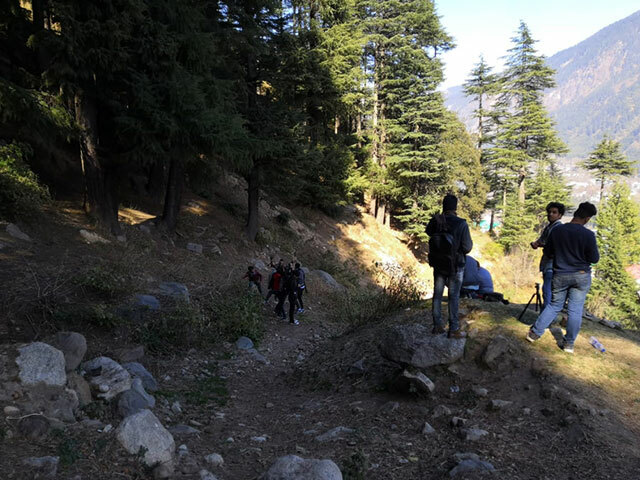 Long awaited day have come, we started our day with exploring manali streets observing their the way of living. Afterwards went for small trekking on Simsa mountain to visit temple. And to see the surroundings. What we saw is just jaw dropping. 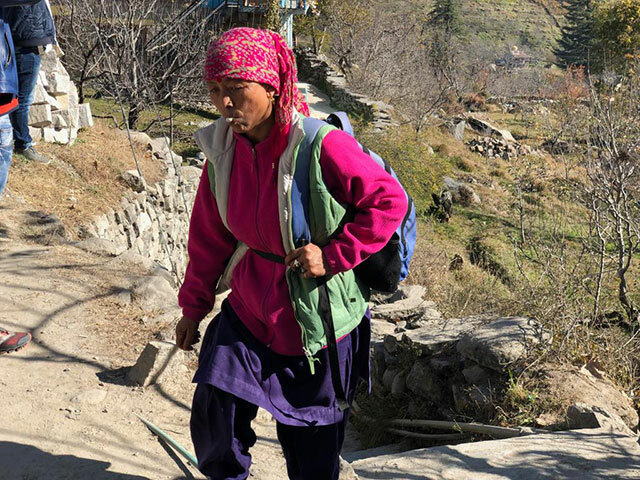 People here climb up the hill everyday for their everyday necessity, like for wood and other things. 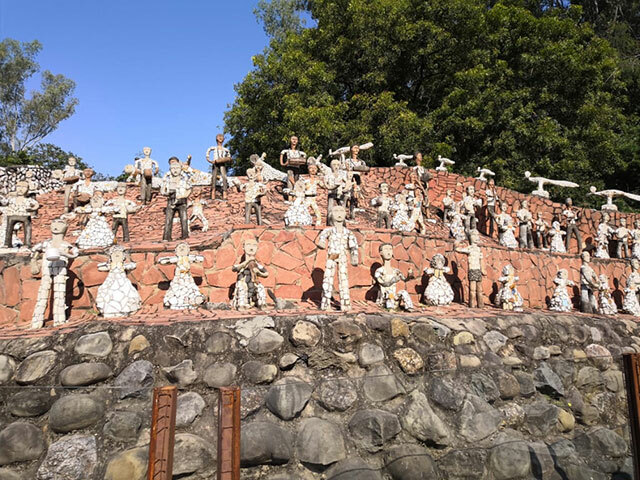 Today we went for site seeing and we visited Famous Rock garden- where everythings are made of broken household things like bangles, sockets, tiles. Site was such a beautiful and soothing. 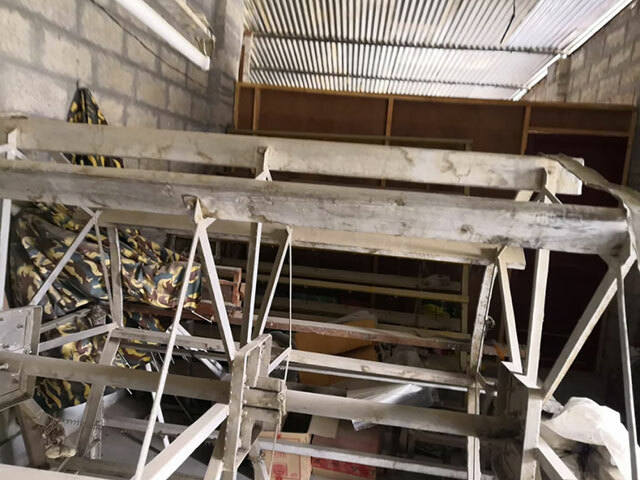 We would have not imagine that the things can be recycled after broking down also. It is as inspiration to us to see lovely abstract art forms. Finally arrived in delhi, now started journey to next point i.e Chandigarh, inroute had a wonderful lunch. its started getting cold. And the cool breeze is giving us the charm of better tomorrow. 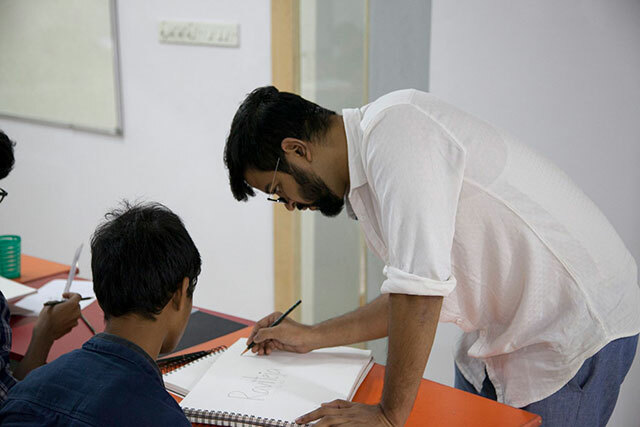 The seminar by Mr. Santosh Dhamdhame, Concept artist and 3D art lead at Pixelot labs, was indeed enlightening. I learned how this industry works and what the various prospects are in the future. I was thrilled by the methods by how I can update and upgrade my portfolios. The theory of colors and design in art was an enriching topic for me personally and he explained effectively. 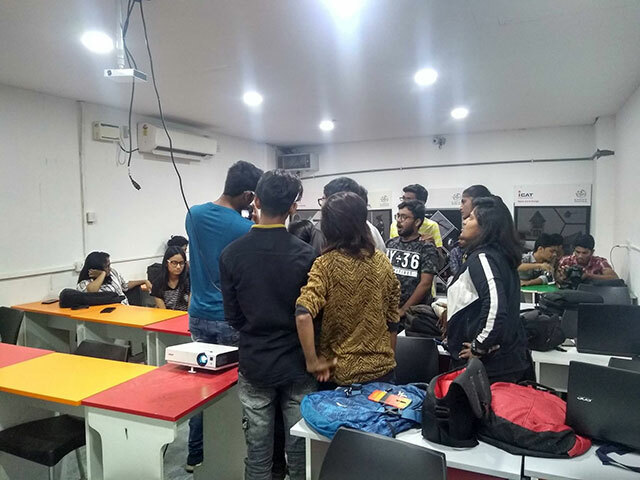 And most importantly, I learned that interpersonal connection and communication skills were crucial in this creative industry. Looking forward to more such seminars that update our learning. 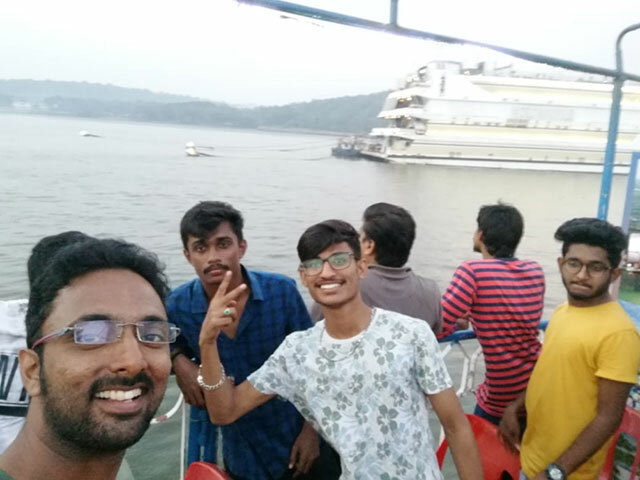 We started the journey on a big boat, having a capacity of 150 members. 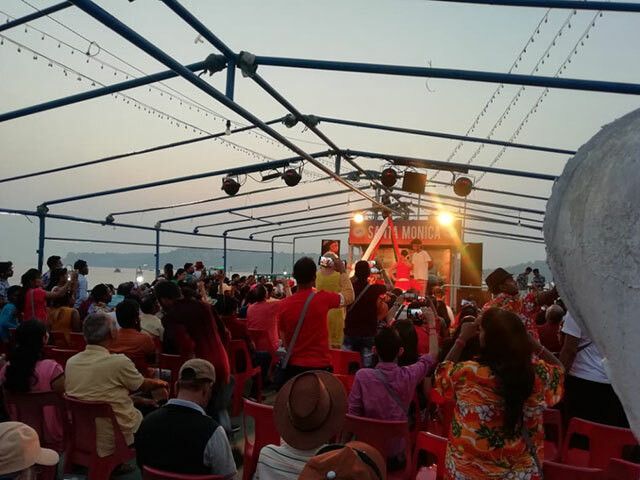 And to our astonishment, the boat was having stage and sound systems for various performances. 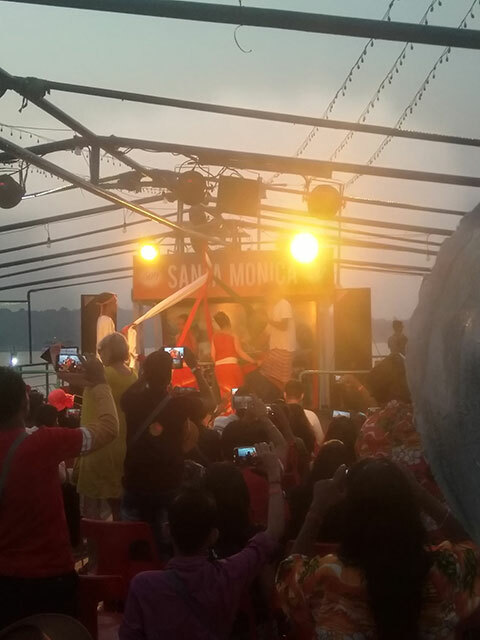 The boat was lit with beautiful lights and this added drama to the Konkani Tribal Dance performance. The silence of sea canal water was very soothing with cool breezes. We took lots of photos of the shore and the casino ships. Our boat went to the ocean and we returned after the late evening. The entire evening was very memorable and was surrealistic. 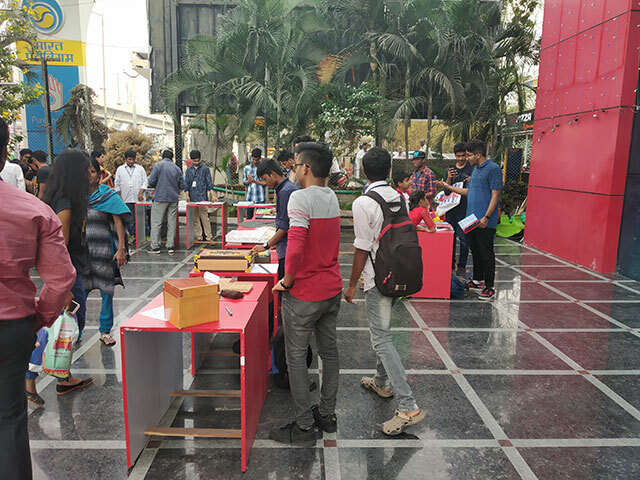 I had a wonderful experience in the Board Game Showcase when I showcased my very first game. 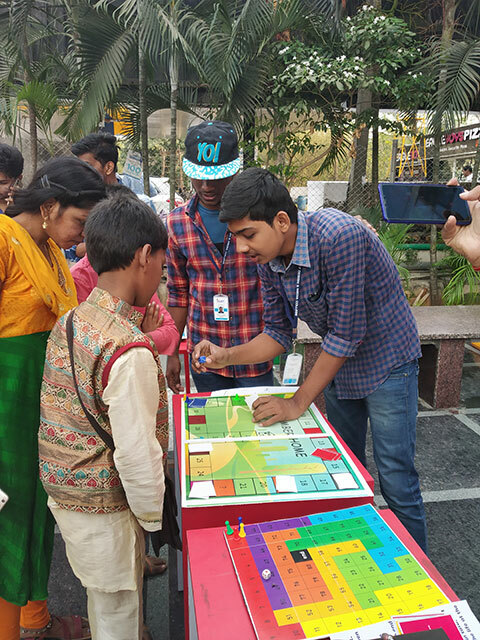 Initially, I was a bit uninvolved, but seeing the expressions of the kids who played my game really made my day and this is a memory I will Never forget. The event went on good, with awesome player involvements and good gameplay. Taking the reviews and seeing them rate my game was like dream come true. The funniest part was the small kids made their own rules and played the game according to their rules. Seeing how creative they can get with the given assets made the game maker inside me to think. 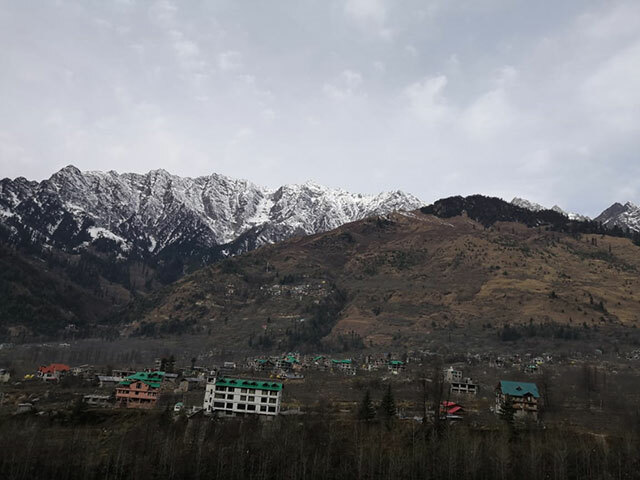 Finally much awaited trip is here. 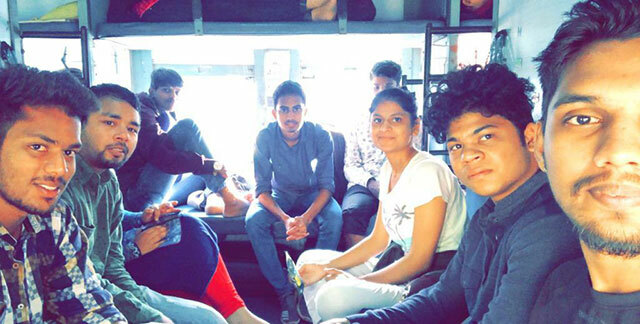 We started our journey from yaswanthpur at 1:45 through sampark kranti. We were full of enthusiasm and energy. 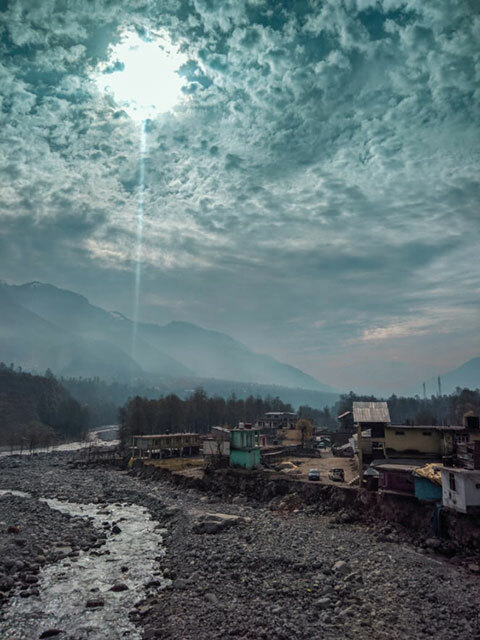 On the way we witness some breath taking view. 2nd day of Trip. 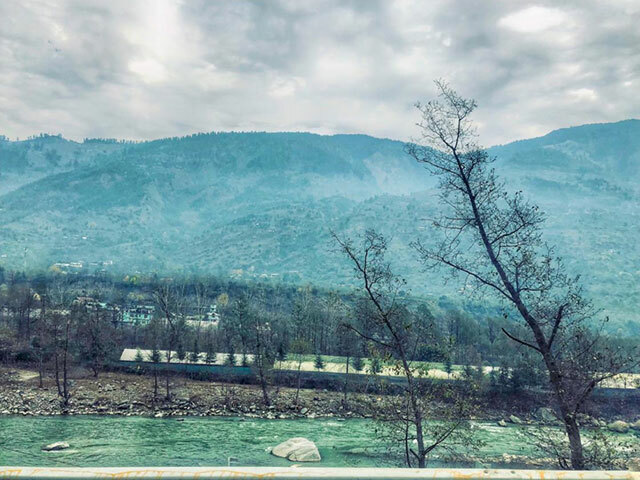 Still in train but the scenic beauties of surroundings are keeping us engage and making us to believe that what we are seeing is just a small bite. 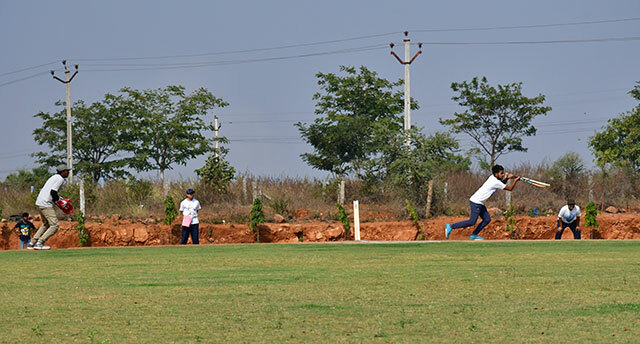 ICAT cricket tournament was held on 21st and 22nd of November 2018. 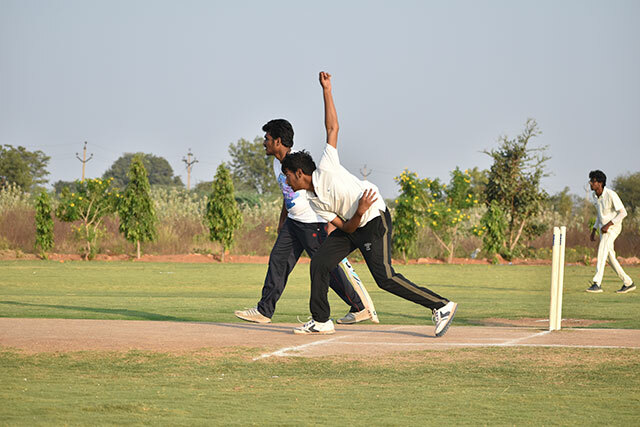 It is an annual tournament in which students take part with great enthusiasm and energy. As always, this time the tournament was a great success as everyone took part in it with a good sportsmanship. For me, it was a great step by our college every year. As we all know that our works are mostly brain work, a break to engage in physical activity along with everyone is a pure bliss. It helps to strengthen our bond with both faculties and students, helping us to know each other better. We as a team put lots of efforts for this tournament with the support of many people from various ends. Year 2 Media Technology of The Department of Multimedia and Visual Media won the tournament and lifted the trophy. Although I didn’t go for finals and win any trophy, this is still the best one for me. There are many games getting released every year but very few games created impacts on the industry, and the players. One such game is Nintendo's Super Mario Bros, a side-scrolling platform game, which came to life in 1985 and still holds a profound value in the subject of Game Design. The level 1 of world 1 in the game is still considered as one of the best iconic levels in the history of the gaming! Let's dive deep into the level design and user experience of the game. The Super Mario Bros is a game that has no tutorial, which is a common, rampant thing in the present games. And this is one of the reasons I like playing this game. No one teaches the game, but the player learns how to play the game by progressing in the gameplay. The Gameplay is simple yet clever. Move Right. That's it. 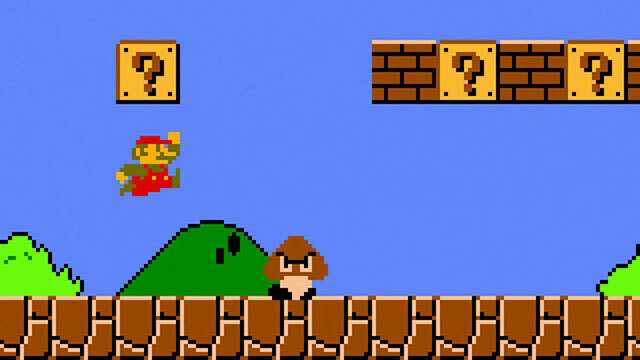 For the player to get this mechanic, the game provides a negative space onto the right side of the screen placing the Mario on the left side. 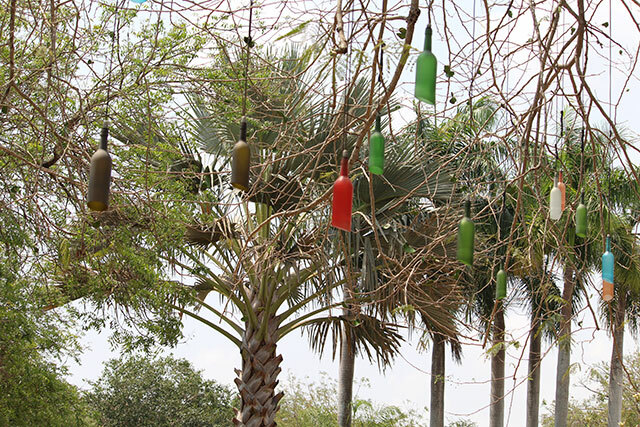 It encourages the player to play with the objects onscreen, interact with the surroundings. When we touch the enemy "Goomba", we die. After we die for the first time, we will come to know that we should avoid it. I still remember that I tried to jump over the enemy, but landed on the enemy killing it. So I got to know about that killing mechanics. Jumps were planned in such a way that players would be intrigued by the question blocks, tap them, and discover surprises. Even if the players try to run from the first mushroom, they built the level to make it hard to escape, so that the player would hit the mushroom, Mario would get big, and they'd understand something new about the game. We get the ability to destroy the bricks which we didn't have before! I rarely find such games which are filled with the ambition to make the players explore the mechanics and learn on how to play the game. For such reasons, I name Super Mario Bros as one of my favorite games. 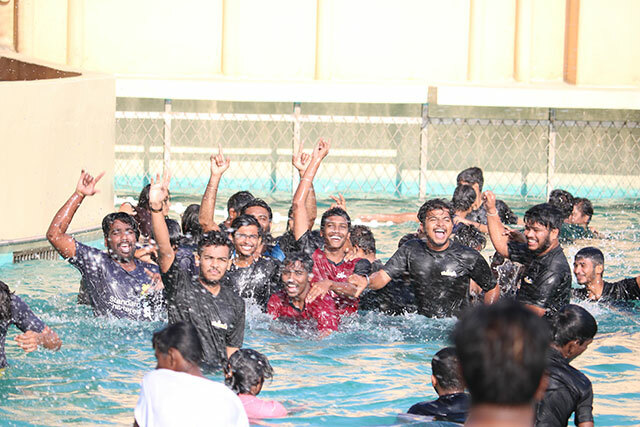 To our great amazement, the place we decided to visit was one of the most fun-filled places - WONDERLA Amusement Park. 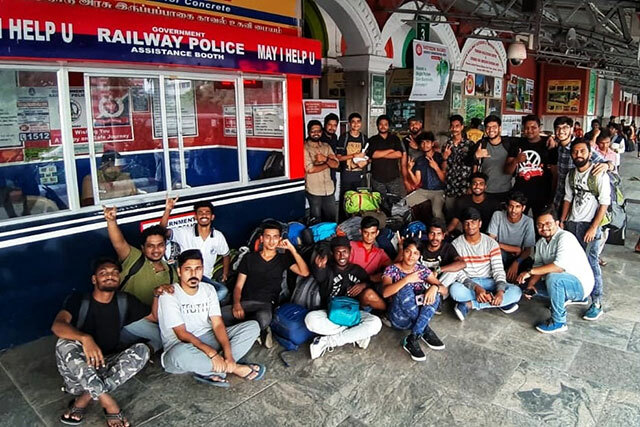 We couldn’t hold back our happiness and thus the journey was full of melodies and few quirky steps for some perky tunes. My first ever experience with the Equinox (high thrill ride), a giant pendulum, was really a heart throbbing experience. The crazy cars were one of its kind, the dashing bashing game was quite fun. Followed by the termite coaster, techno jump, etc. were the loudest screaming experience. The Waves pool and other water ride added fun to the great experience. The laser projections of a galaxy experience in a spaceship amazed me to the core. 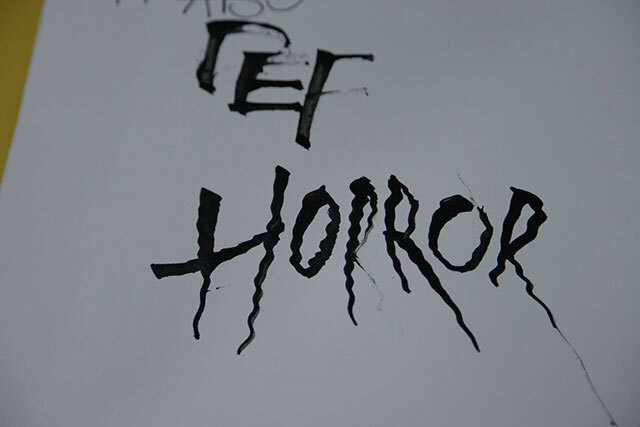 The dark room and that beautiful screening still flash my mind. After getting out of the interstellar zone, the world seemed quite new to me. We didn’t take many Selfies or photos, but this experience will still be cherished forever in all of our memories. 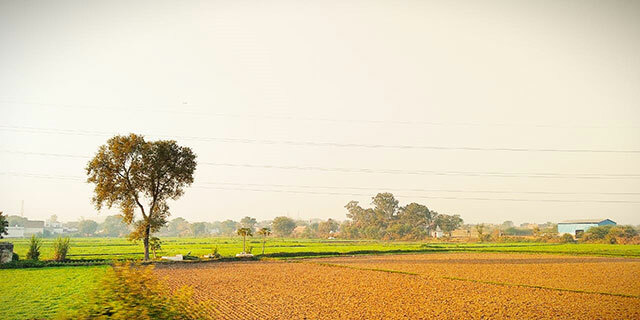 On our way back to home those happily tired faces around me reminded the contented smile on my face. 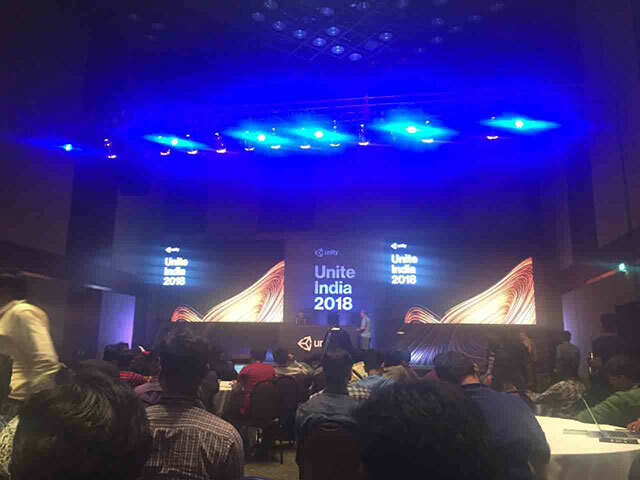 I attended the seminar on Gameplay programming for Unity by Mr. Yogesh Rathod on 16th and 17th November 2018. 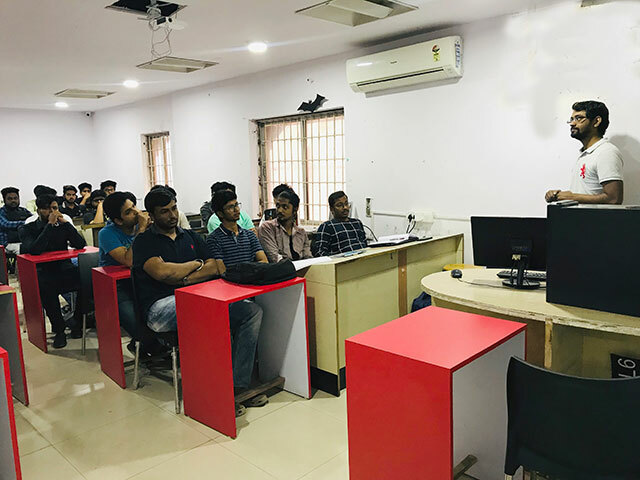 Mr. Yogesh Rathod, who is a Lead Game Developer at Holodeck studios and an ICAT Alumnus, helped the students to understand the logic behind several codes related to game physics and game mathematics. If anyone needs to be a good programmer, that person should have a good understanding of Physics and Mathematics, combined with Logic. 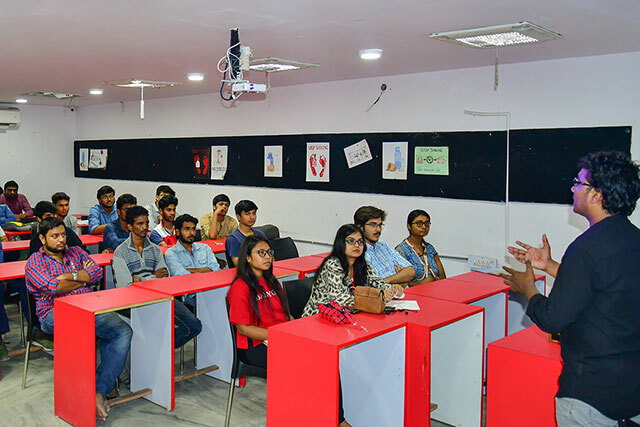 Mr. Yogesh shared his experience with us on the industry, people and growth. 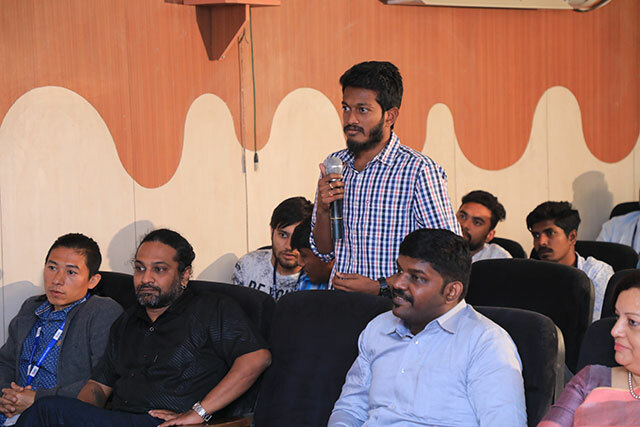 In the QnA session, he answered all the queries patiently. 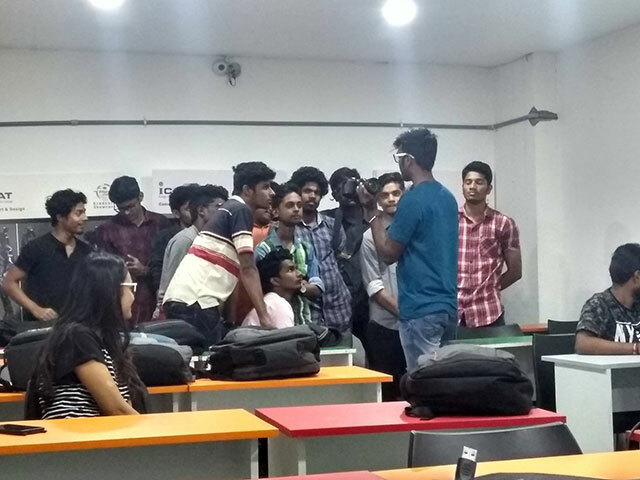 His next session in the campus is already planned and I am looking forward to that. 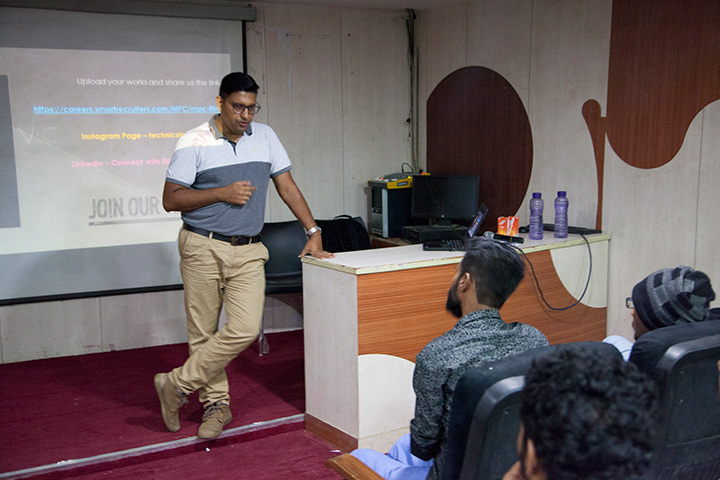 This workshop by Mr. Srikumar gave me a complete insight into the ideation process. As I was already familiar with many of the important techniques of ideations, I was able to understand what the speaker is conveying to us. 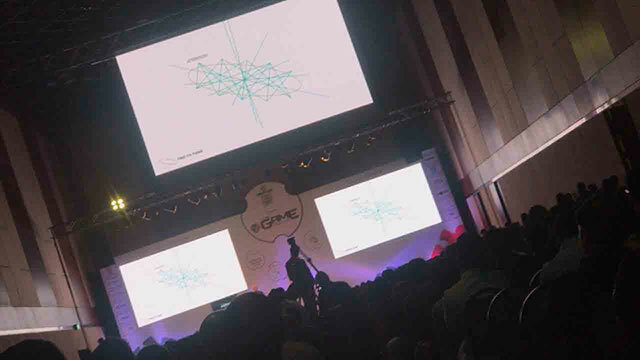 Mr. Srikumar explained how a raw idea can be conceptualized into a game, through iterations. When we break any game into its very basic idea, those ideas seem to be simple like plumber rescuing a princess, a bird is attacking a pig, a graffiti artist is chased by a police, etc., The speaker told us the importance of Design Document and made us write a document for an existing game. 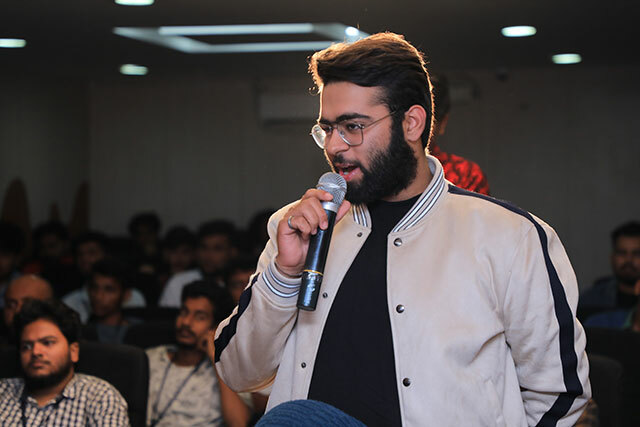 He advised us on freelancing and startups, Indie game development which always excited me and this time, it made me think about my career opportunities. This session, as a gamer I can say, is a 'Level-Up'! 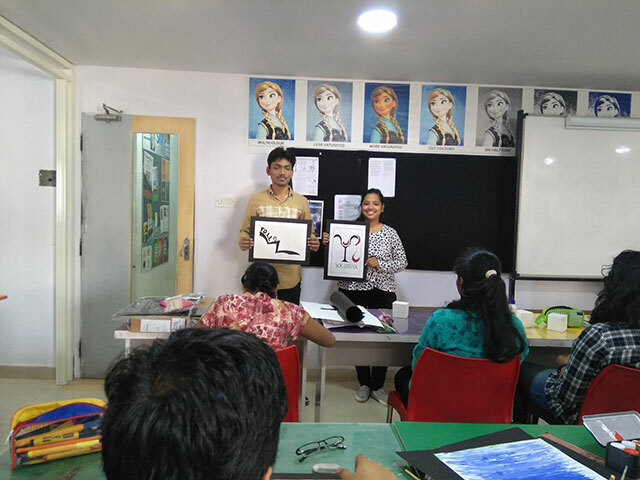 The workshop for visual thinking with Mandira ma'am was fun. With the play book she made me realize that we think very simple in the start and them when we take baby steps we discover more than what we started of as, this way we make complex designs easier by thinking clearly. 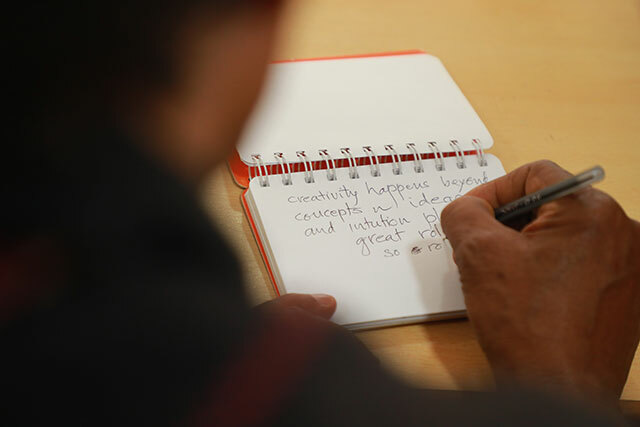 Thus it helped us in coming up with great ideas and exploring ourselves too. 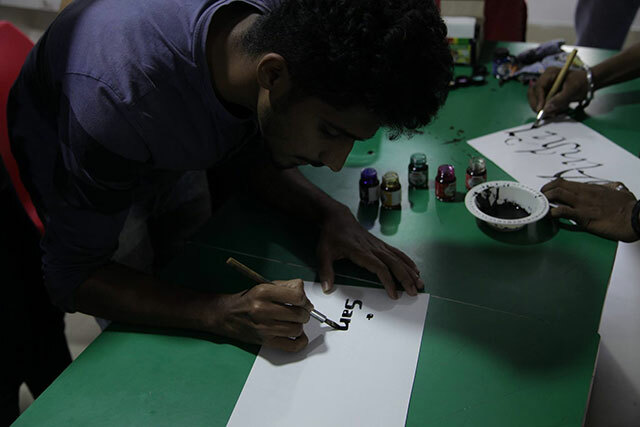 For me calligraphy was the best workshop conducted in our college till now. I got to learn more about myself through this. 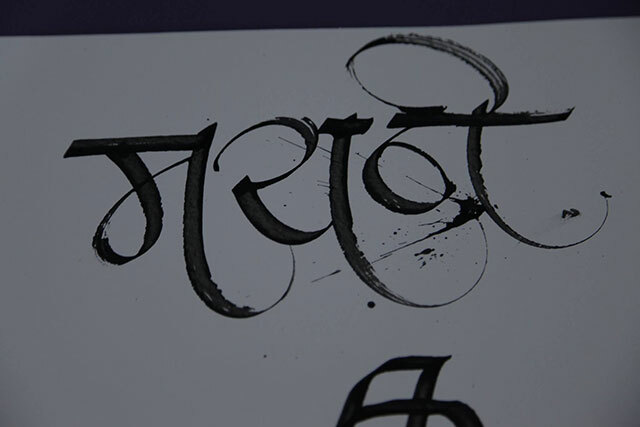 Through Sudeep sir's guidance I learnt various styles in typography. He helped us a lot in getting a good output from us. It was even fun working with my classmates and exploring their works too. But we still have a long way to go and I hope we all get through together. 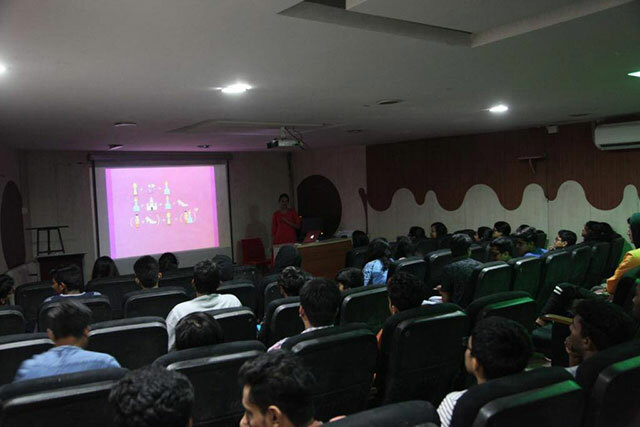 The seminar we had on animation was really interesting. 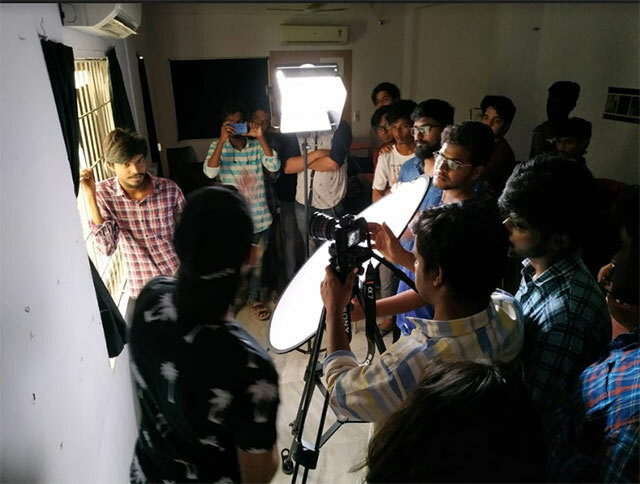 Arun sir showed us how pre production and production is done, the process behind each step and the thought process and the amount of effort that goes into each frame/shot. 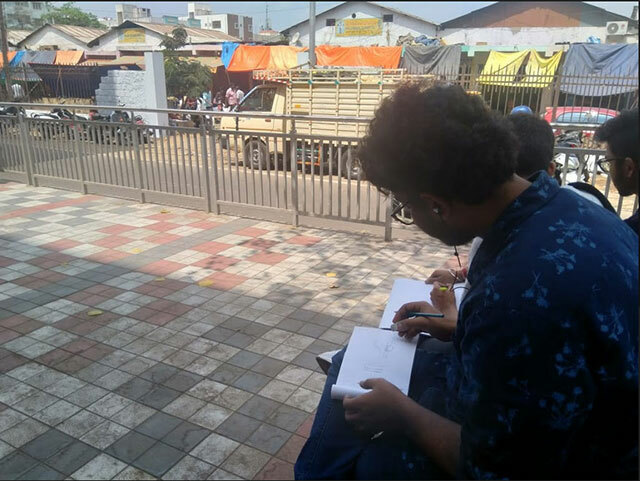 we also learnt that we don't need fancy or high-end equipment to make an animated shot instead we can use the materials around us and a simple mobile camera. the most important thing we learnt is that we need a lot of patience because some projects need months to finish and the only way it can be achieved is by having patience. overall the seminar was a good exposure to the industry and the current technology being used in the companies. It was amazing experience. It was made clear about how to approach towards portfolio and showreel. Breakdowns of the movie were explained properly. It was much awaited seminar and really glad it came to us. 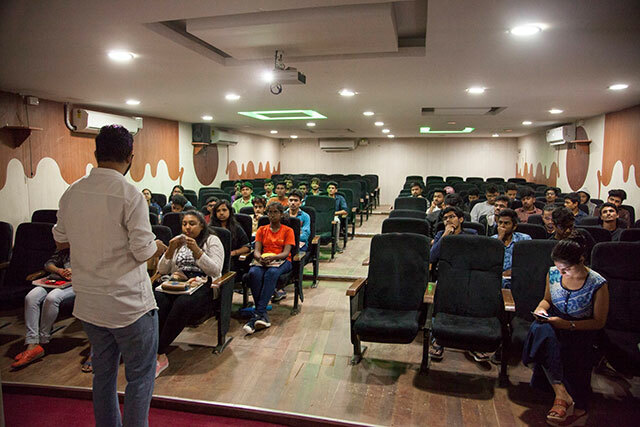 We got to know about how industry actually works and also how much discipline and passion takes to get into the VFX Industry. We also learned new terms which we didn’t know before. It was truly amazing experience that’s all I feel about seminar. It was an eye-opening seminar for us. 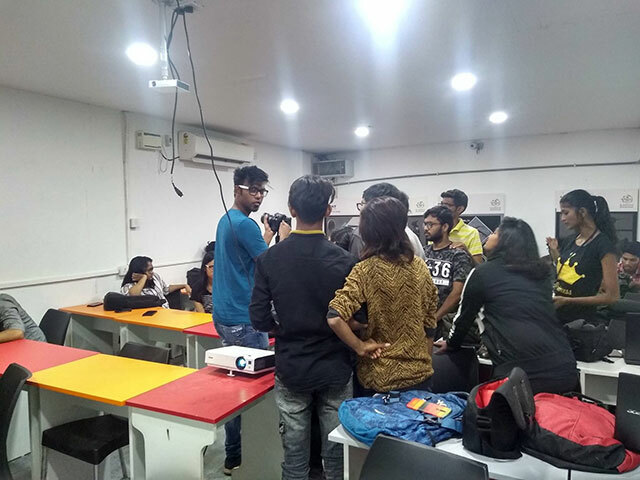 As we are 2ndyear students we were confused about what to do and how to approach the industry. It gave us full insight about the industry. How we should approach to studies and to do experiments as we are students. Very good session done by Dijo sir. 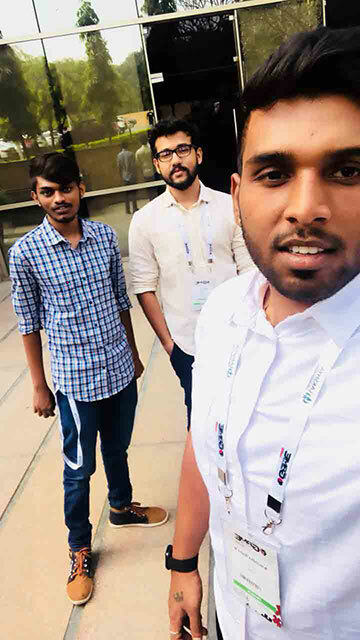 It was pleasant experience to know A to Z about the industry. 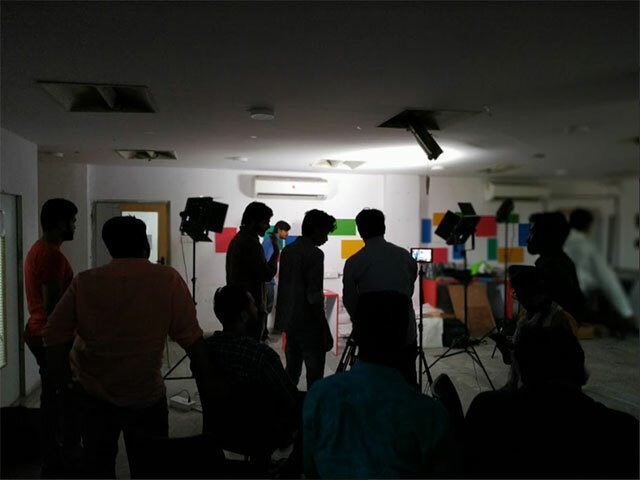 We got to know about the how foundation helps in VFX. He also mentions not to take any shortcuts if we want a bright future. 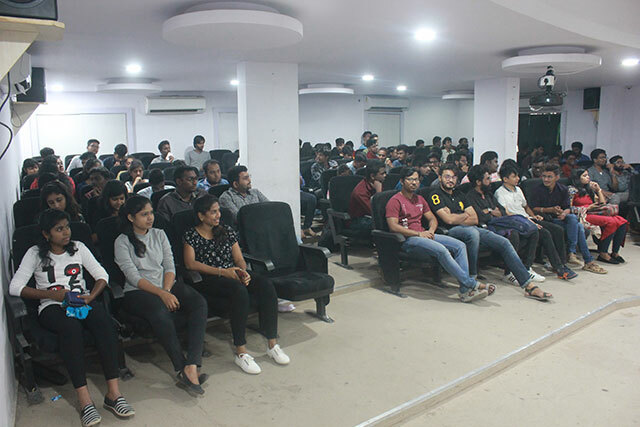 An industrial talk was held on 21st September. 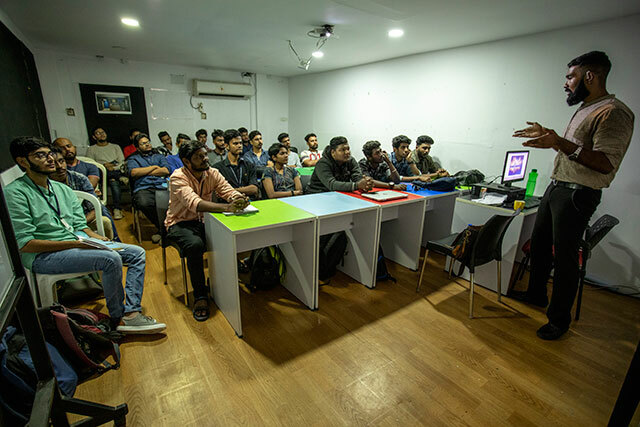 We got to know about what actually VFX is and what all qualities are needed to be good VFX artist in our respective field.